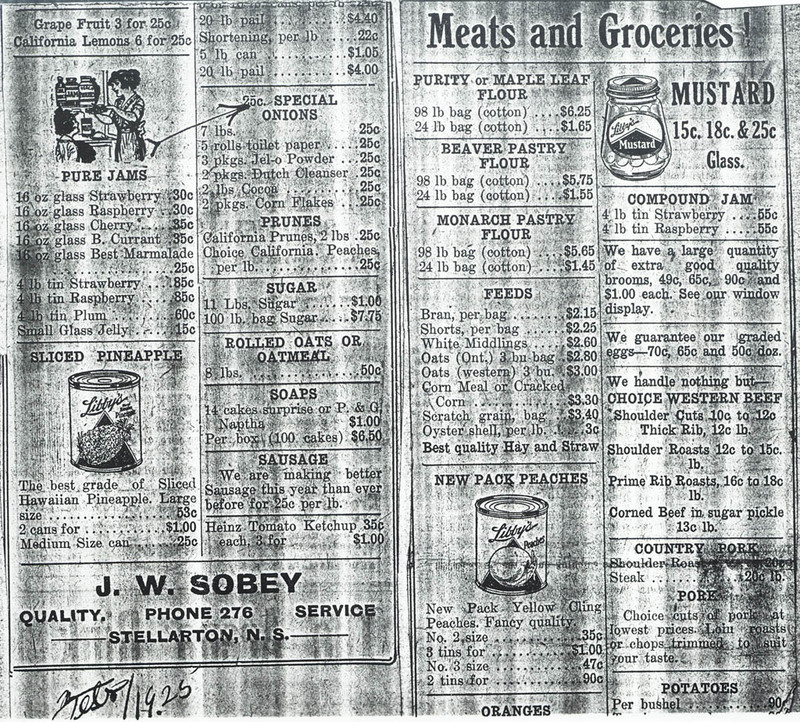 Scroll down to search 110 years of Sobeys history. 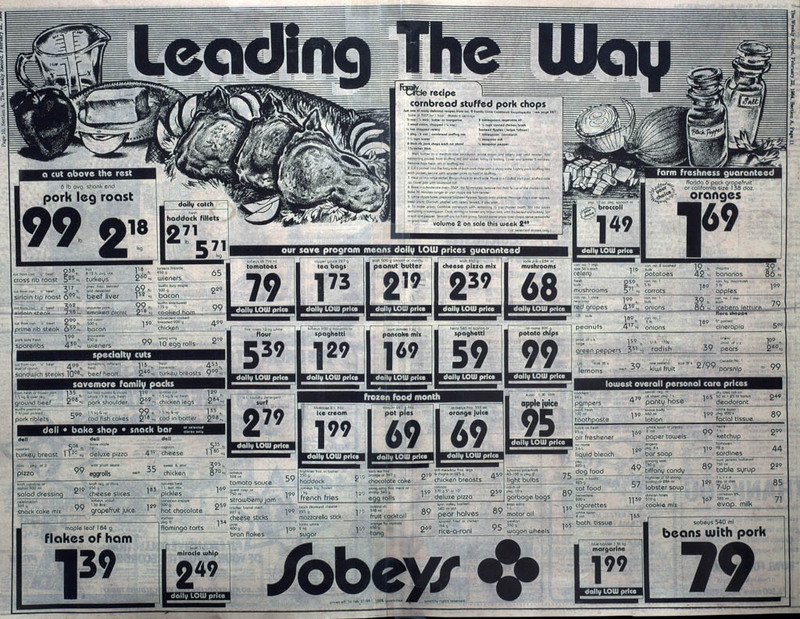 Or use the menu in the top right corner to jump to a specific decade or Sobeys milestone (in green). 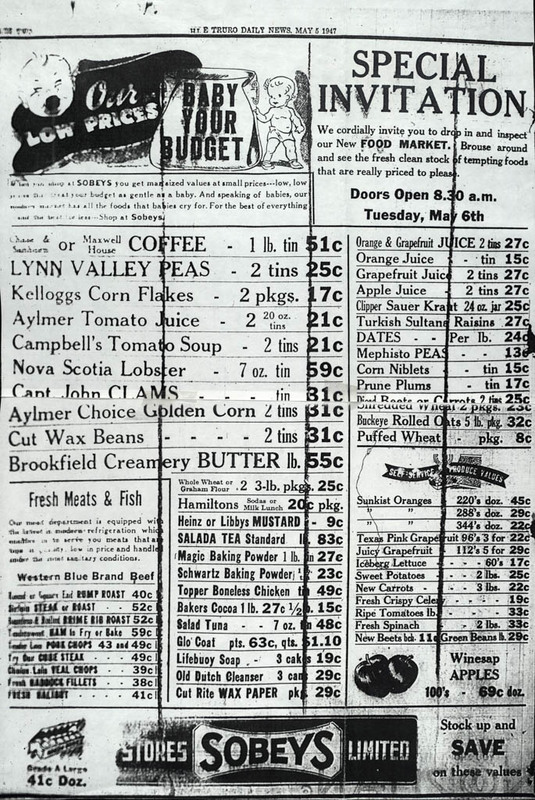 Discover what was happening in Canada that same year by clicking on the maple leaf icon. 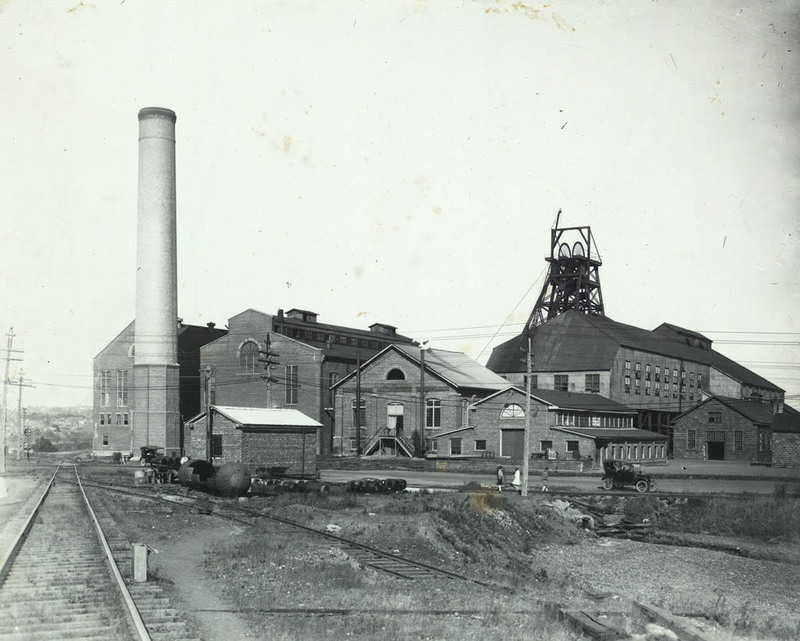 The largest gold strike of the Cariboo Gold Rush is discovered on Williams Creek in B.C. A group of 150 settlers leave Ontario in search of gold in B.C. After a resupply stop at Fort Edmonton, the group makes the trek across the Rockies. British Army Sergeant William Sobey & Pictou County native Janet MacIntosh marry in Halifax on September 21. The original Parliament Buildings in Ottawa, designed in a Gothic Revival style, open. 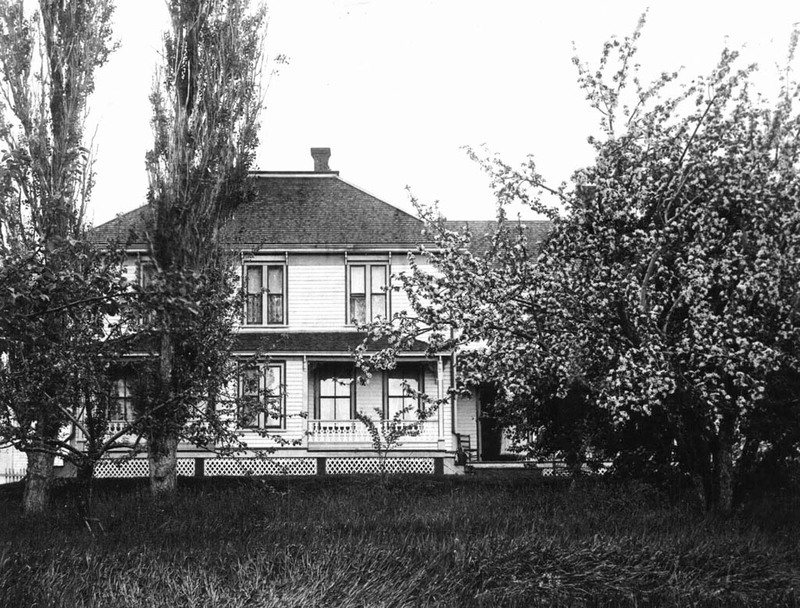 The buildings were destroyed by fire in 1916. 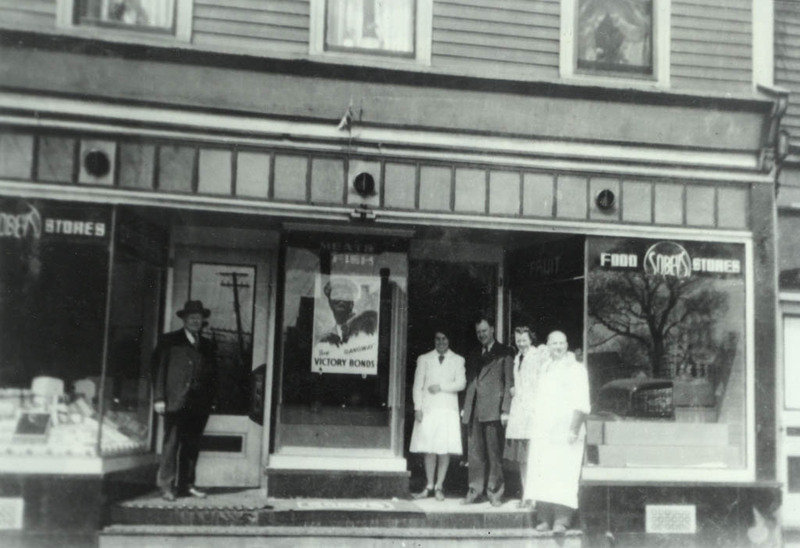 Early pharmacies open in Halifax, which are early ancestors of Balcom-Chittick and later the Sobeys group of pharmacies, Lawtons. 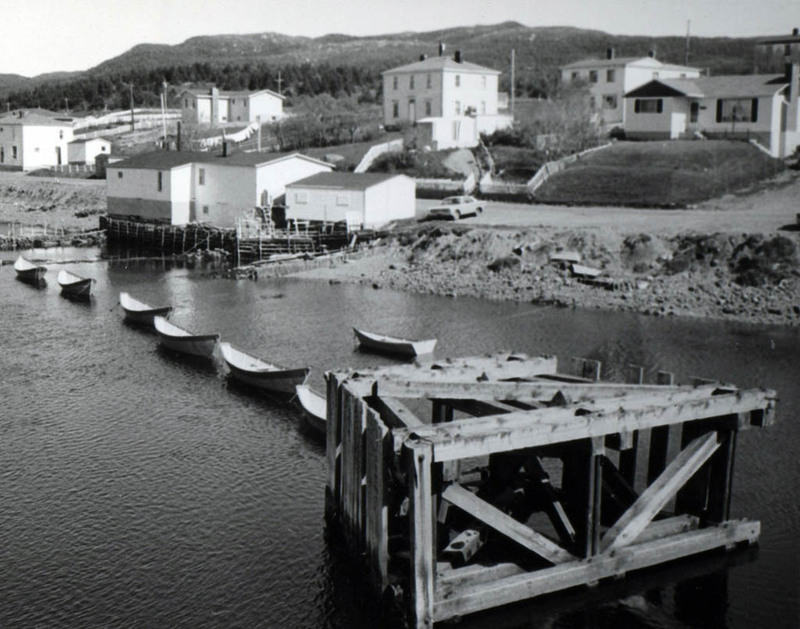 The British North America Act creating Canada sparks controversy on the East Coast. 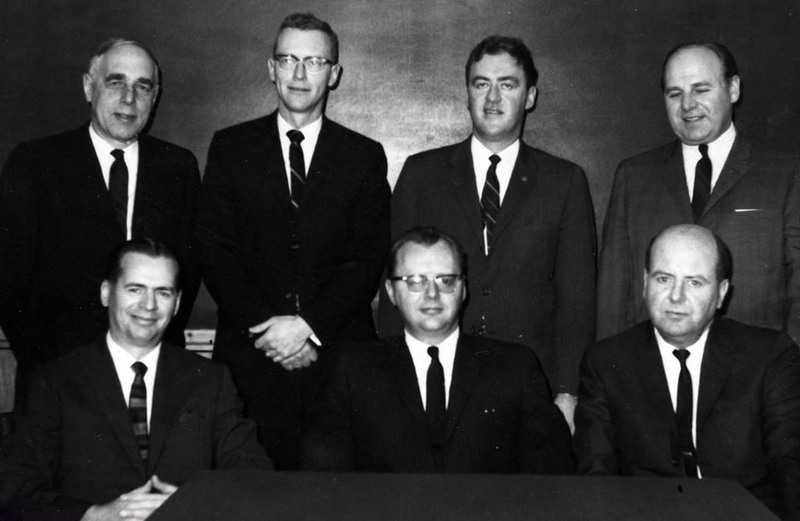 The four original provincial jurisdictions exclude women from full citizenship rights. John A. Macdonald is Canada’s first prime minister. 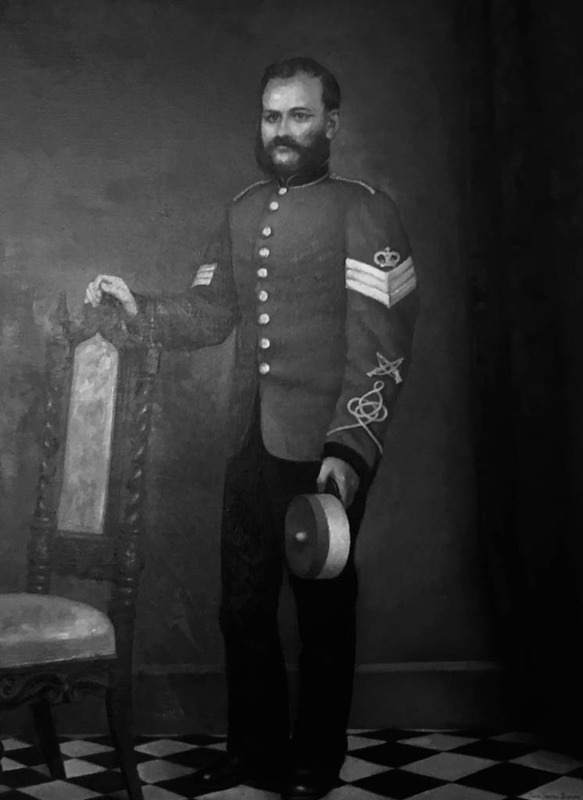 Confederation was controversial in Nova Scotia. 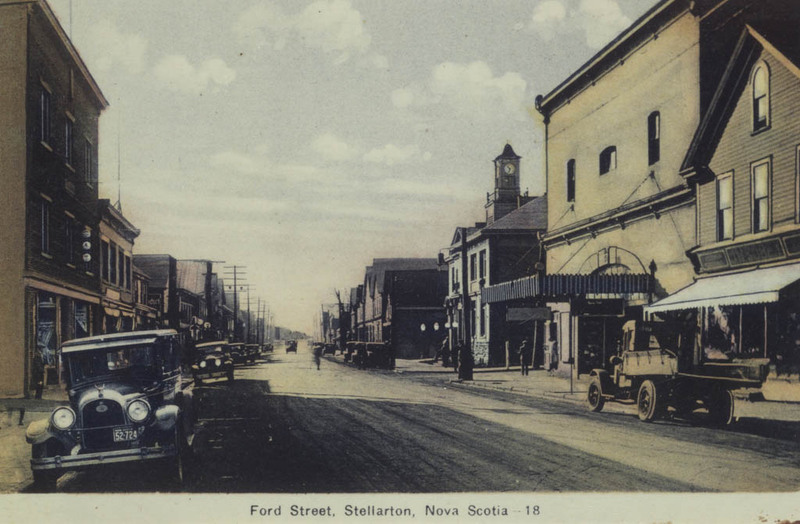 Fist fights broke out between Anti- and Pro-Confederation pugilists.The Eastern Chronicle ran the province’s death notice and only one of Nova Scotia’s 19 MPs to the new Dominion parliament was pro-Confederation. 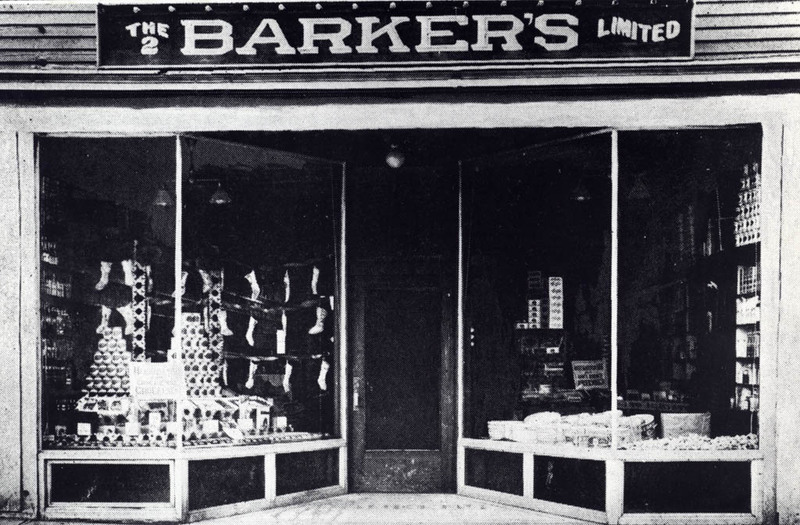 Timothy Eaton opens his first store on Toronto’s Yonge Street. 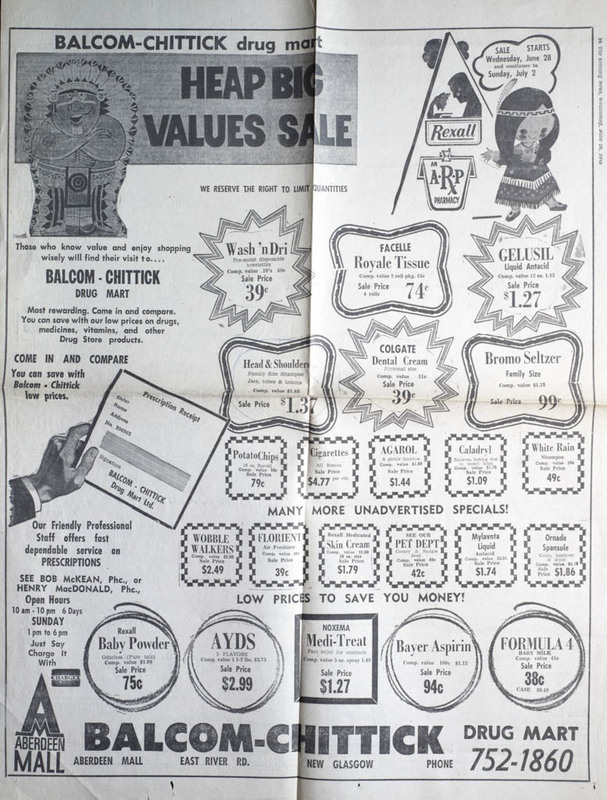 Eaton’s was one of the first stores to reject credit, preferring cash-only sales. 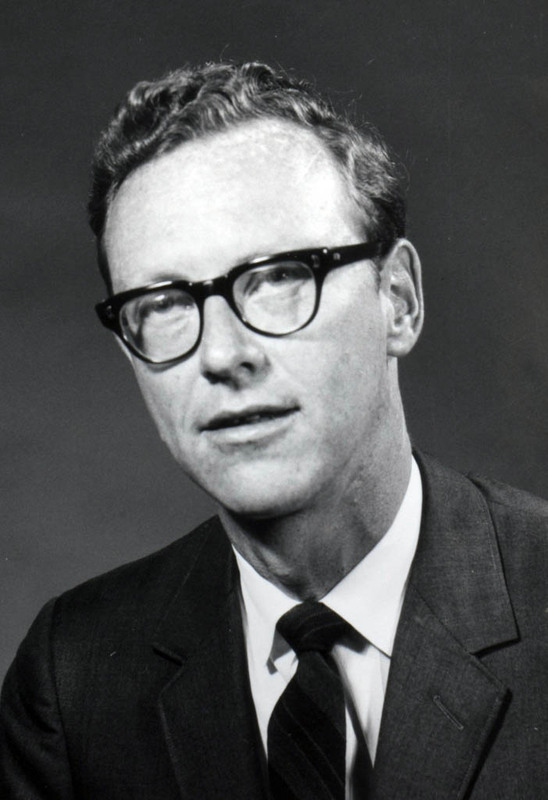 John William (J.W.) 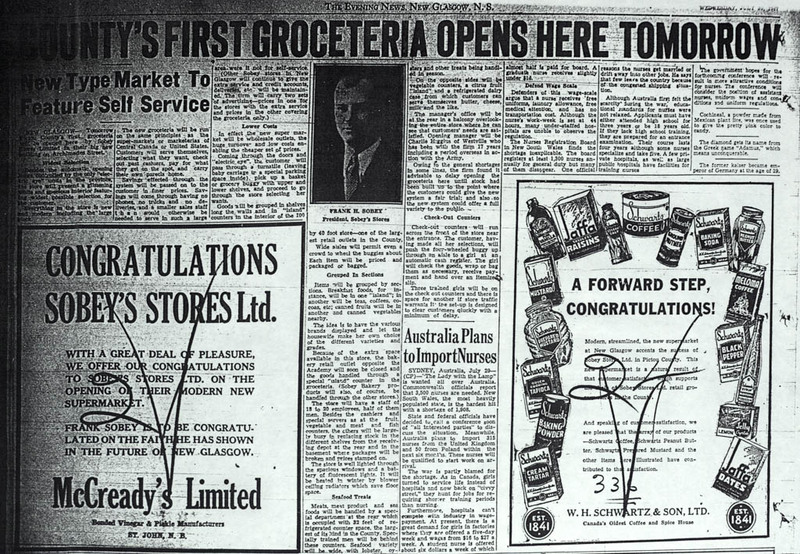 Sobey is born in Aldershot, England, third child and first son to William and Janet, and the future founder of Sobeys grocery store. First dominion census fixes population at 3.7 million. 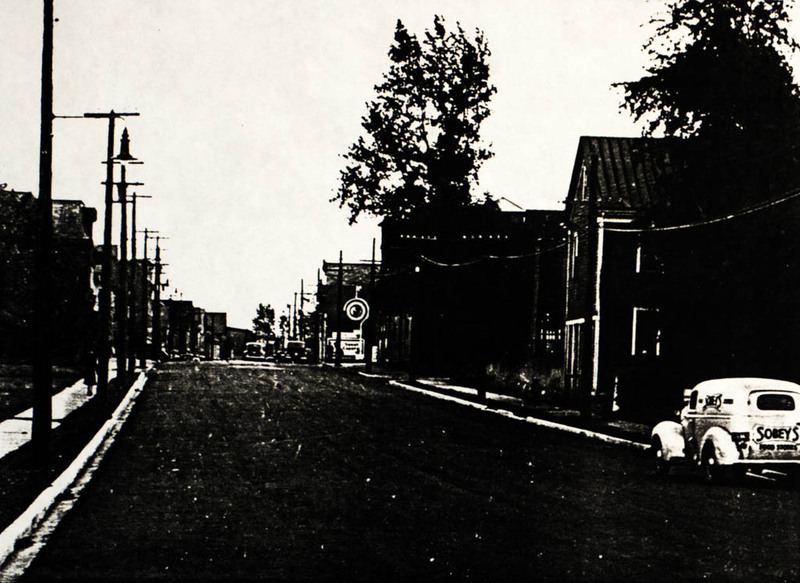 British Columbia enters Confederation as the sixth province. 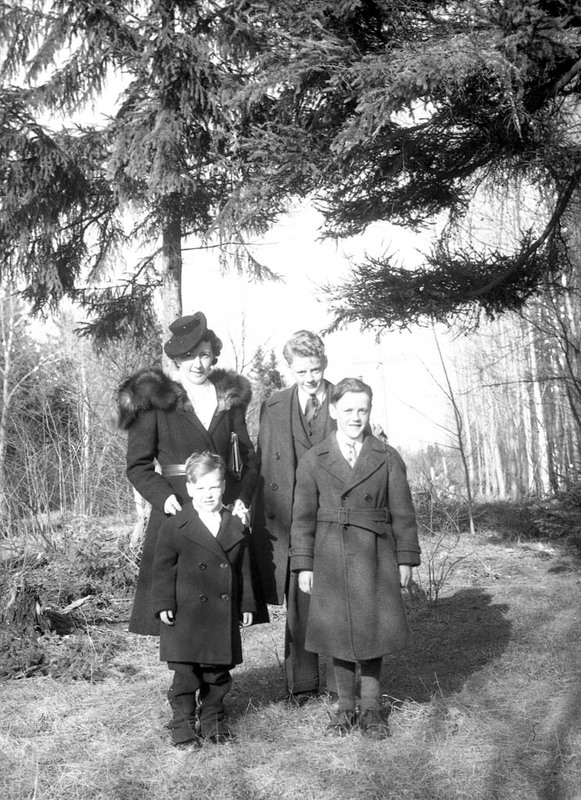 Sergeant William Sobey is posted to Bermuda, with wife Janet and four children. The young family grows, with two more children born on the island. Sir George-Étienne Cartier, one of Confederation’s greatest champions, dies, as does one of its greatest opponents, Joseph Howe. Prince Edward Island enters Confederation as Canada's seventh province. 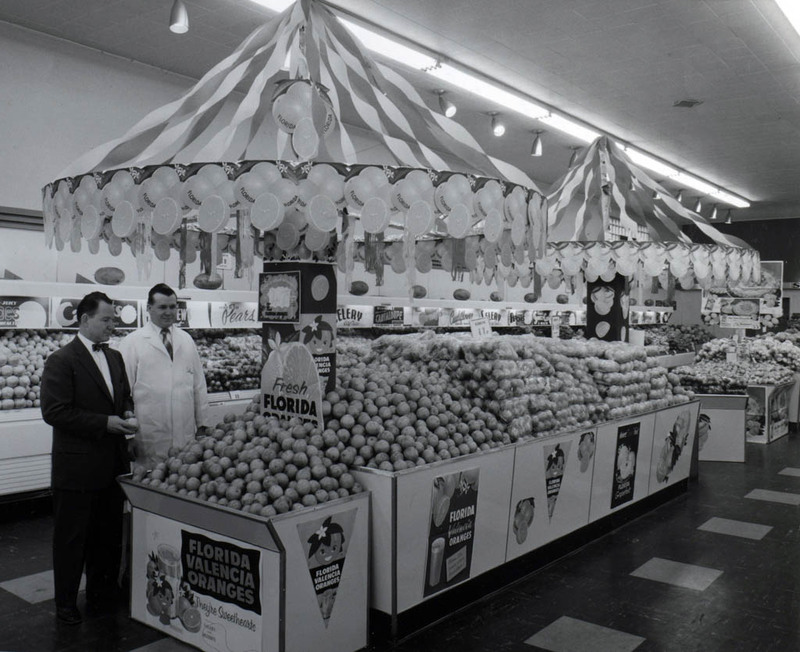 In Montreal, Firmin Hudon starts as a produce and grocery trader, planting roots that would grow into a Quebec IGA and later Sobeys chain of stores. Alexander Graham Bell speaks the first words ever heard on the telephone and later makes the first call from one building to another at Mt. Pleasant, Ont. William Sobey and his family leave Bermuda for Nova Scotia, where William is discharged from military duty on Boxing Day. The Canadian government met with Crowfoot and his fellow chiefs to discuss the future of the Plains Natives. After some disagreement a treaty is signed. 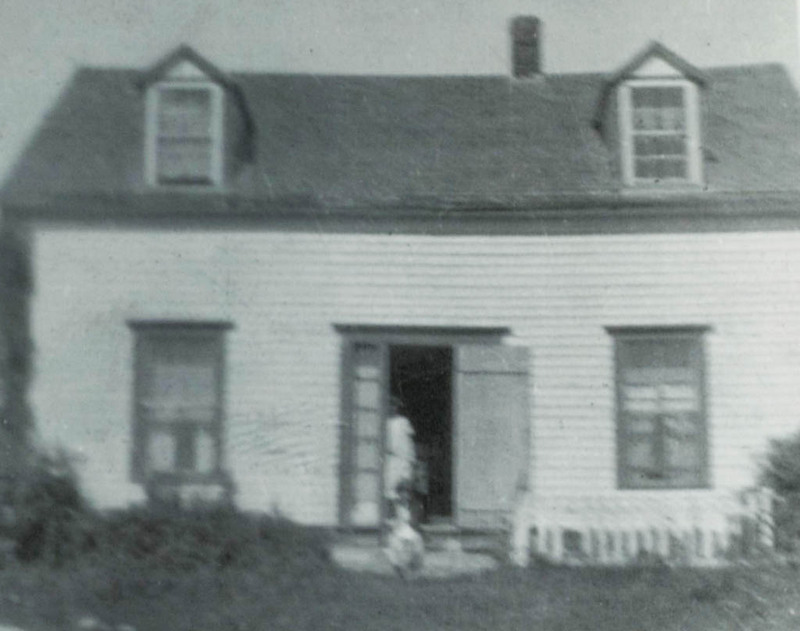 William and Janet Sobey and their six children settle in Lyons Brook on 120 acres and build the family’s first home in Pictou County, Nova Scotia. 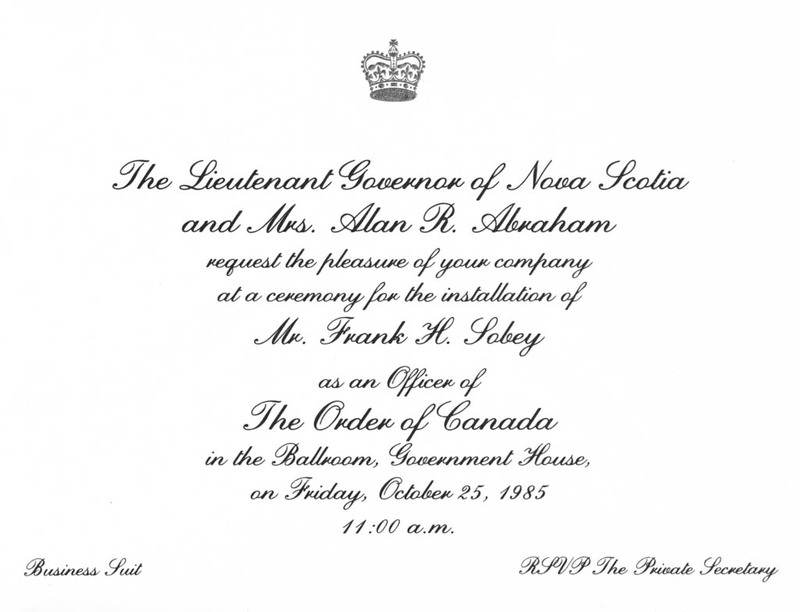 O Canada is first performed at a banquet attended by the governor general, the Marquis of Lorne. The Royal Canadian Academy of Arts was founded by the Marquis of Lorne. J.W. is brought up in the Scottish tradition of his mother, Janet: loyalty, self-reliance, frugality, industry, neighbourliness, social responsibility, community service and a belief in education. 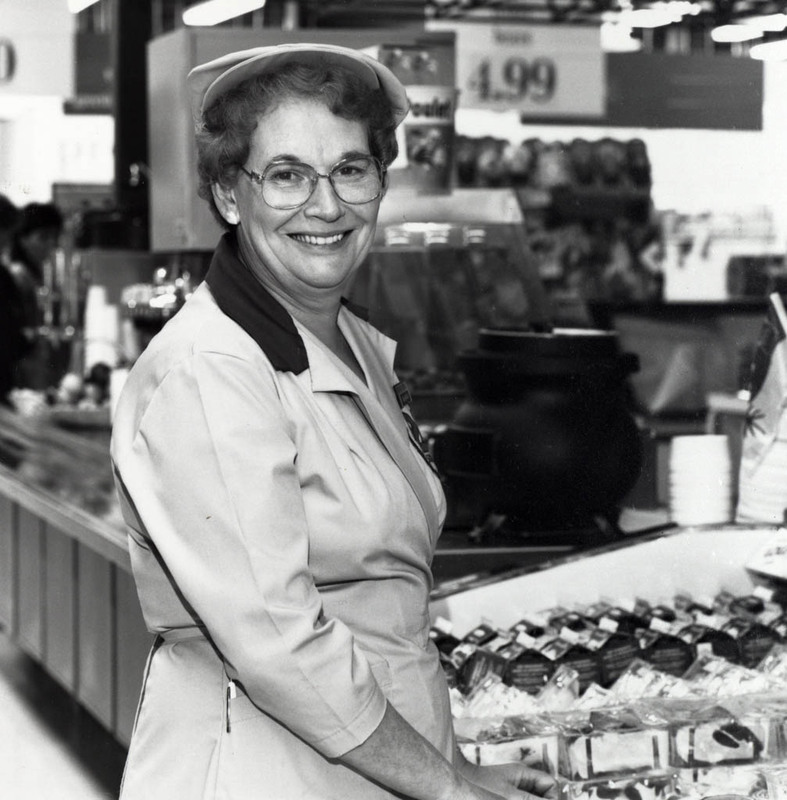 These values have served Sobeys and their employees well for more than a century as the foundation of the family business culture. 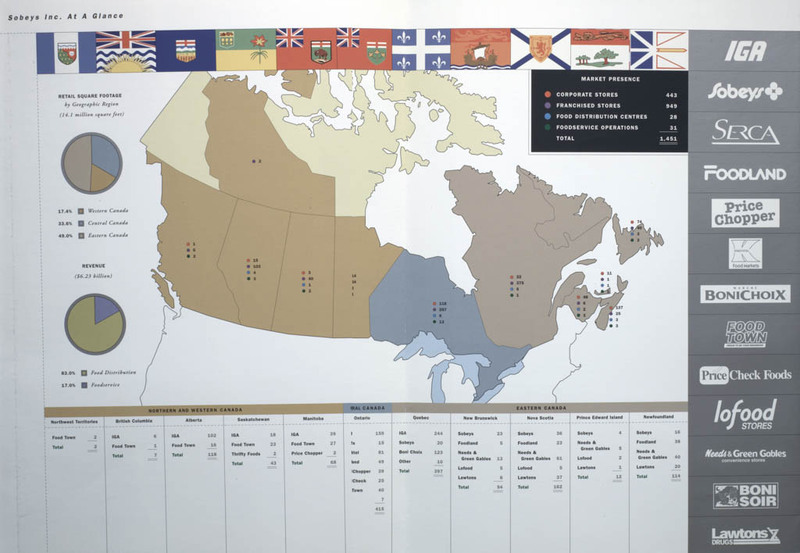 Former Hudson Bay land is divided into four federal districts - Alberta, Assiniboia, Athabasca and Saskatchewan. 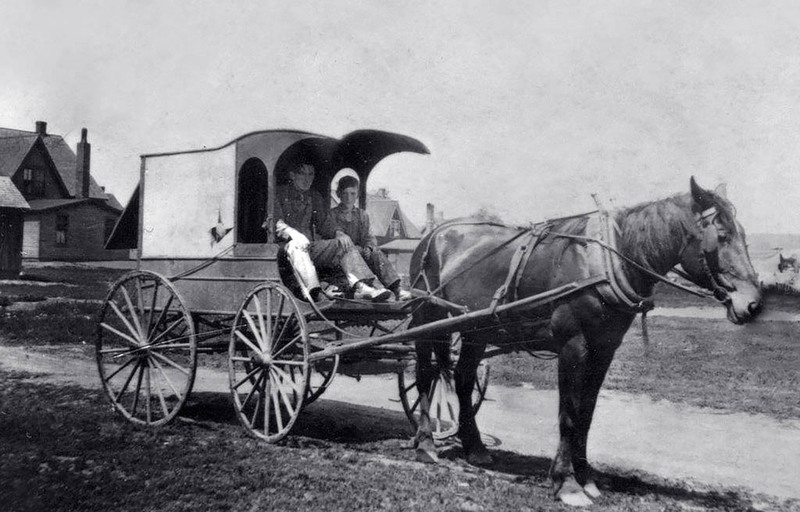 The first telephone service arrives in Pictou County. 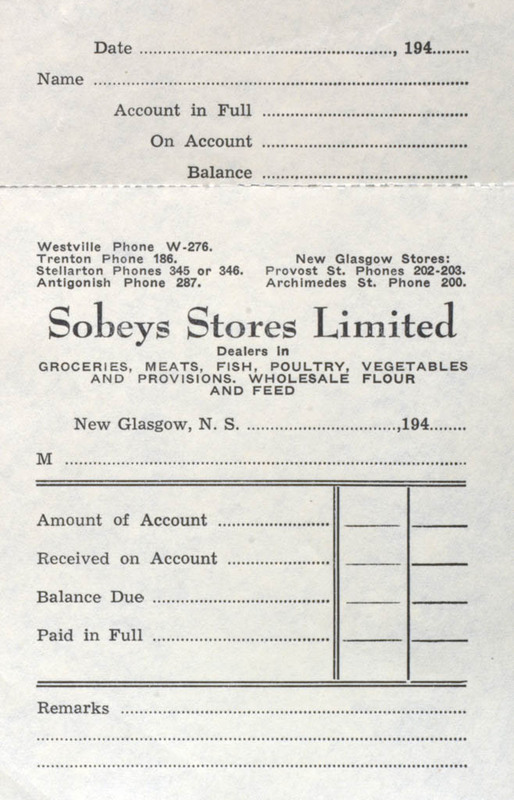 Years later customers would call Sobeys to place a grocery order that would be delivered soon after. Stanley Park officially opens in Vancouver. The land had been set aside as a government reserve for military purposes. The Jesuits' Estates Act was passed by the Québec legislature, authorizing payment of $400,000 for property confiscated from the Jesuit Order. 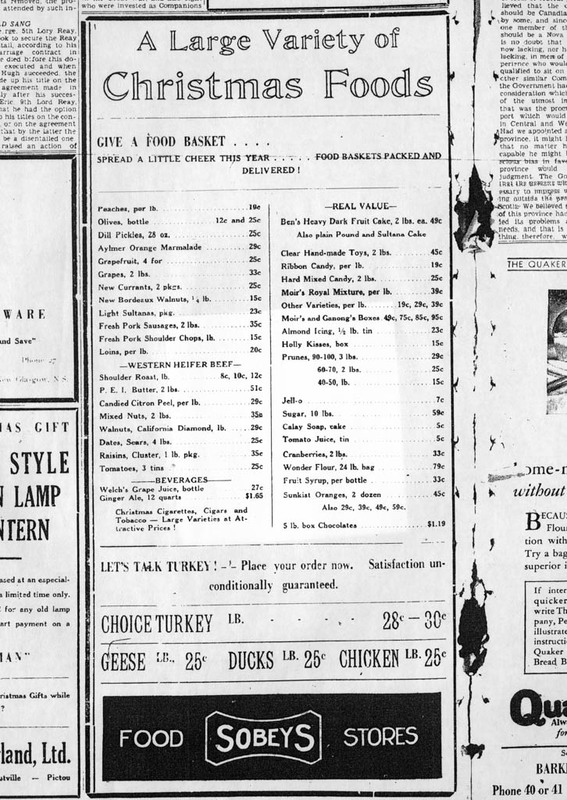 In Manitoba, Codville opens a small warehouse in Winnipeg. 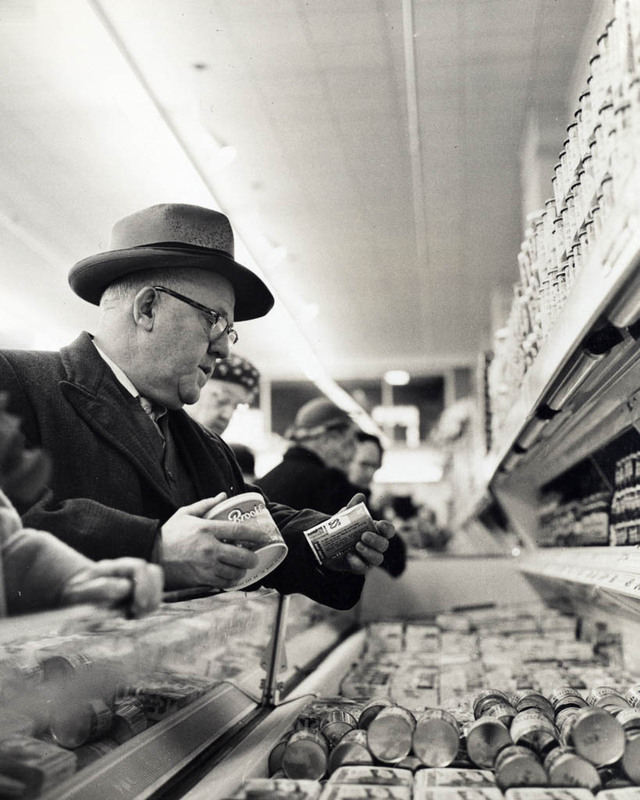 The iconic wholesaler is a main supplier to immigrant settlers headed west. 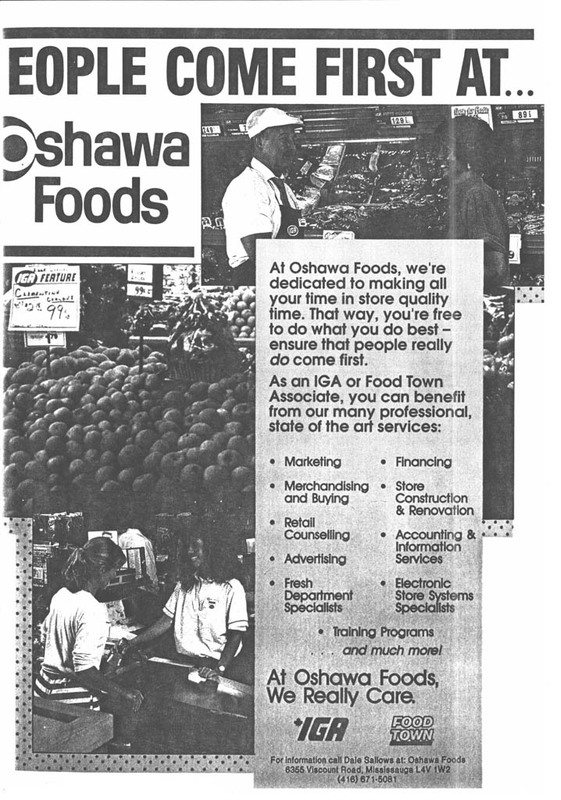 Decades later it joins the Oshawa group and then Sobeys’ family of enterprises. Sir John A. Macdonald dies in Ottawa at the age of 76. Thousands of grieving Canadians view his casket on display in the Senate. 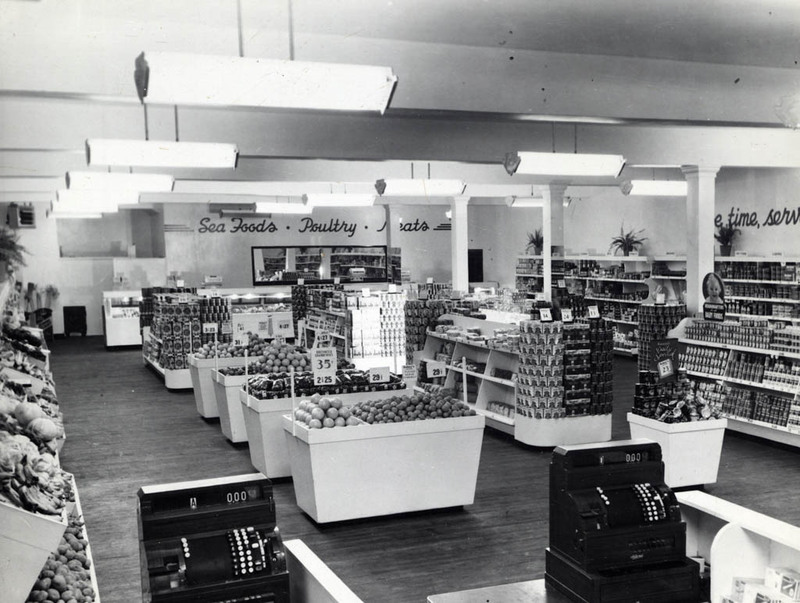 Hattie and Mylius expands, opening the South End Pharmacy in Halifax, a location that was still dispensing drugs in 1969, as part of the Balcolm-Chittick network later sold to the Sobeys group. A Toronto magistrate fines a cab driver $2 or 10 days in jail for "driving a lady on a Sunday." 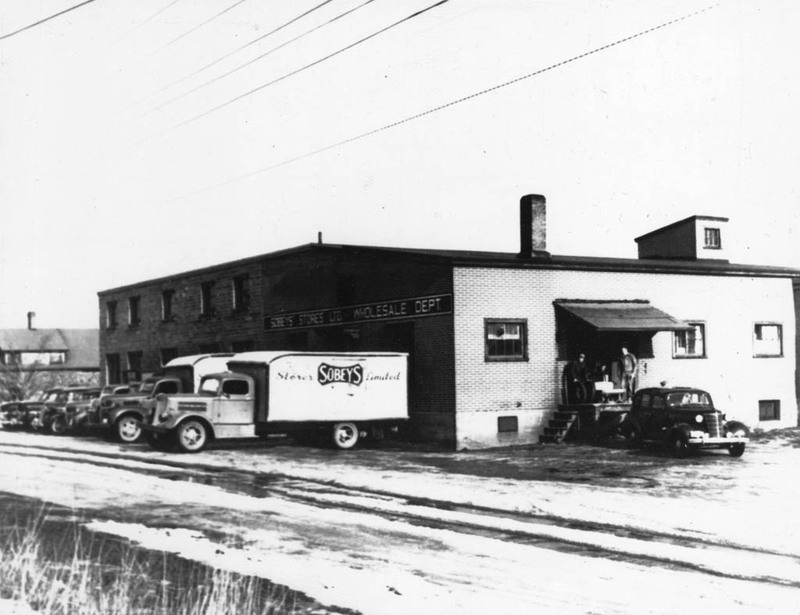 Lyons Brook, home of the Sobey family, boasts Logan’s Tannery with 60 employees, a blacksmith shop, carriage factory, shoemaker, two schoolteachers and several farms. Young J.W. 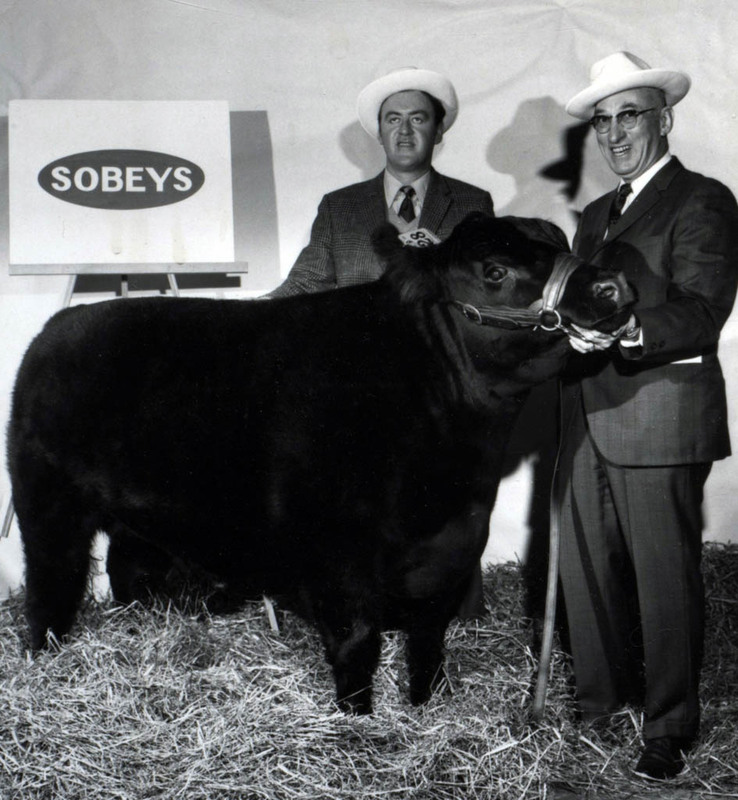 Sobey works on his father’s farm, learning carpentry and a work ethic that will stay with him and guide future generations of the Sobey family. Irma LeVasseur is the first Quebec woman to become a doctor. 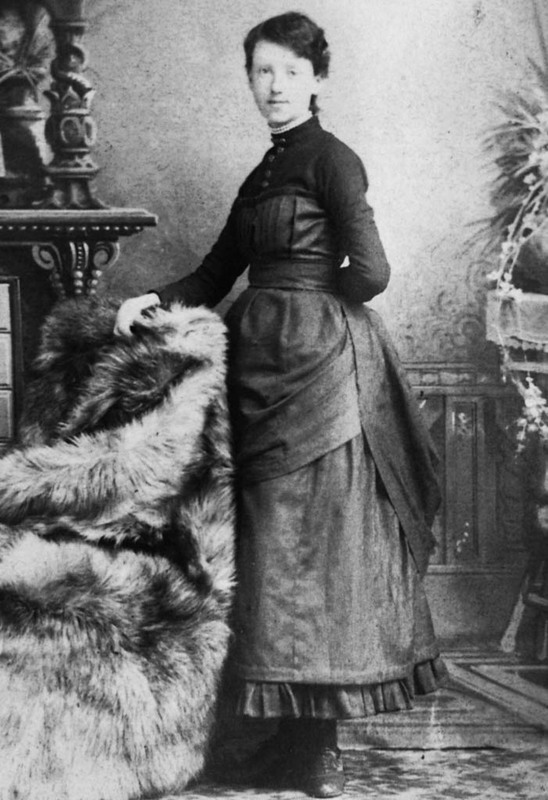 She helped found the l’Hôpital de l'Enfant-Jésus in Québec City and the l’Hôpital Sainte-Justine in Montréal. She devoted her life to helping handicapped children. Scotsburn Cooperative Dairy forms in Scotsburn, N.S. 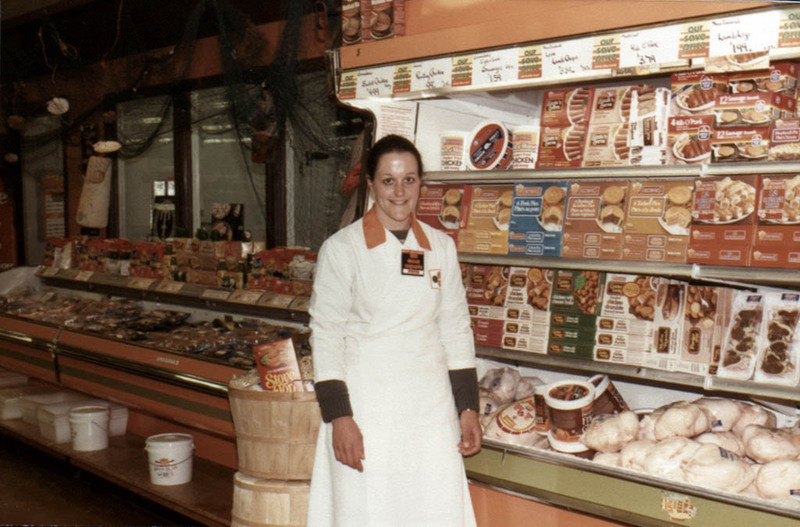 Scotsburn dairy products are a mainstay in Sobeys stores and the families behind the two enterprises enjoy a long association in business and community service. Queen Victoria dies and is buried at Windsor. Her son Edward VII is proclaimed King. In Canada, the population reaches 5.4 million. On Jan. 1, J.W. marries a woman not unlike his mother. 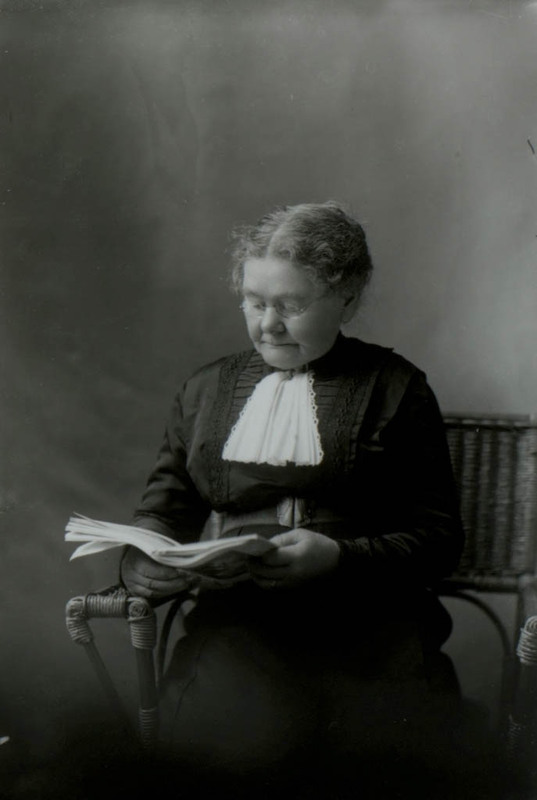 Eliza (Creighton) Sobey was an upstanding school teacher of Scottish descent from nearby Durham. She was remembered as “iron-willed” by a grandson. Victoria Day is observed throughout Canada. Prime Minister Wilfrid Laurier designated the holiday to fall on the birthday of Queen Victoria (May 24). 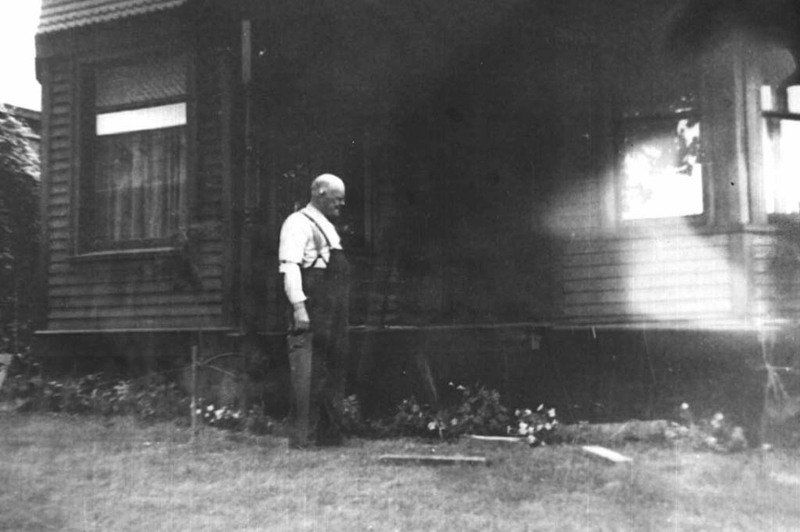 Frank Sobey is born on May 24, in his grandparents’ home in Lyons Brook, on the birthday of Queen Victoria and the first Victoria Day. Alberta and Saskatchewan become provinces. Roald Amundsen navigates, from east to west, the Northwest Passage. J.W. 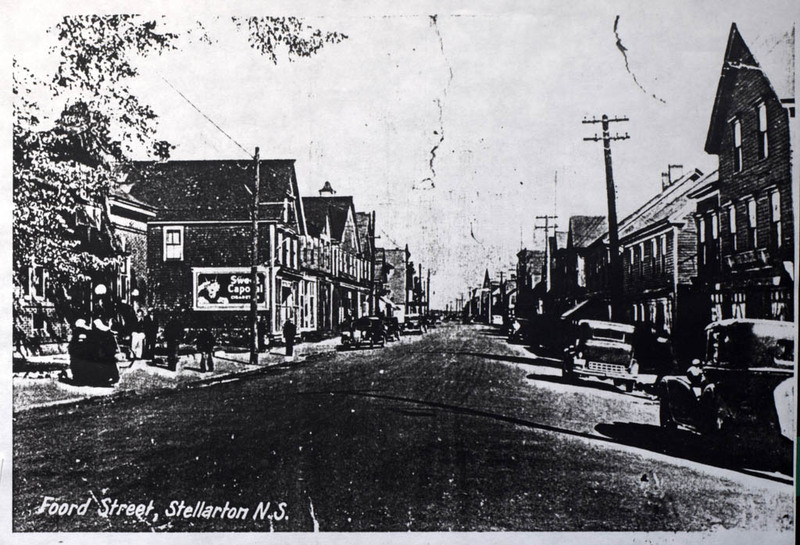 and his small family move to Stellarton, where he works to build shafts for the “million dollar” Allan mine. He earns 90 cents a day, plus an extra 10 cents danger pay. Inventor Reginald Fessenden of Milton-Est, Que., makes the first public broadcast of music and voice, a Christmas concert radioed to ships’ crews in the Atlantic Ocean and the Caribbean. It is the first AM radio transmission. J.W. builds a house in Stellarton for his family. 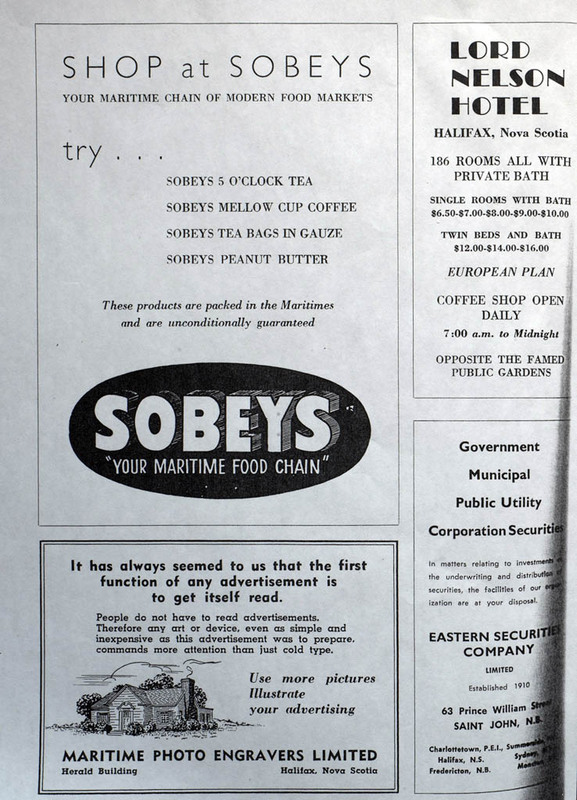 In Halifax, Hattie and Mylius join with other wholesalers to form the National Drug and Chemical Company, later part of M. Loeb food giant, which would become part of the Sobeys chain. 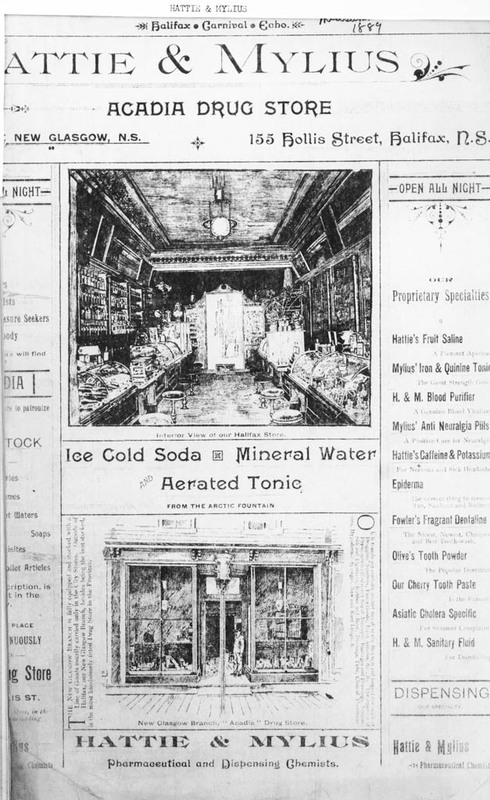 Manufacturing chemist and pharmacist John J. McLaughlin registers the trade name for a soda recipe he perfected. Simply named for its flavour, Canada Dry Pale Ginger Ale is a milder take on ginger beer. J.W. 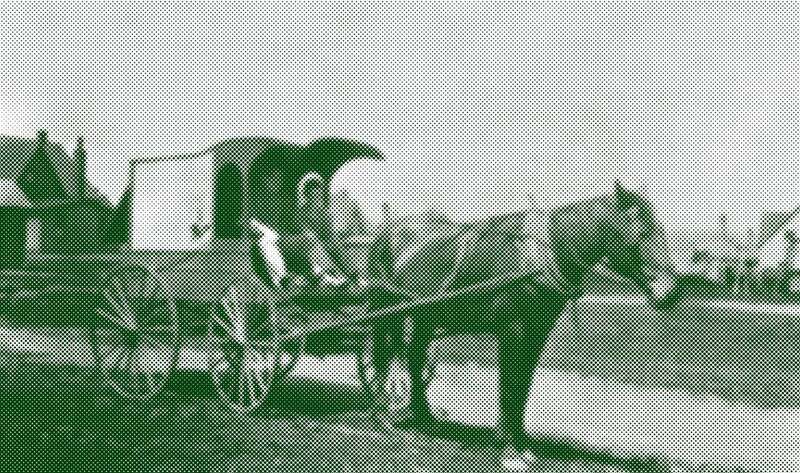 Sobey starts a meat delivery business with a horse-drawn wagon. 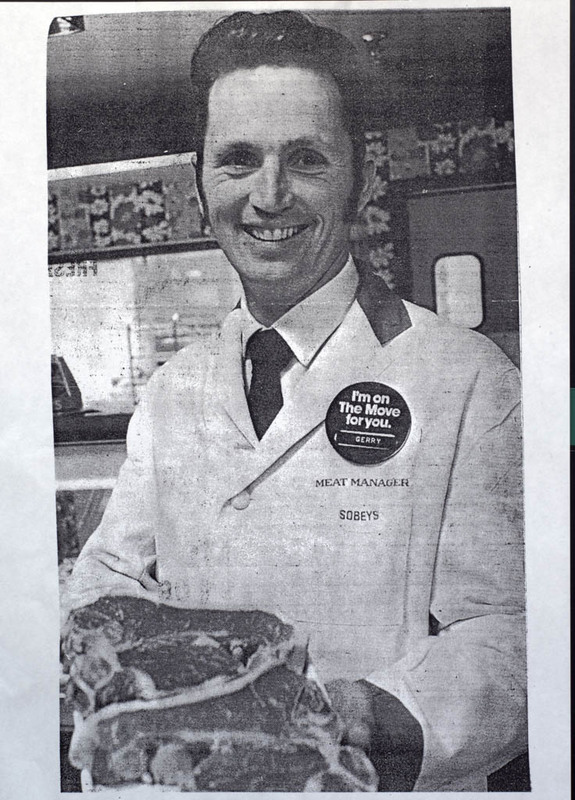 He purchases livestock from local farmers and sells the meat to customers in Stellarton. 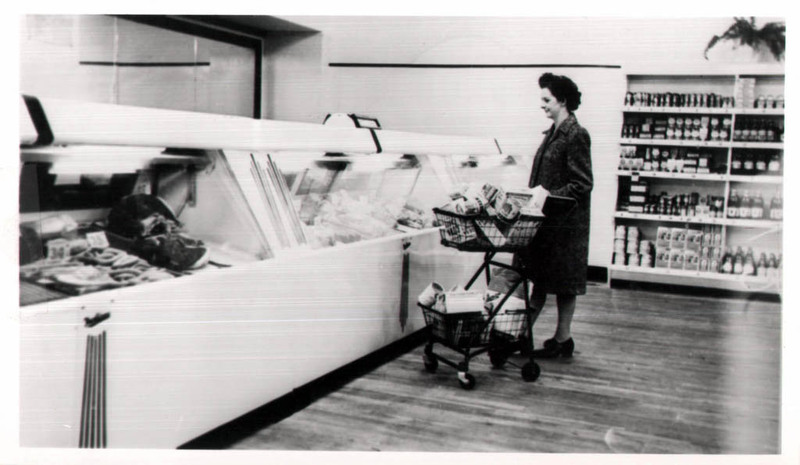 He had no way of knowing at the time, but this marked the beginnings of a nationwide grocery chain. The Canadian Navy begins as the Canadian Naval Service when the Naval Service Act is passed. Canada has sent over 850 warships to sea since its creation. 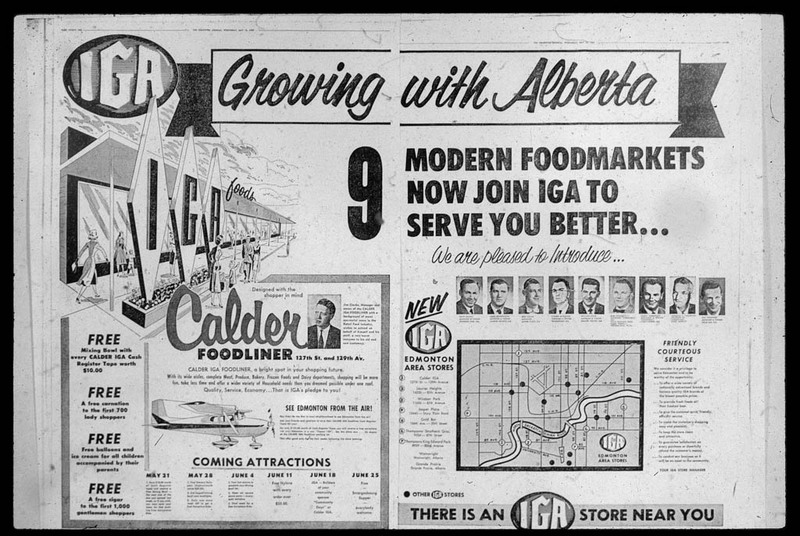 The forerunner of IGA in Alberta can be traced to Edmonton Associated Wholesalers, which begins operating in the West. 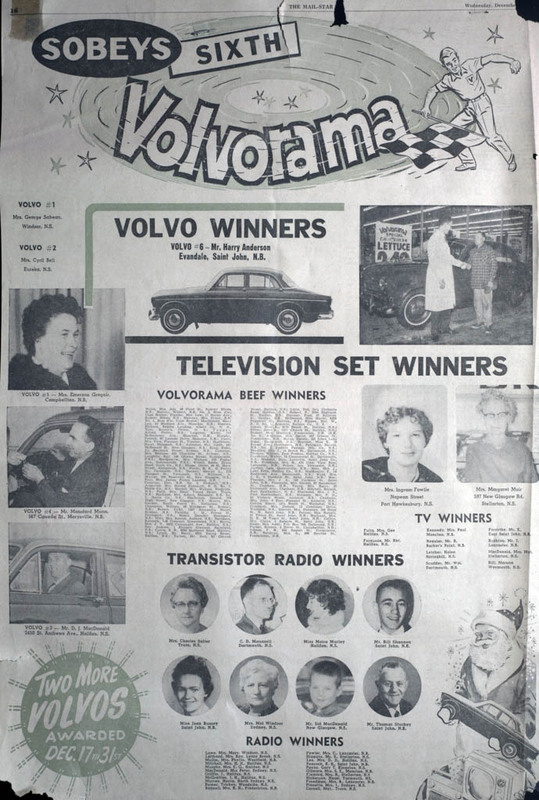 The company becomes Horne & Pitfield in 1959. Robert Borden’s Conservatives defeat the Liberals, ending their 15-year reign. The election is a defeat for the Liberal policy of free trade. Canada’s population is 7.2 million. With his total fortune – $65 – 15-year-old Russian immigrant, Max Wolfe, buys a horse, wagon and barrel of apples. 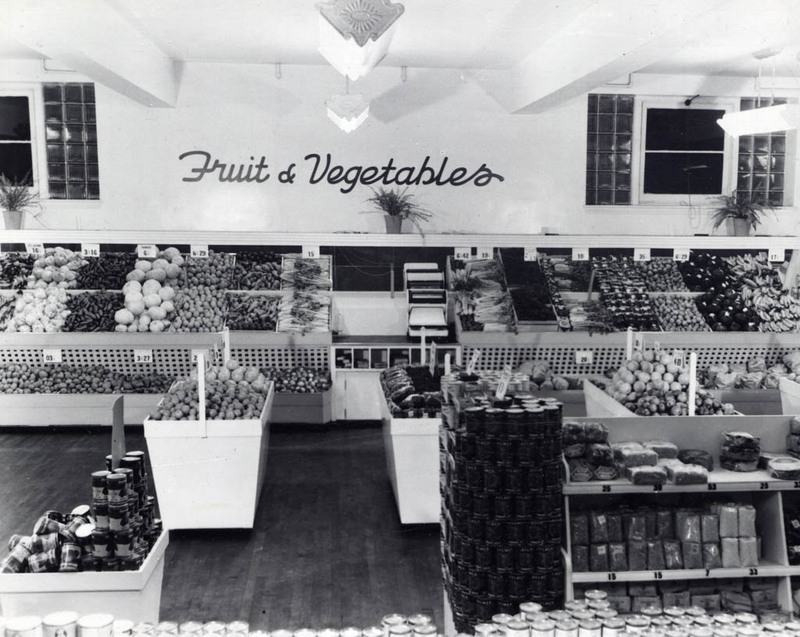 A fresh produce business that would become the Oshawa Group is born. The Titanic hits an iceberg 590 kilometres south of Newfoundland on its maiden transatlantic voyage. 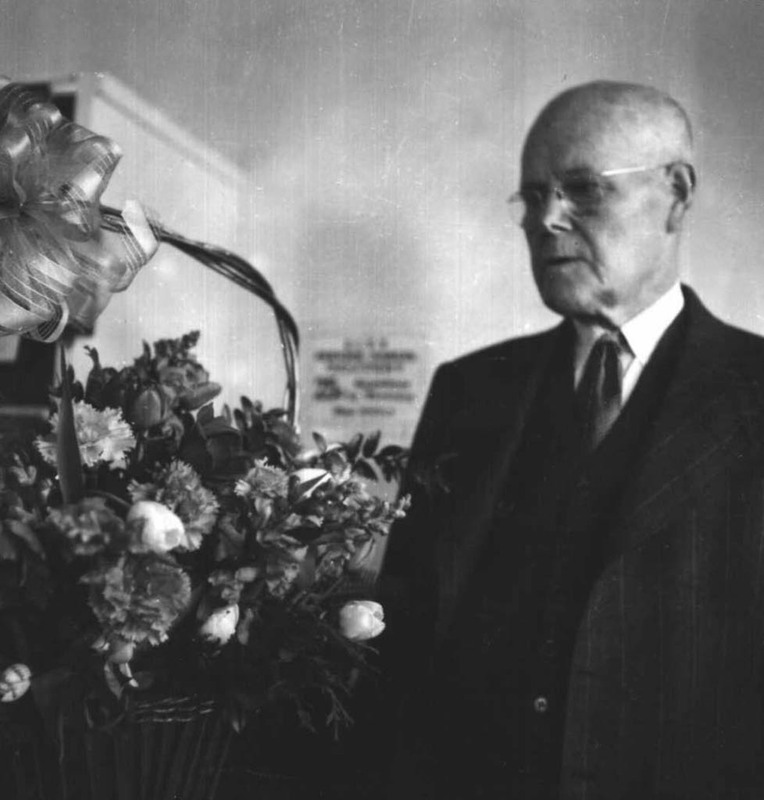 It sinks in two hours, 40 minutes with the loss of more than 1,500 lives, including Canadian railway tycoon Charles Melville Hays. J.W. 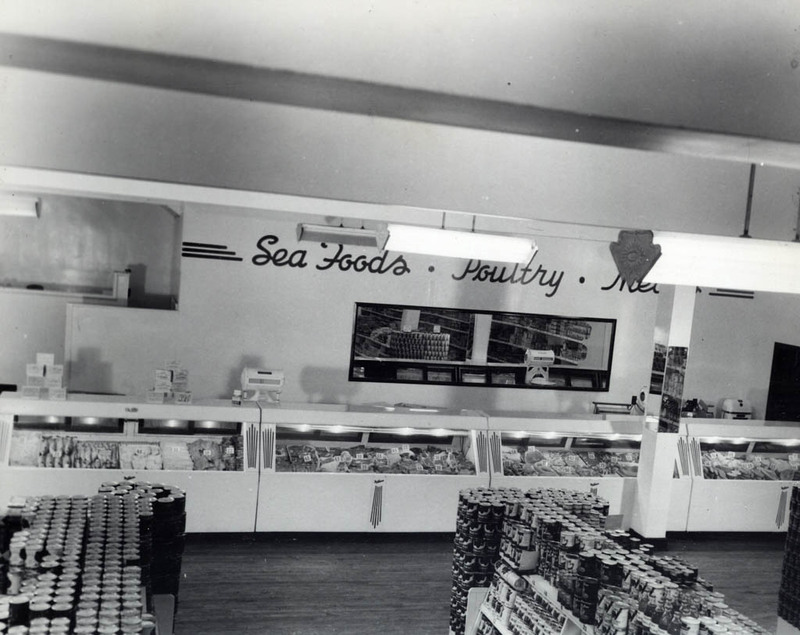 builds a store in Stellarton to sell to walk-in traffic, and expands his offerings to include local vegetables, dairy and fish products. 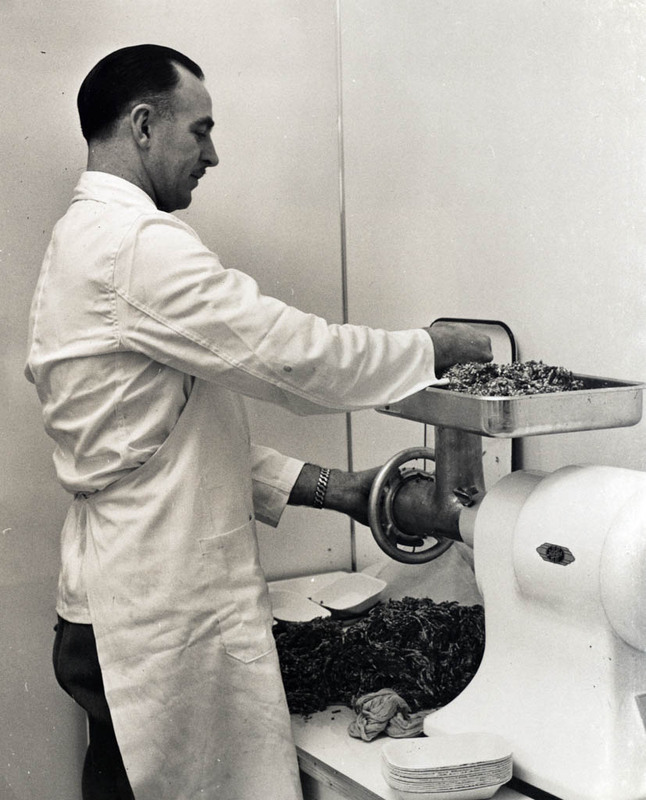 Over the next several years he would gradually add more stock like oats, hay, and other animal feed, kerosene, and staple food products. 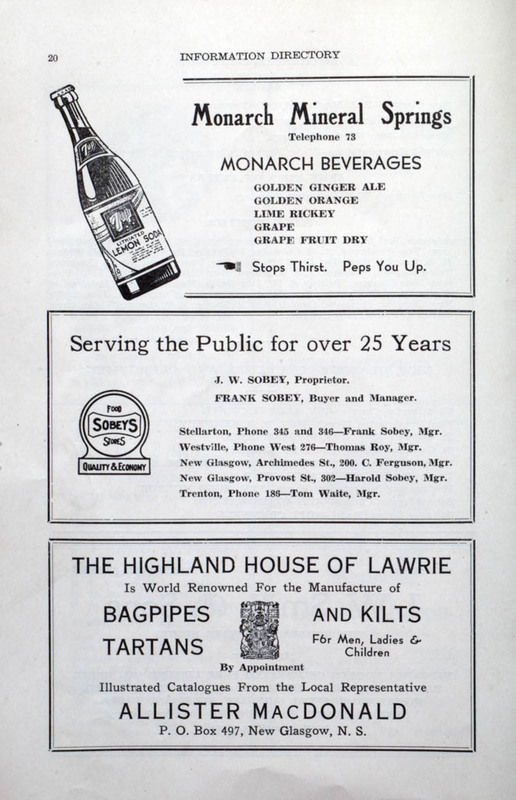 When Britain declares war on Germany, the dominions of the British Empire, including Canada and Newfoundland, are also at war. The maple leaf formed part of the general list cap badge of the Canadian Expeditionary Force in the First World War. 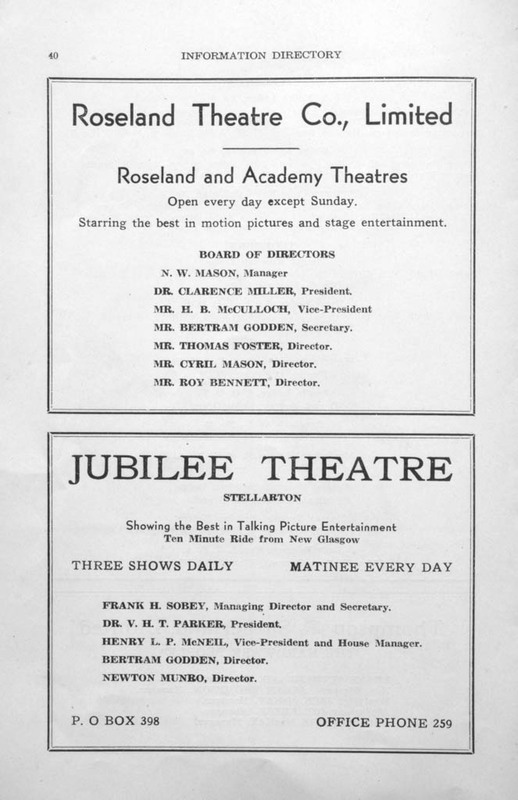 The Jubilee Theatre is built next to J.W. 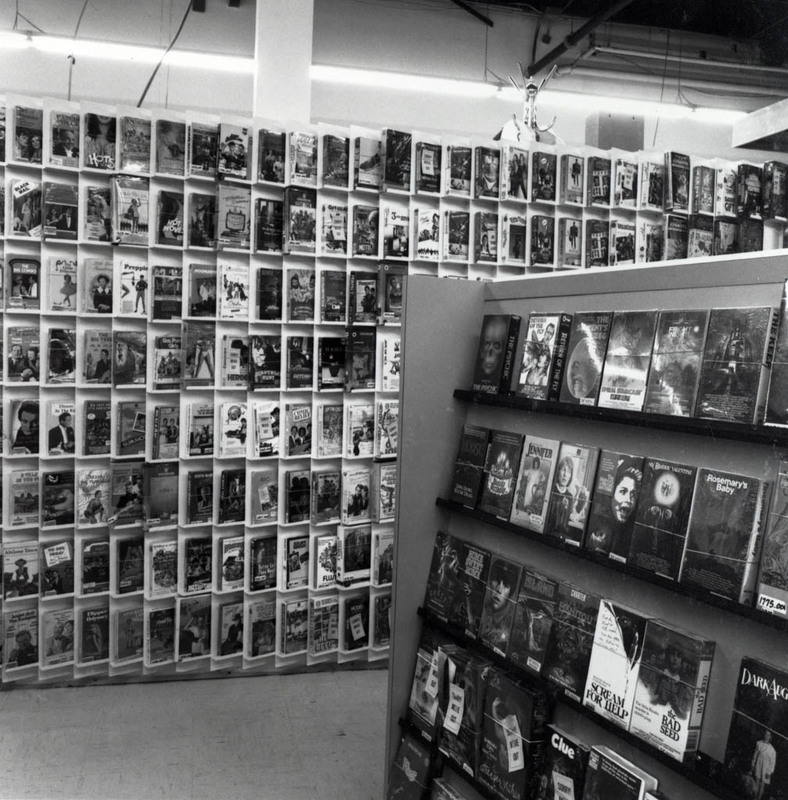 Sobey’s store, and young Frank Sobey begins a lifelong love of movies. 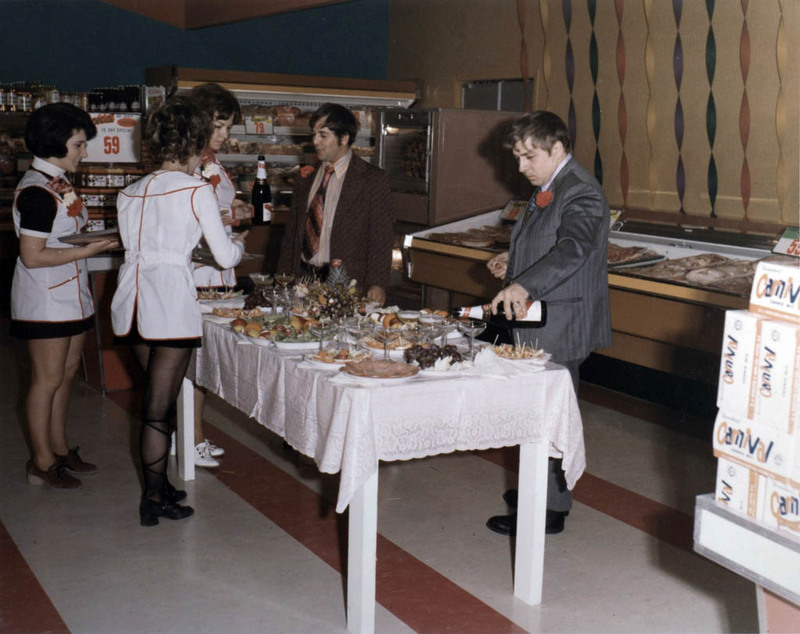 Frank would later buy the theatre, a hint that the Sobeys Empire Theatre network was in the future. John McCrae of Guelph writes the famous poem In Flanders Fields near Ypres. It is first published in December by the English magazine Punch. 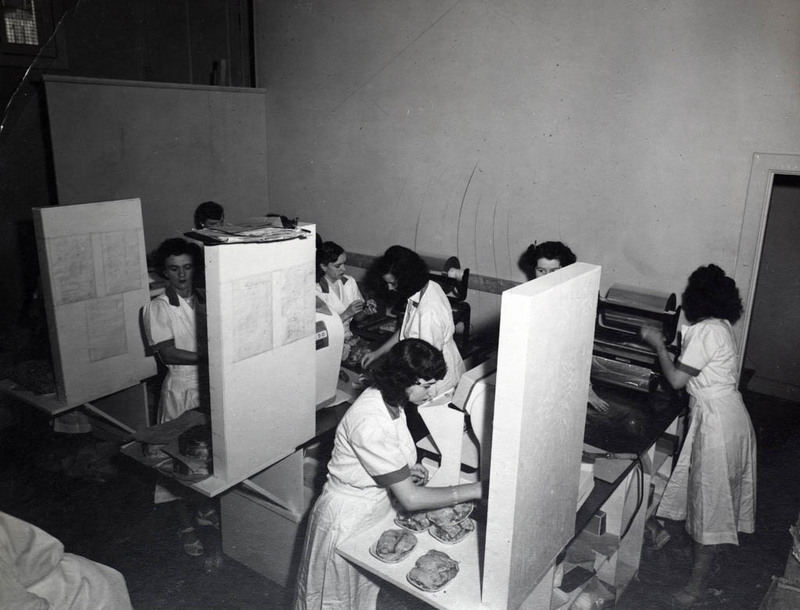 Parliament passes the Wartime Elections Act extending the vote to nursing sisters and to women who have relatives serving overseas. The Halifax Explosion, the world’s largest prior to the atomic bomb, kills about 1,600 and injures 9,000. 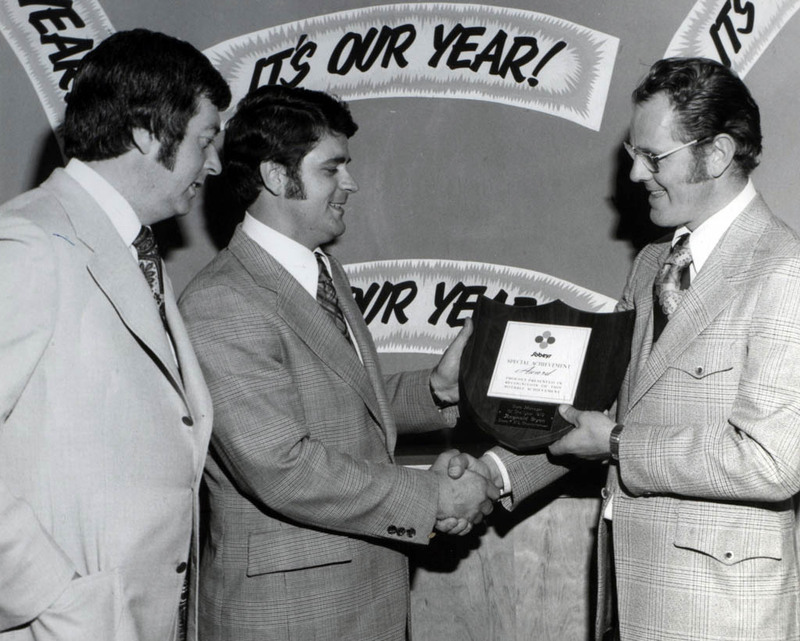 The National Hockey League is formed. 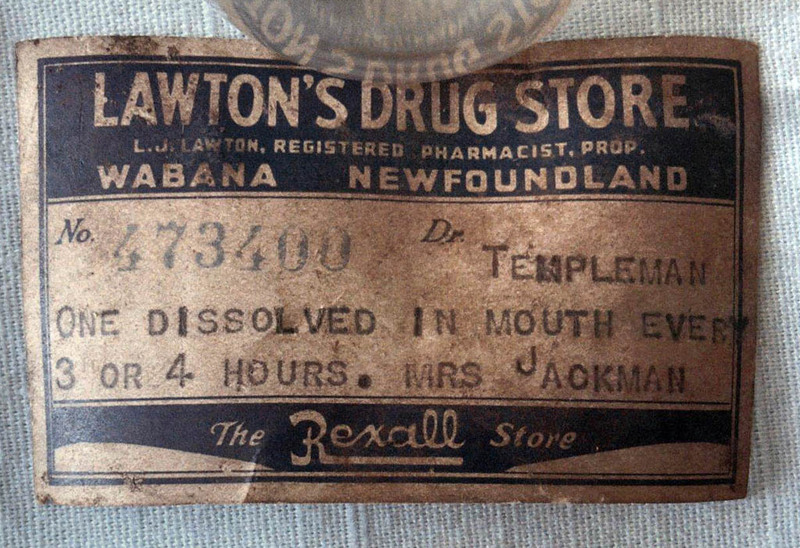 McFatridge’s Drug Store, managed by pharmacist T.J. Barrow, is a going concern in north-end Halifax, helped by sales of Willison Wine. 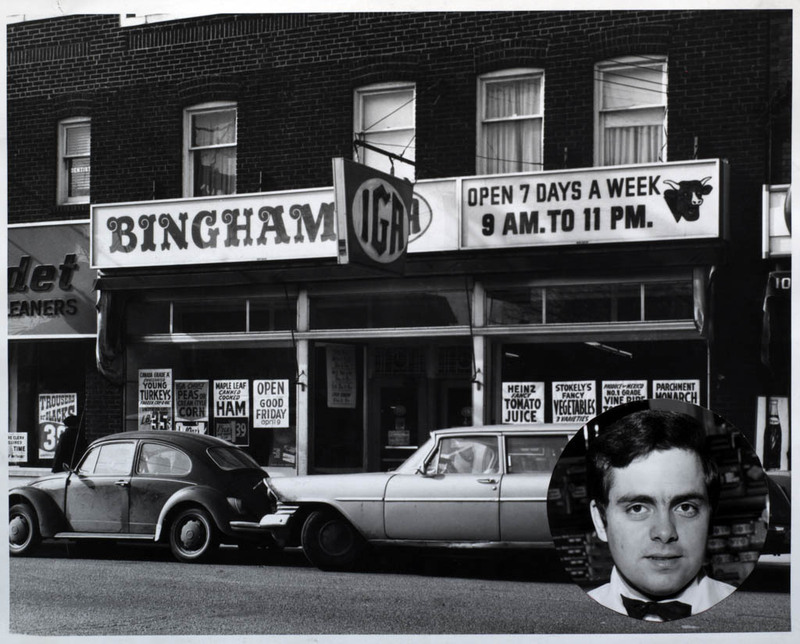 This store would become Keith Lawton’s first. The war ends, but a devastating epidemic spreads through Europe and the world, killing some 30 million people including about 50,000 Canadians. Women who are British subjects and 21 years old are entitled to vote in federal elections. Frederick Banting and Charles Best isolate insulin. 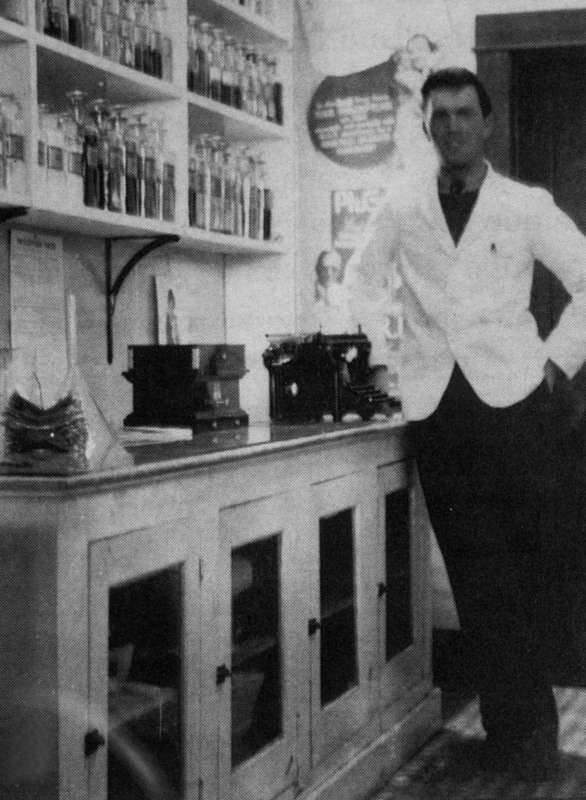 The first diabetes patient was treated on Jan.11, 1922. 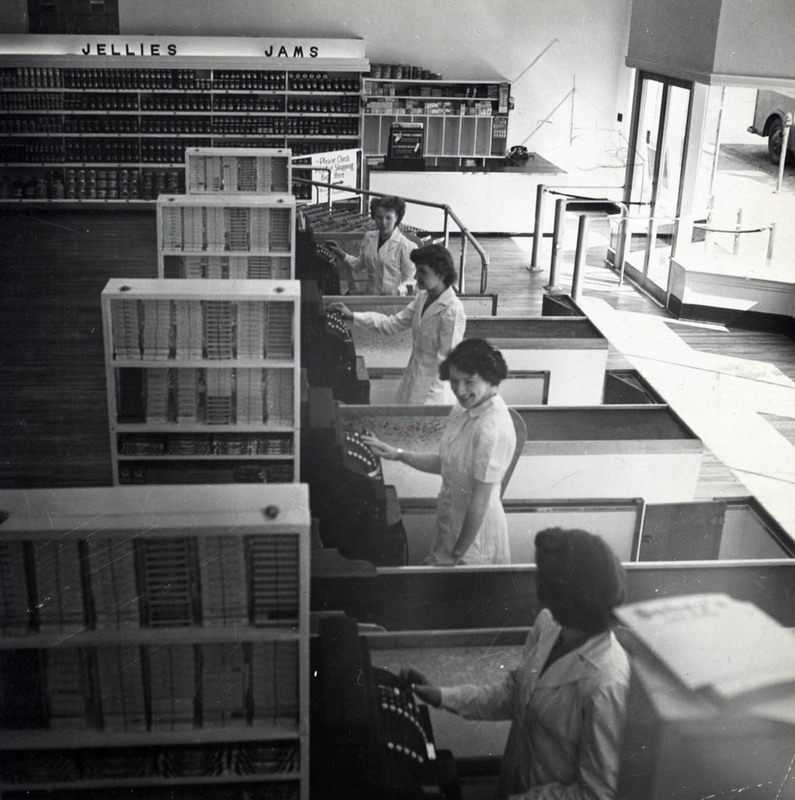 Banting and J.J.R. 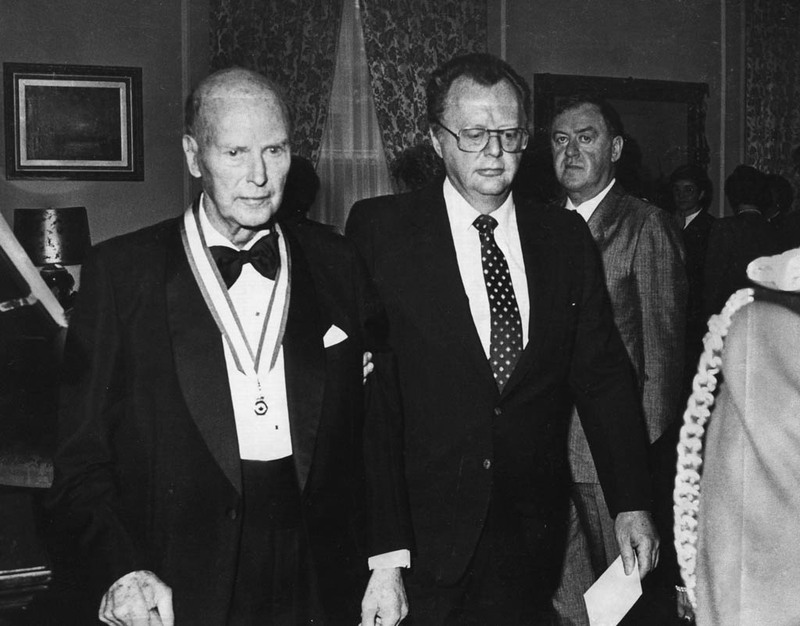 Macleod receive the Nobel Prize. There are now 8,788,483 Canadians. 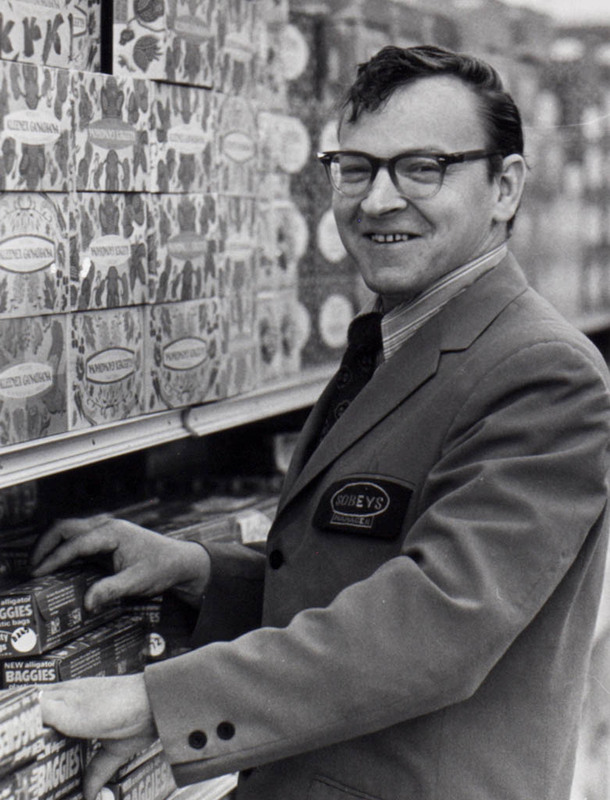 Frank H. Sobey goes to work full-time with his father in the Stellarton store. 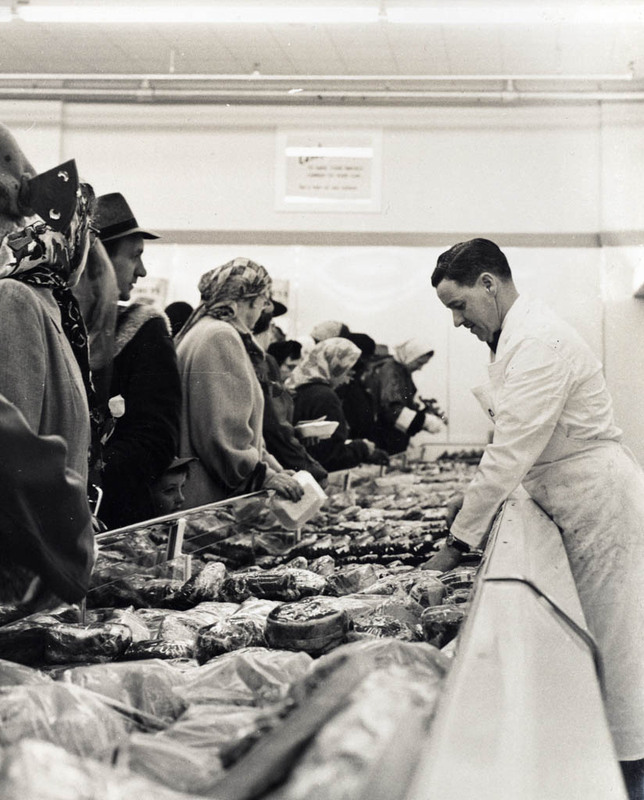 He forms a special bond with local farmers from whom he buys meat and later produce. Foster Hewitt is broadcasting hockey games. The Toronto Granite Club wins an Olympic gold medal in ice hockey at Chamonix beating the U.S.
J.W. 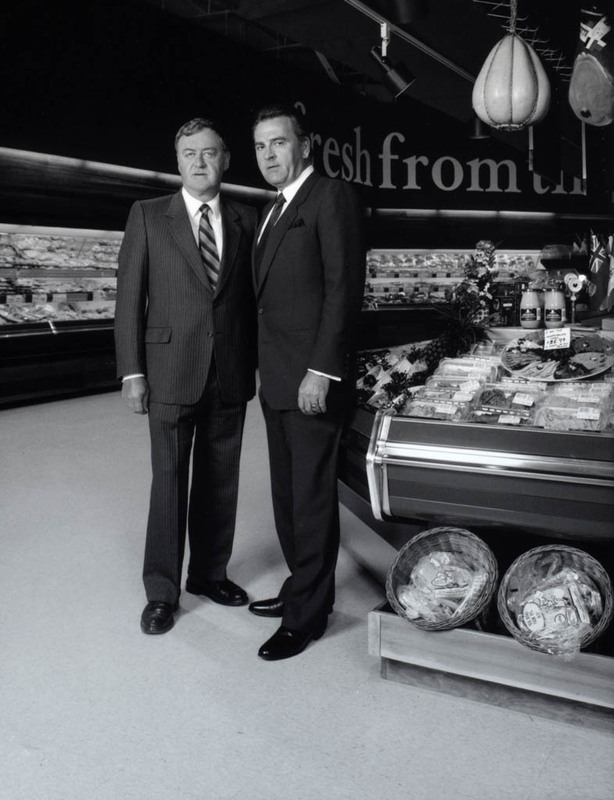 and his son Frank formalize their business partnership, and Frank persuades his father to carry a full line of groceries, including exotic imported goods. 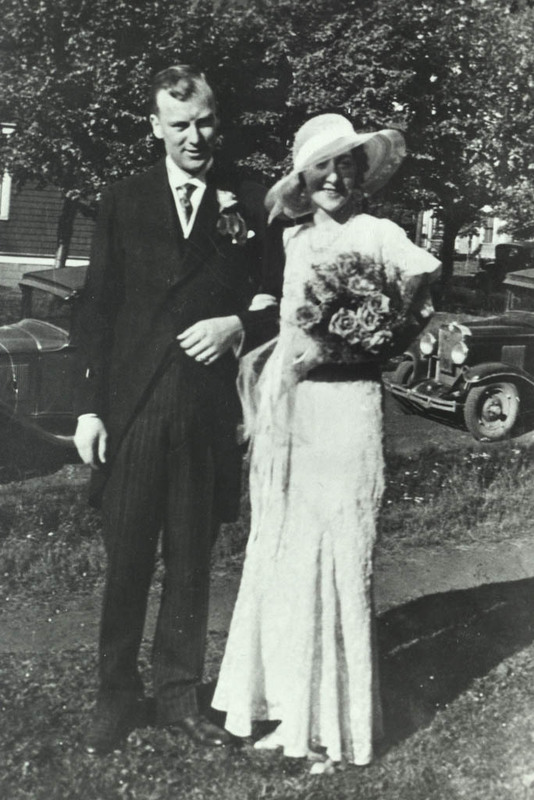 Frank marries Irene MacDonald and the third generation in the business soon follows: William MacDonald in 1927, David Frank in 1931, Donald Rae in 1934, and Dianne in 1939. 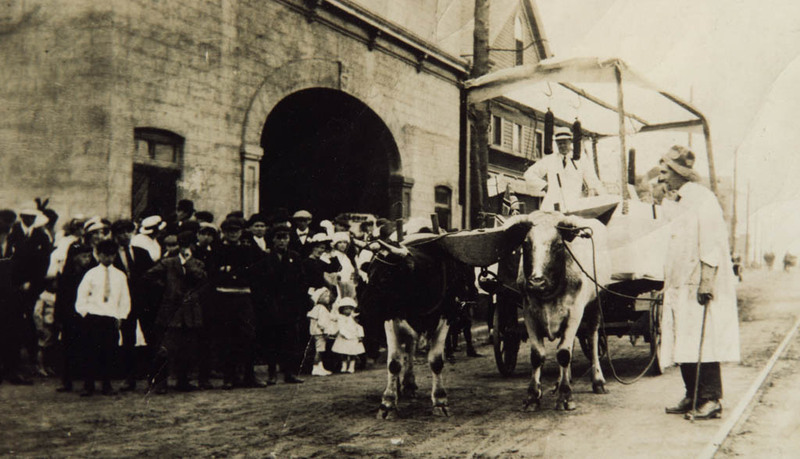 Eaton’s holds its first Christmas parade in Montréal, with 1,100 children participating. 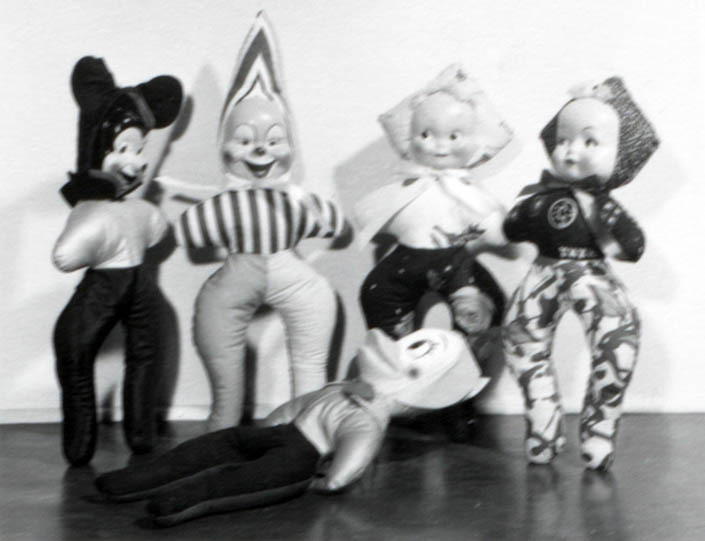 It became an annual event, held on the third Saturday of November until 1968. 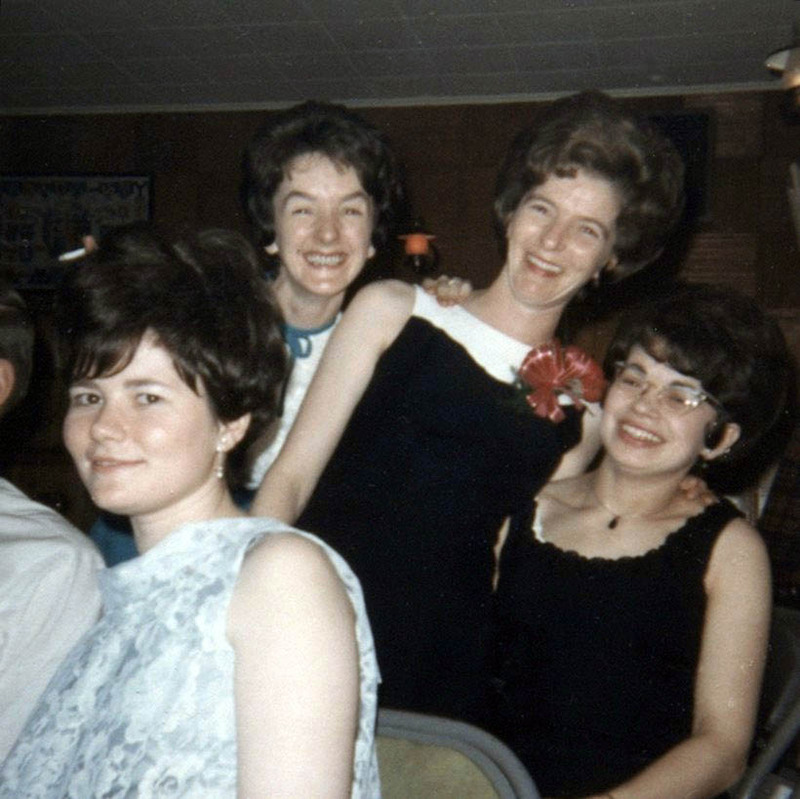 In Newfoundland, women over 25 years of age gain the right to vote and to stand for political office. 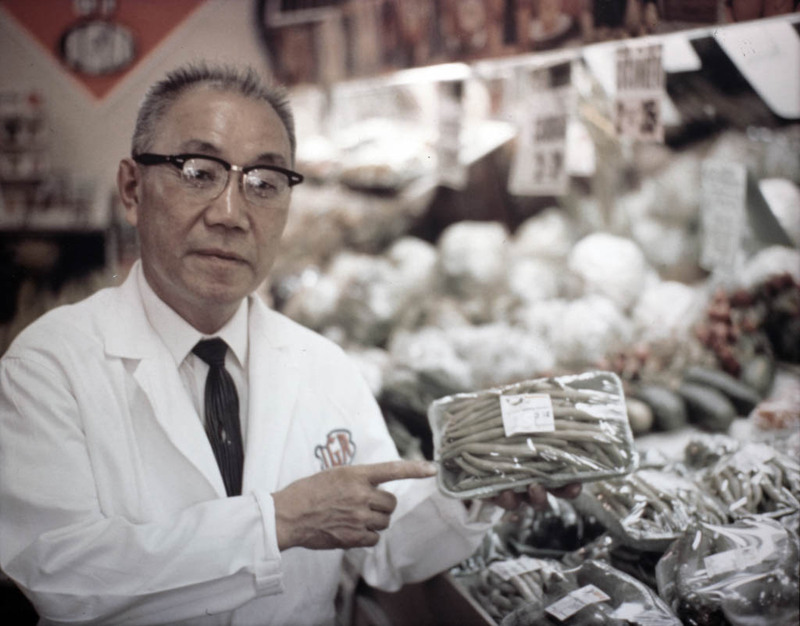 Although he had attended business school, Frank credits local farmers for his business acumen. “I learned more about sound business practices as a … young man dealing with farmers than I could have learned any other place. … There’s no other way to survive the risks of farming. 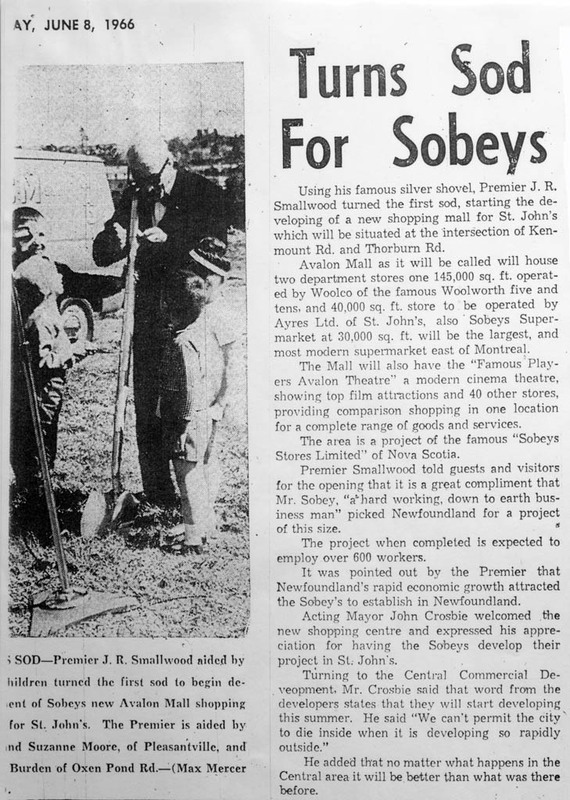 Perhaps without being aware … the successful farmer was a cost accountant as well as hardworking agriculturist …” Frank opens Sobeys #2 store in New Glasgow. The future Queen Elizabeth II is born. Mackenzie King’s Liberals are defeated on a motion of censure. Governor General Julian Byng refuses to grant King's request to dissolve Parliament and asks Arthur Meighen to form a government. 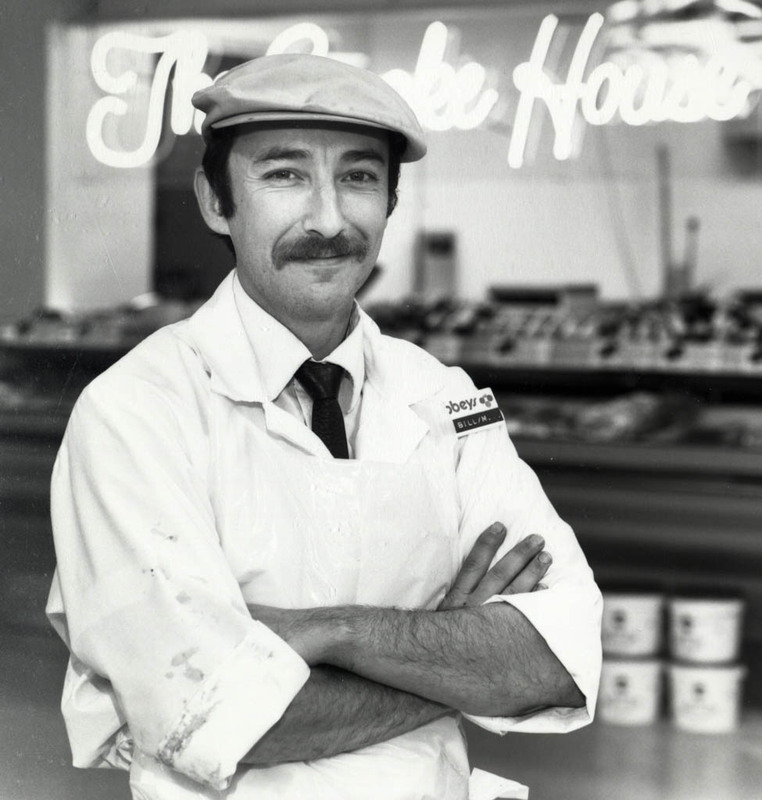 In Quebec, Elphege Deaudelin starts door-to-door delivery of butter and eggs, and builds a loyal clientele. Business thrives. 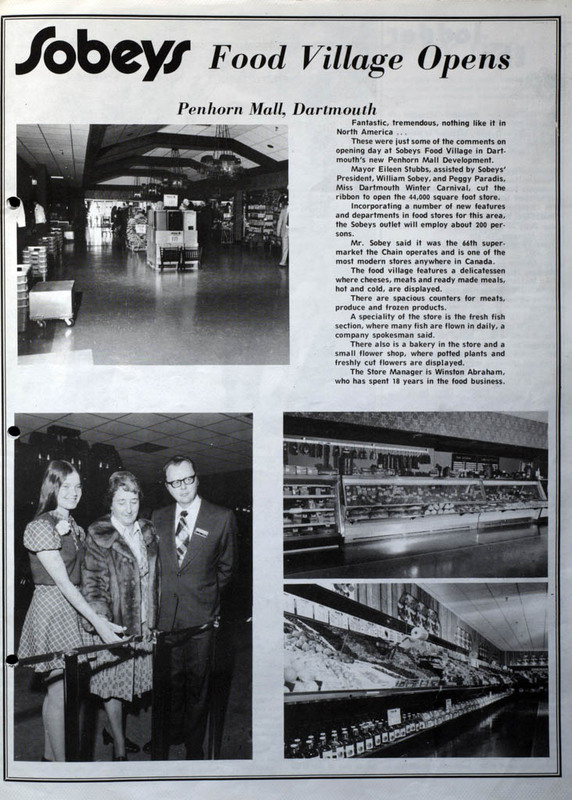 He later merges with Hudon & Orsali, which is acquired by the Oshawa group and finally Sobeys. The House of Commons approves the old-age pension plan and coincidentally, the Toronto St. Patricks hockey team was renamed the Maple Leafs. J.W. 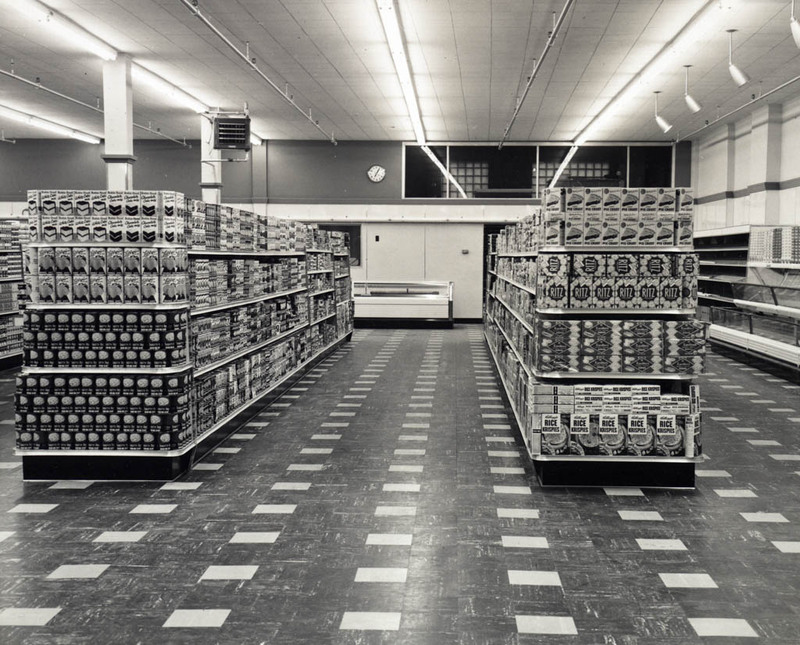 and Frank compete with several similar grocery stores in the local market of four towns. 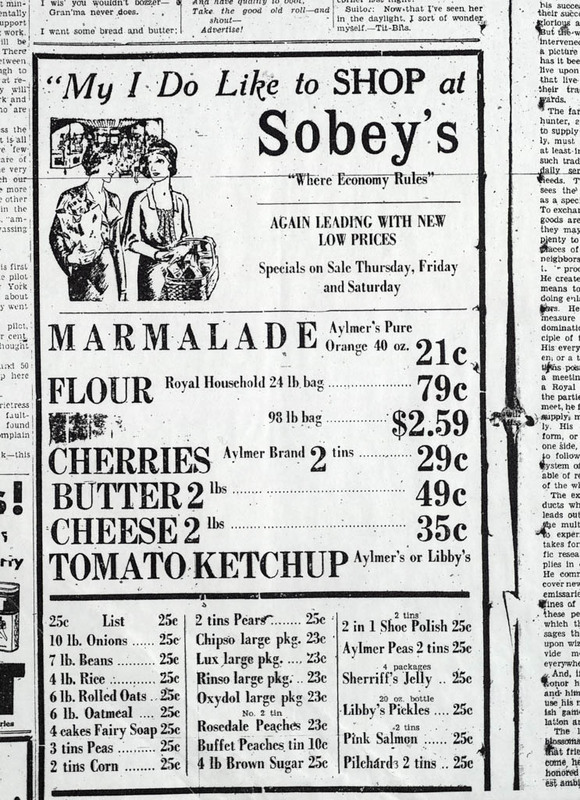 To draw customers, their advertising slogans and sketches emphasize Sobeys quality, value, and local products. Pier 21 opens in Halifax and is the point of entry for some one million immigrants to Canada. It has been called the Gateway to Canada and later becomes a national historic site and museum. Two more stores join the rapidly growing Pictou County Sobeys group: Store #3 in Westville, followed by #4 in Trenton. 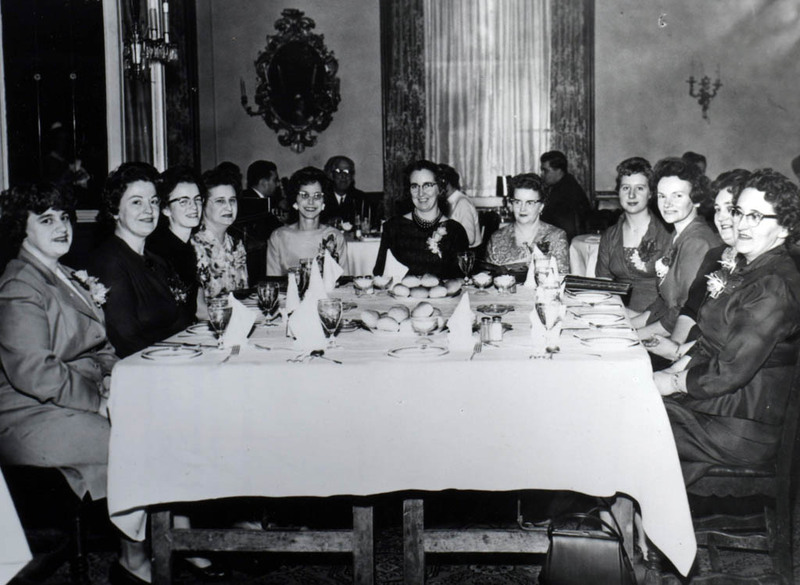 The British Privy Council rules that women are legally "persons" and therefore can hold seats in the Canadian Senate. 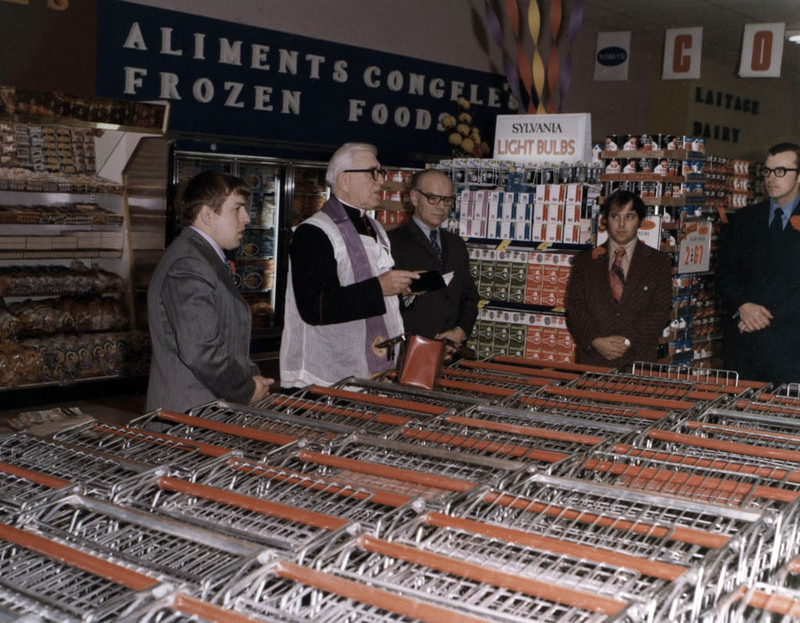 Safeway comes to Canada with five stores operated by Walter J. Kraft, considered Safeway Canada’s founding father. In the federal election, the Conservatives win a majority with 137 seats to the Liberals' 91. R.B. Bennett becomes prime minister. 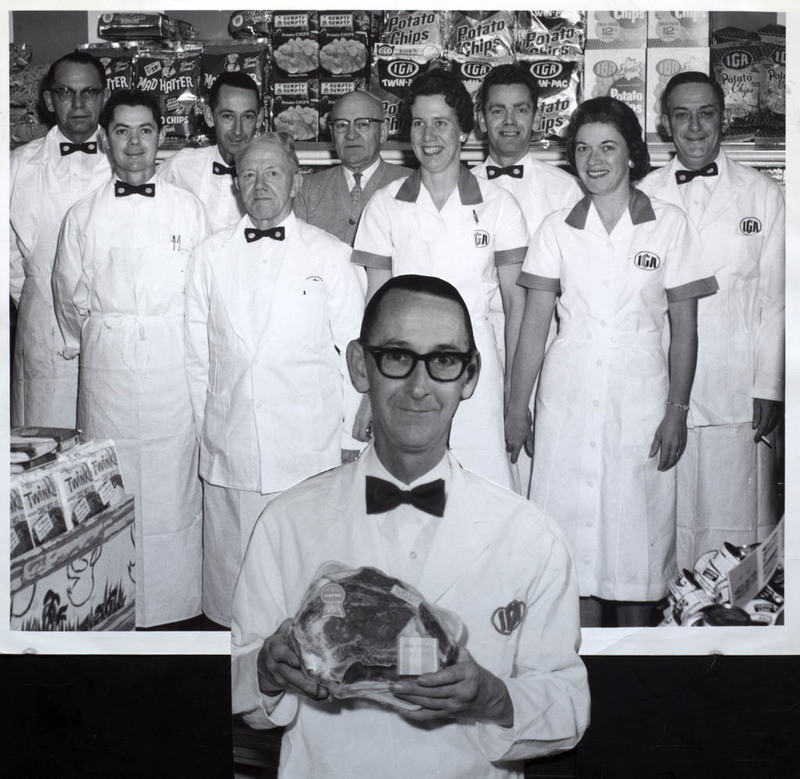 All of J.W.’s children worked in the business, and Frank’s sons started working in the stores right out of grade school, bagging potatoes and sweeping floors. The Statute of Westminster is passed by the British Parliament, establishing legislative equality between the parliaments of Britain and Canada. It is the closest Canada has come to a declaration of independence. Canada’s population tops 10 million. 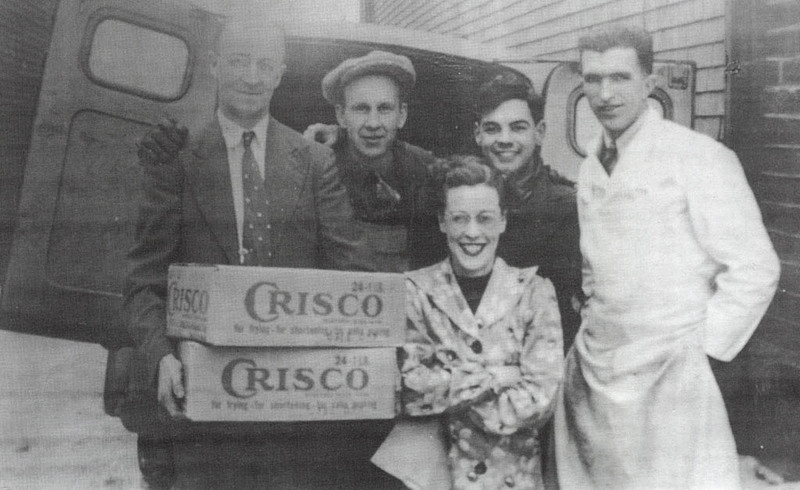 As it had for years, and would continue for decades, the Stellarton store extends credit to its neighbours. 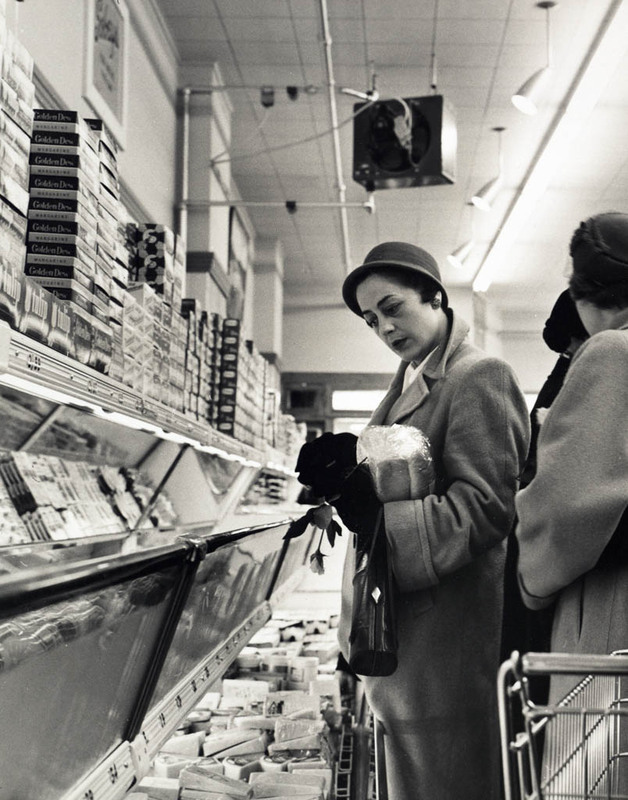 During the Depression, Frank’s mother, Eliza would never turn a hungry man away from her door. 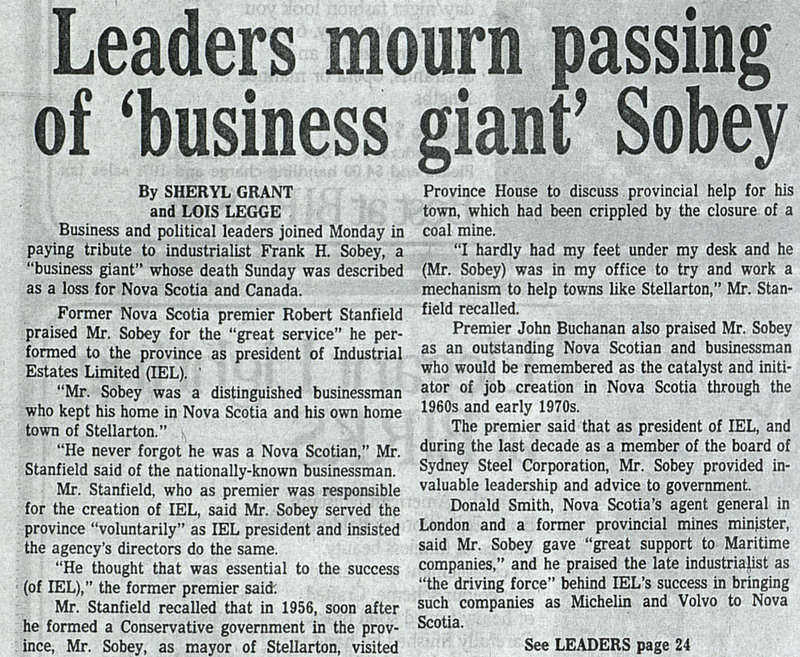 “If it weren’t for the likes of JW Sobey … we would have starved to death,” said a coal miner’s wife. 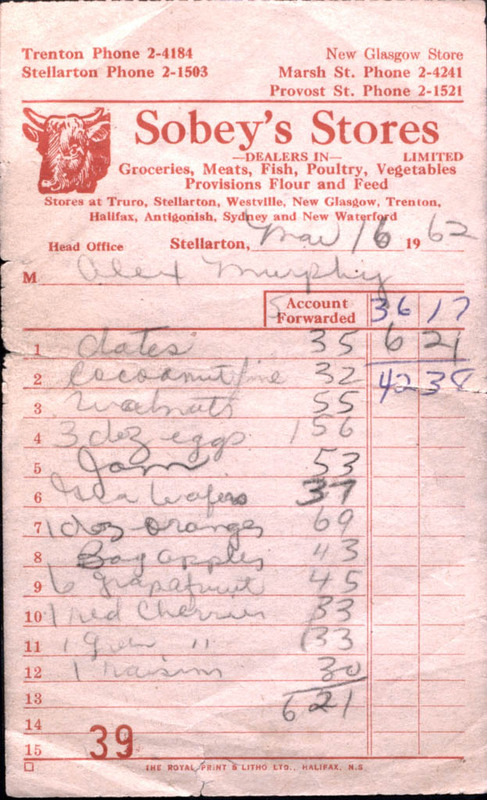 The miners were J.W.’s best customers. He extended them credit, and on payday (Saturday) they put money on their bills. During periods of illness, bereavement, disasters, or mine shutdowns, J.W. carried the mining families on his books until they were able to start paying back. 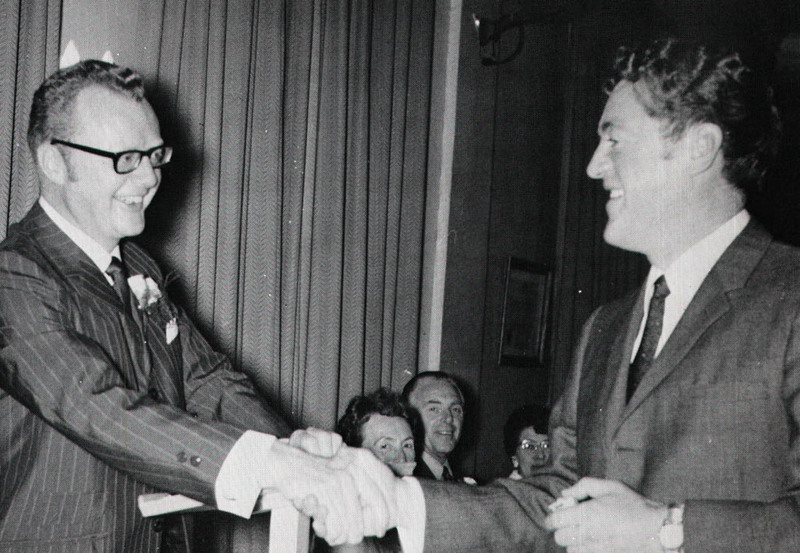 “A lovely man, a mild man, a fine, fine man,” said Bill Jamieson of J.W. The Dionne Quintuplets - Annette, Emilie, Yvonne, Cecile and Marie - capture worldwide attention. 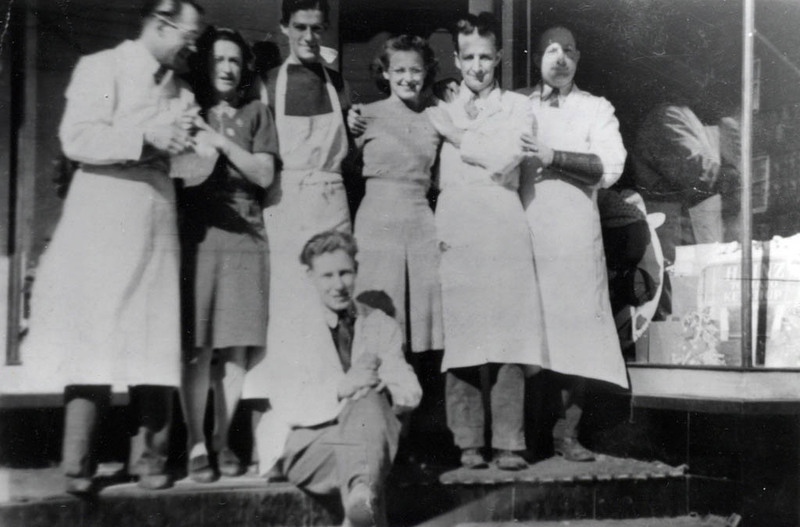 Born in Corbeil, Ont., to Oliva and Elzire Dionne, they were the only quintuplets to survive for more than a few days. 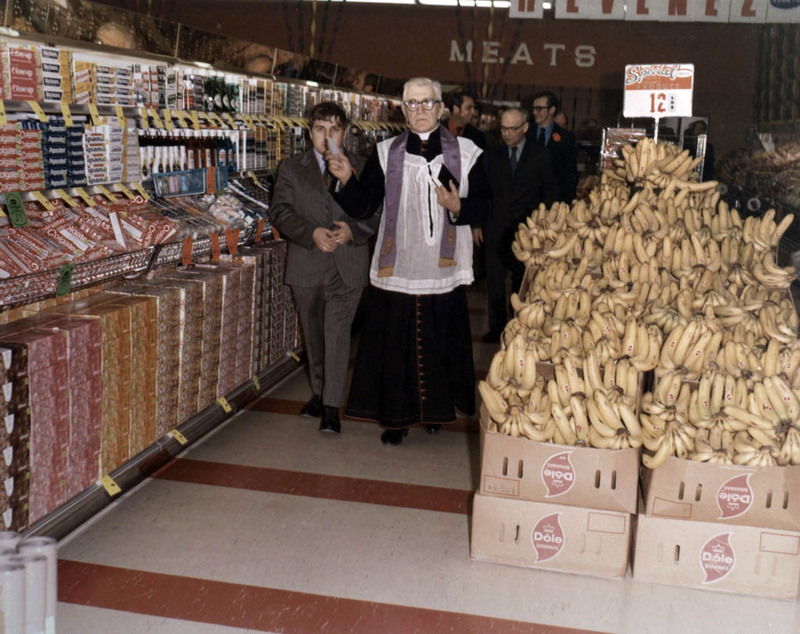 Most groceries were home-delivery. 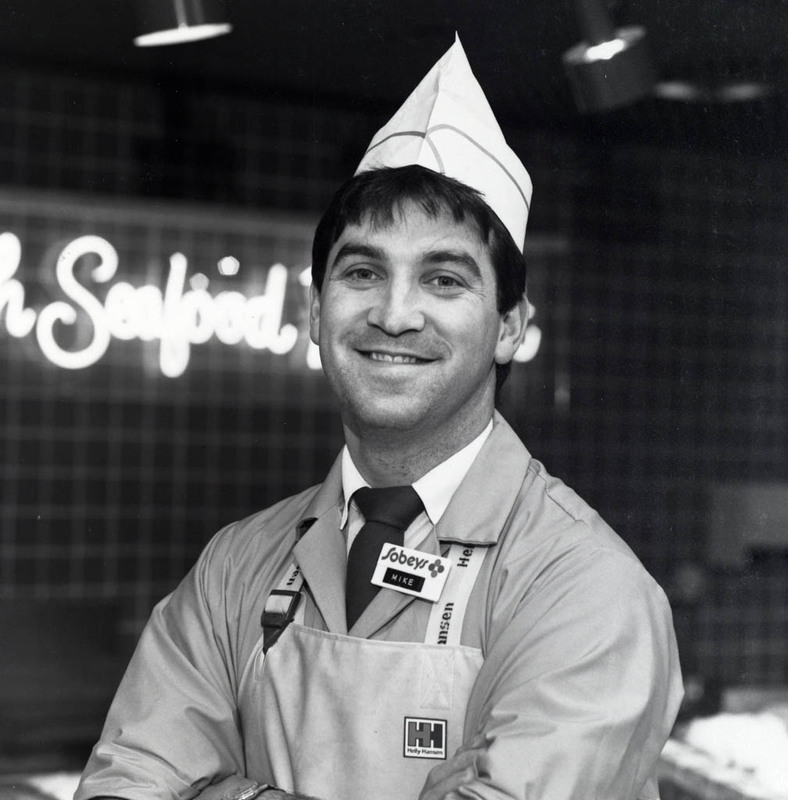 “You’d have to deliver three or four hundred orders (a day), all put up by hand.” – Frank Sobey. 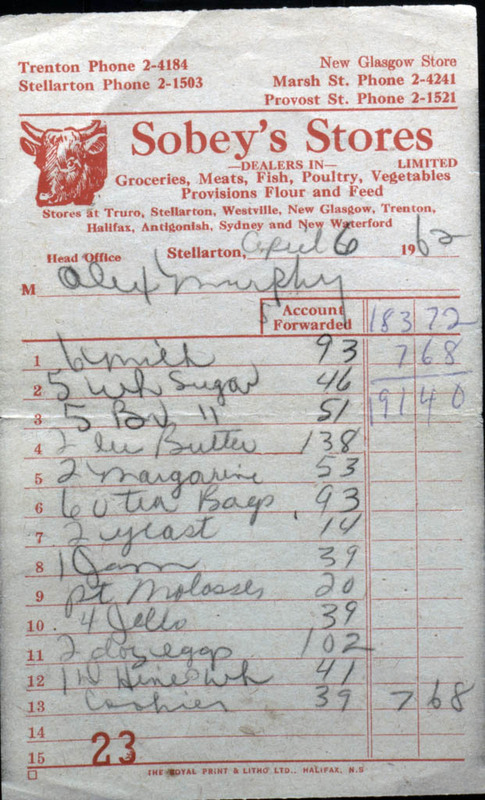 “One Saturday a woman came in and asks if we would mind taking her husband home with her order. He had drunk too much to walk. 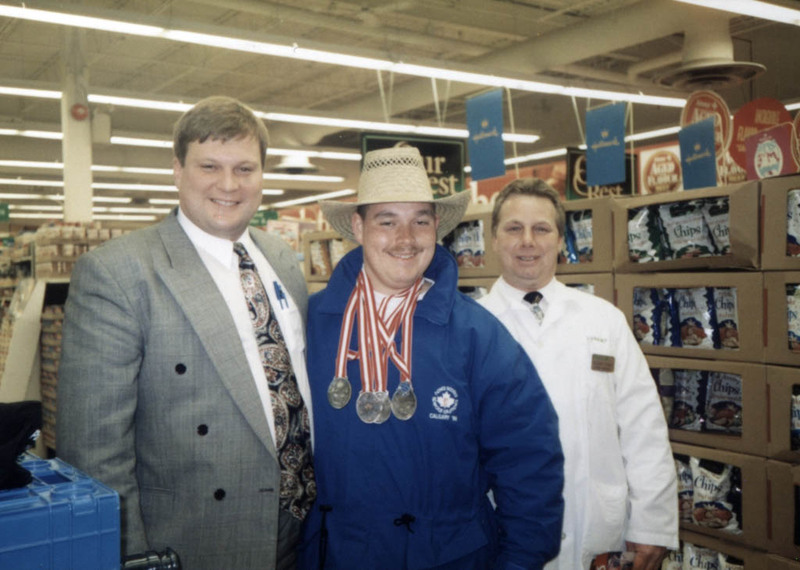 So, we loaded him on the truck and delivered him with the groceries.” – Tom Roy, manager Westville, on special deliveries. 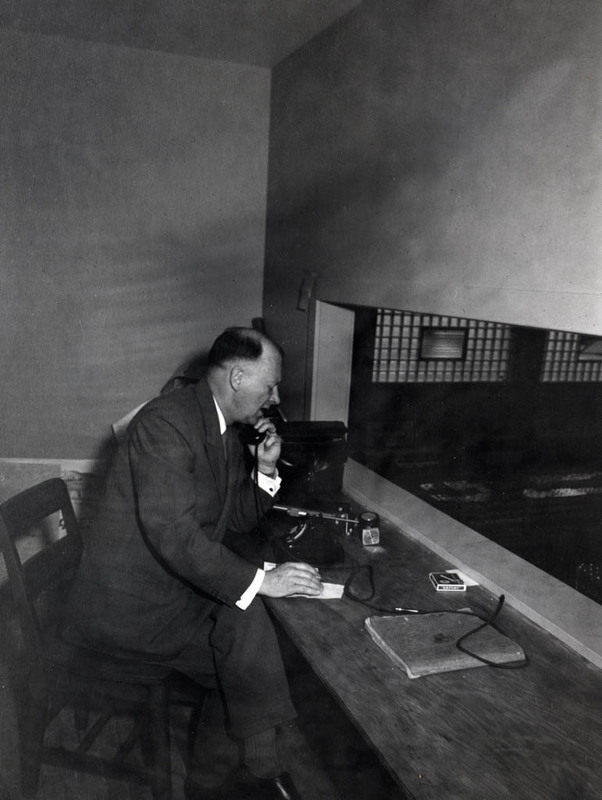 With Canadians suffering, Prime Minister Bennett makes the first of five radio broadcasts to address the nation in the depth of the Depression. 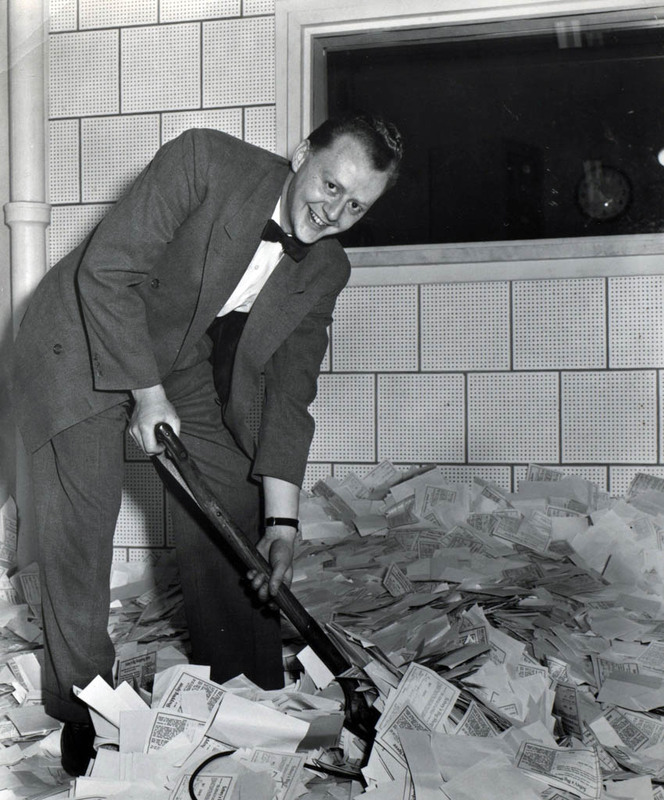 He introduces legislation that became known as Canada’s New Deal. It was reported that Bennett paid for the airtime, approximately $10,000, out of his own pocket. 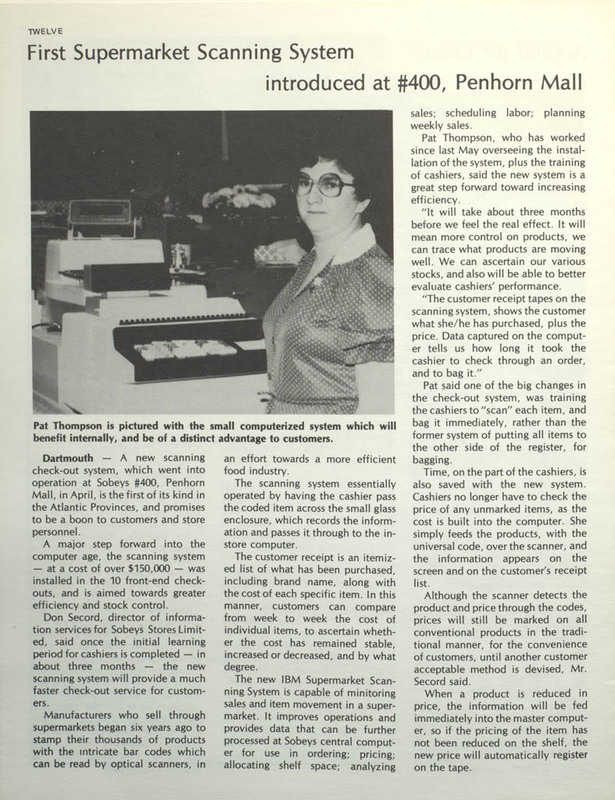 “You made the customer comfortable. You’d say, ‘Good morning, Mrs. Jones, how are you today?’” (Long-time employee Cis Ryan). In the federal election, the Liberals wins a landslide majority. King becomes prime minister for the third time. 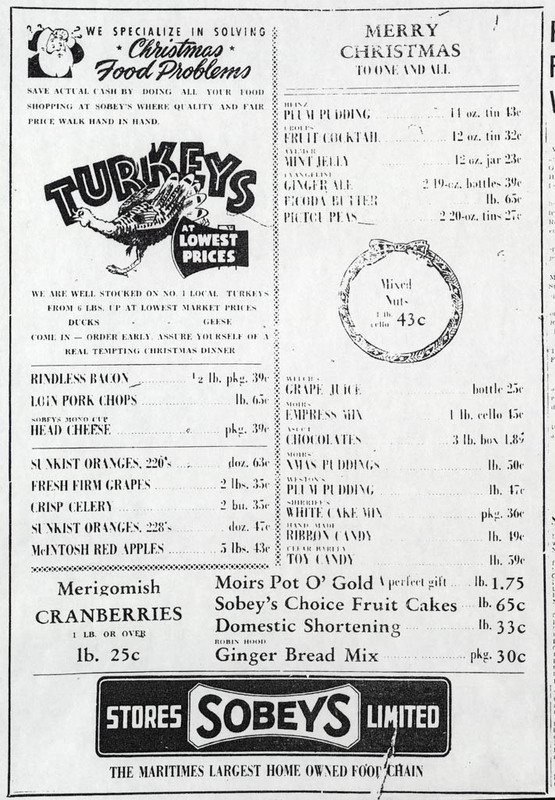 Sobeys was still using local suppliers 80 years later, buying fresh, grain-fed turkeys from Larkin Brothers in P.E.I. 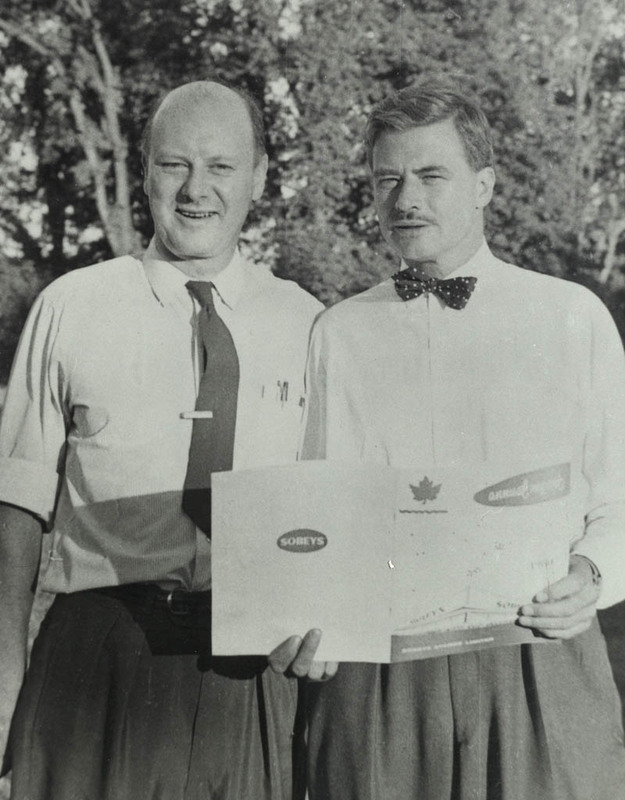 The first regular flight of Trans-Canada Air Lines (now Air Canada) takes place. 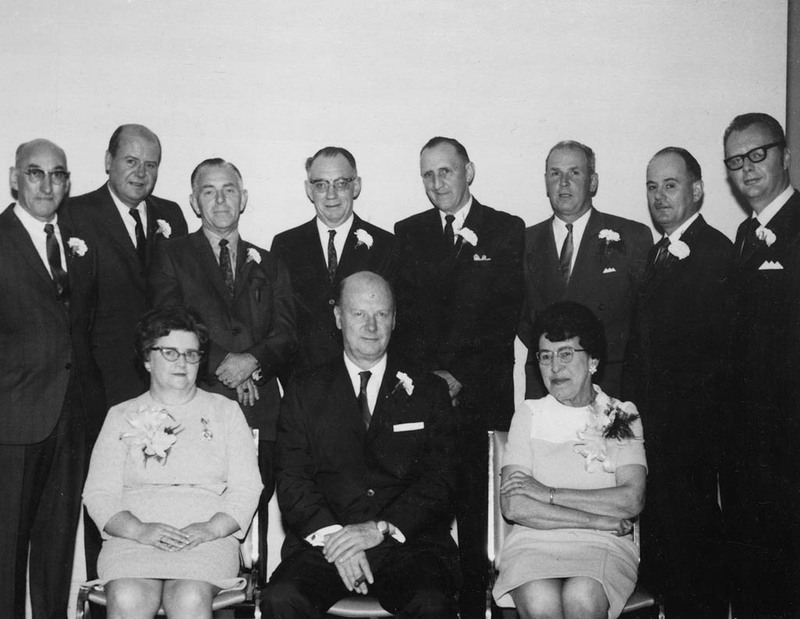 Frank was elected Mayor of Stellarton, a job he held unopposed and unpaid for 22 years. 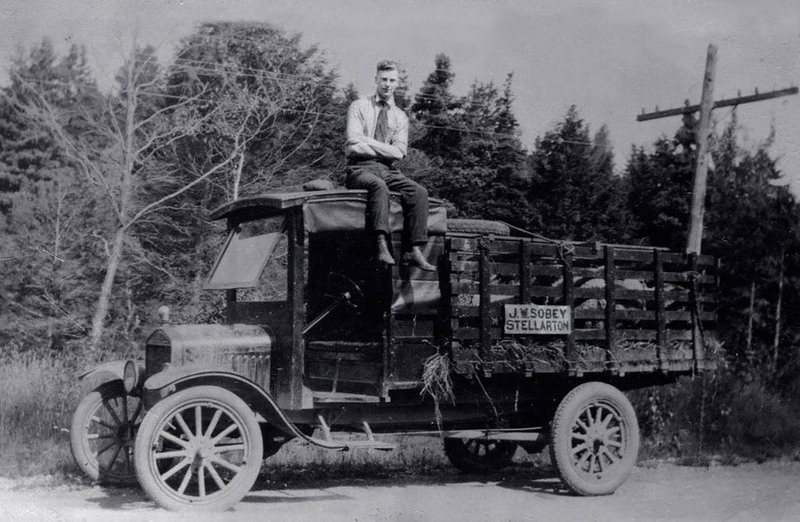 He modernized the town infrastructure, planted hundreds, perhaps thousands of trees, paved streets and finagled money from the Province to make work for the unemployed. 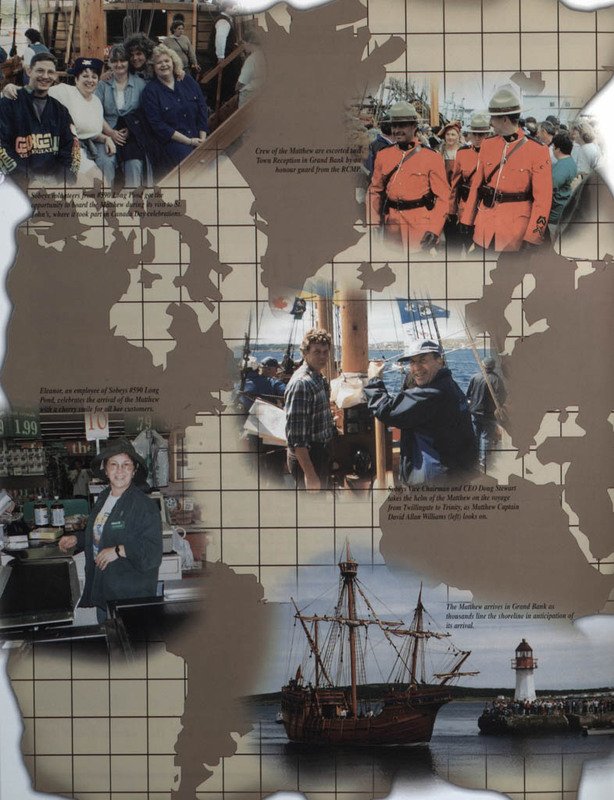 Pier 21 is taken over by the Department of National Defence as a departure point for roughly 500,000 Canadian servicemen and women bound for the Second World War. 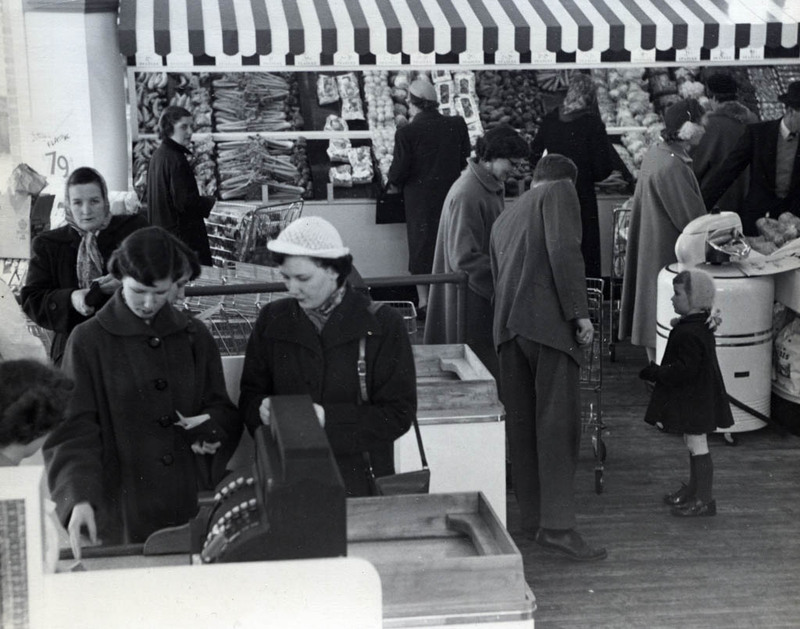 After the war, the soldiers came home through Pier 21 and a tide of war brides returned with them. 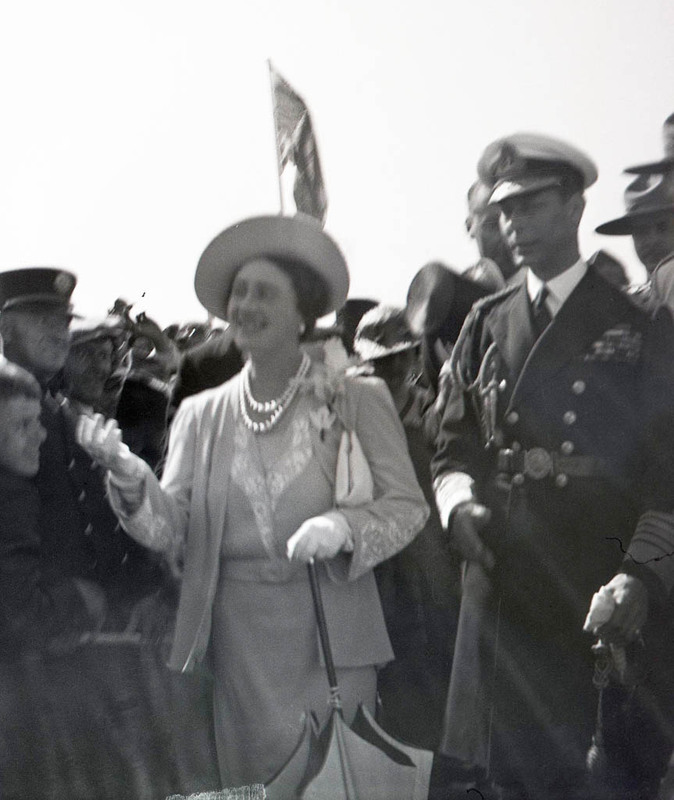 King George VI and the Queen Consort arrive in Canada for a state visit, the first reigning monarchs to visit Canada or any Commonwealth country. 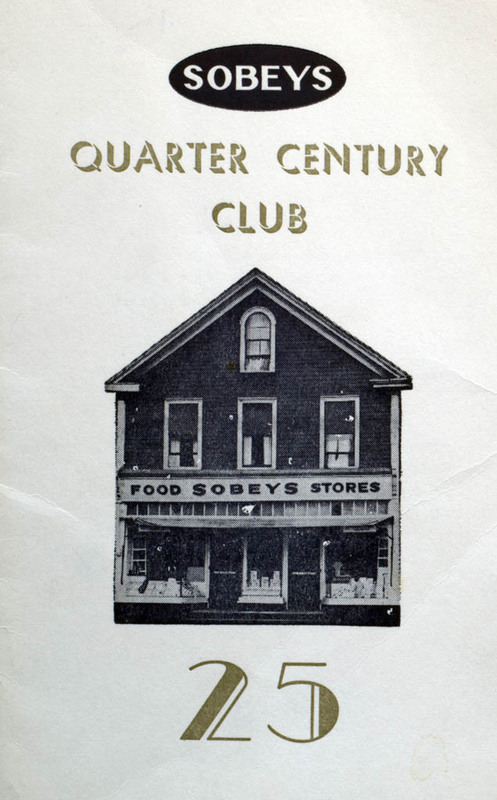 The Sobey family took a leading role in the community. 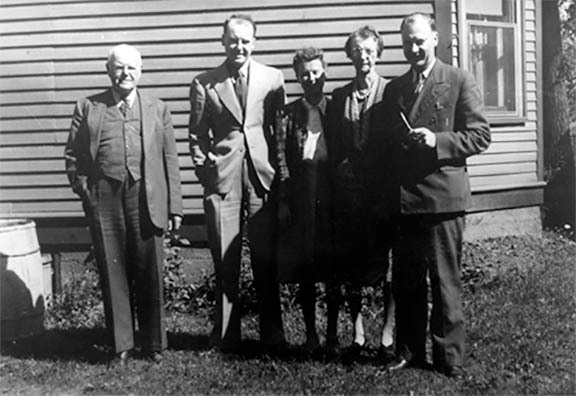 Eliza Sobey was active in her church and J.W. curled and sponsored the Monarchs softball team. 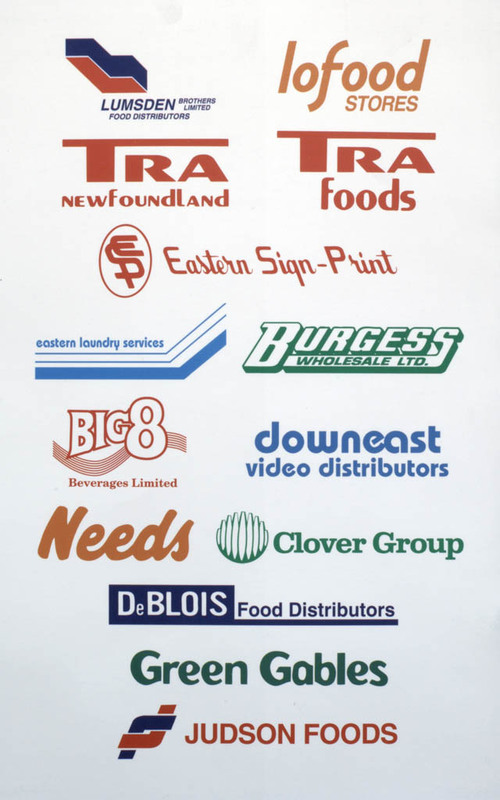 The family now operated six stores, including one in neighbouring Antigonish County. King’s Liberals retain power with an overwhelming majority in the House of Commons. The couple drive coast-to-coast, with a stop in New York at the Radio City Music Hall. In Los Angeles they “met quite a few actors and actresses. 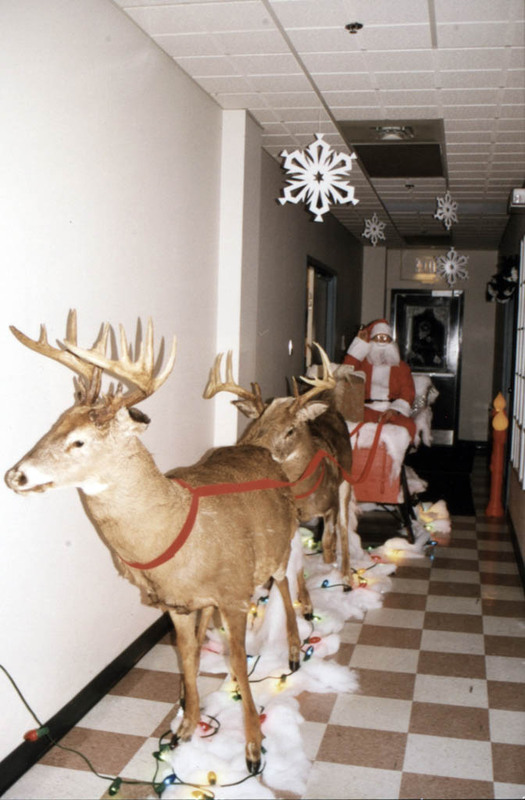 … It was all very exciting,” Frank reminisced years later. Coast-to-coast car travel was uncommon in 1940. 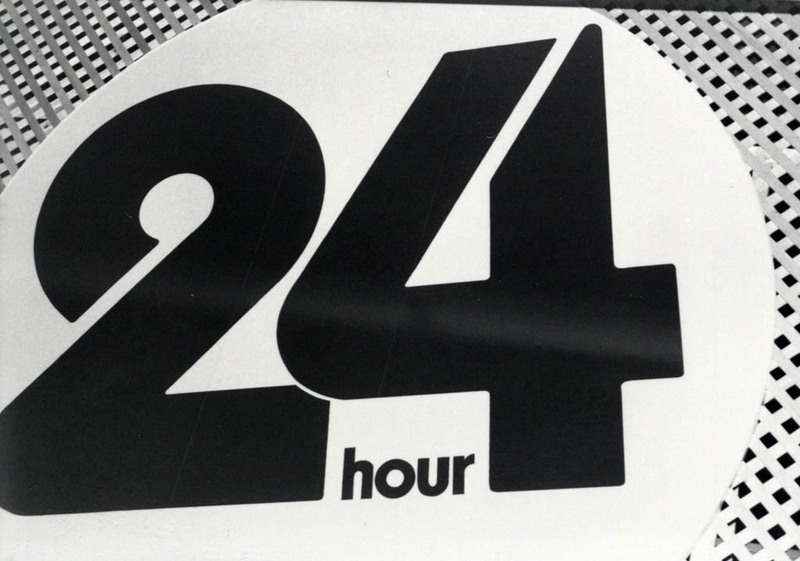 The CBC introduces its own national news service, with Lorne Greene as the first announcer. 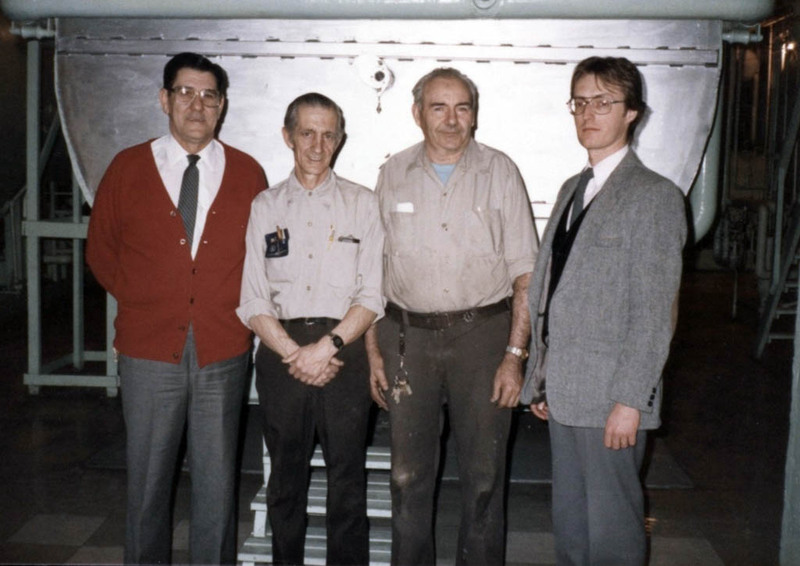 “Father always believed – and mother, too – in us working,” said Donald Sobey, whose brother David was delivering groceries at age 9. 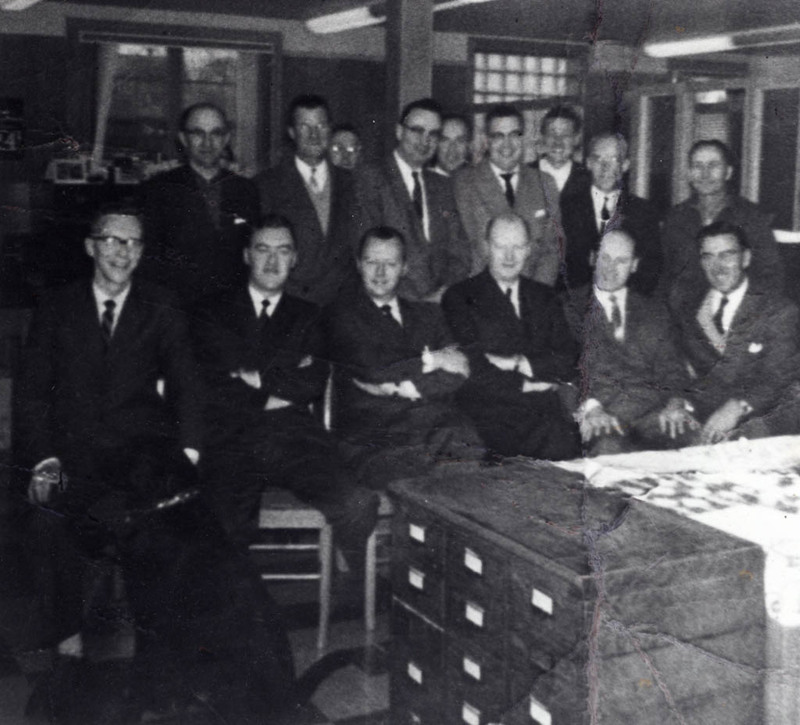 Canada’s Mackenzie King and the U.S.’s F.D. Roosevelt sign the Hyde Park Declaration, uniting the economies of the two countries for war. Canada’s population is now 11.5 million. 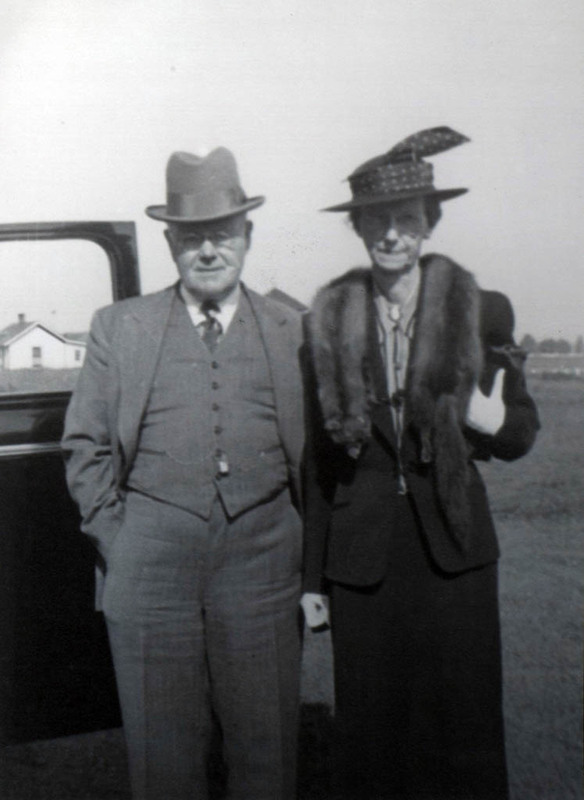 “During the war (Irene and I) worked very hard – men were scarce, most of the good men headed for overseas. 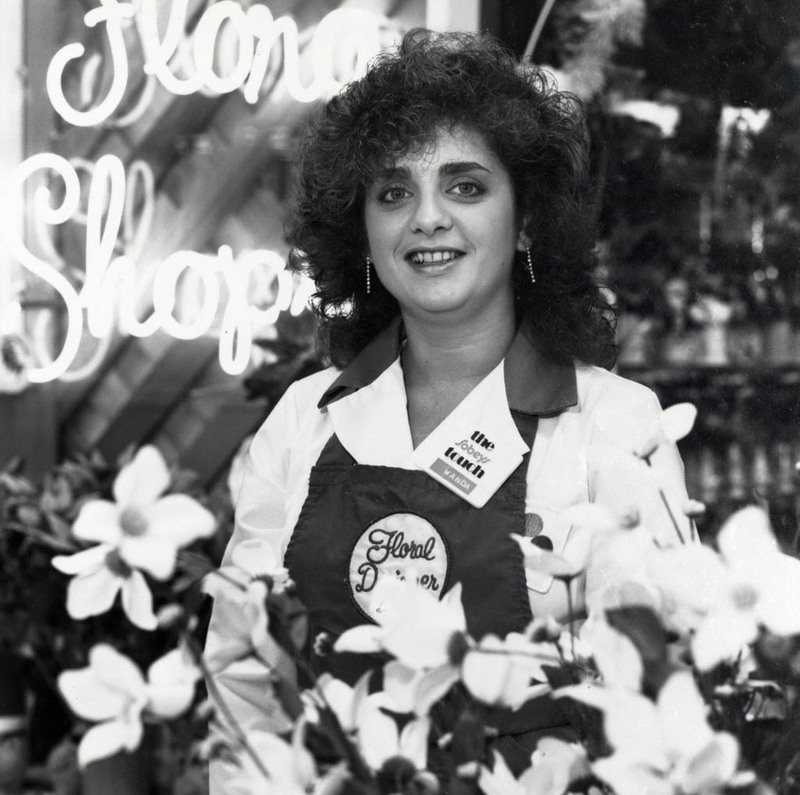 (Women) were running our stores.” – Frank Sobey. 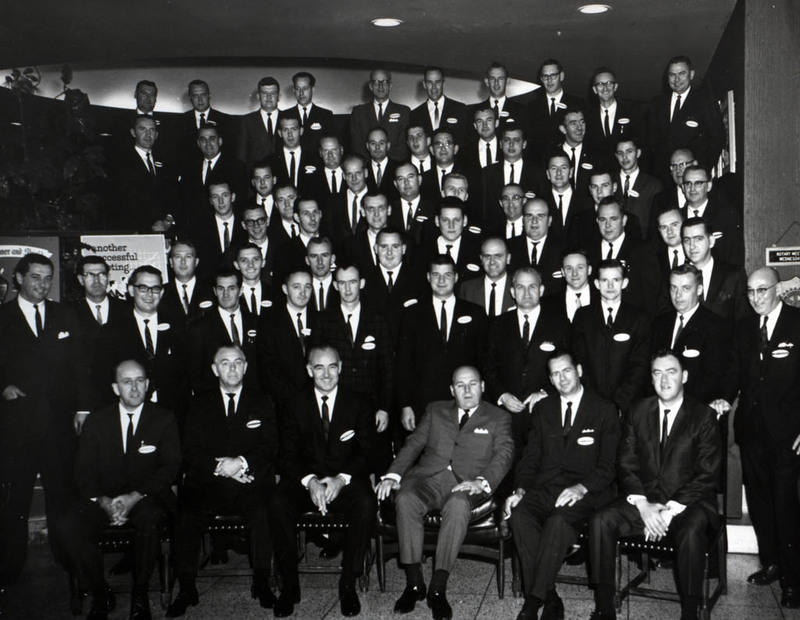 The men came home to their jobs but this experience stayed with Frank who became an early advocate of women in management jobs. 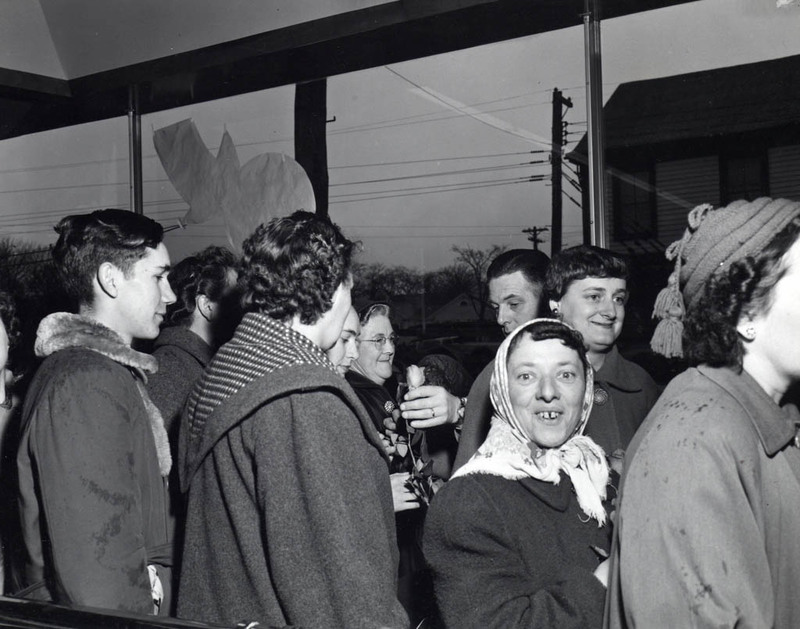 At war's end, Canadian immigration regulations remain unchanged and restrictive. But with a great demand for labour, Canada gradually re-opens its doors to European immigration. 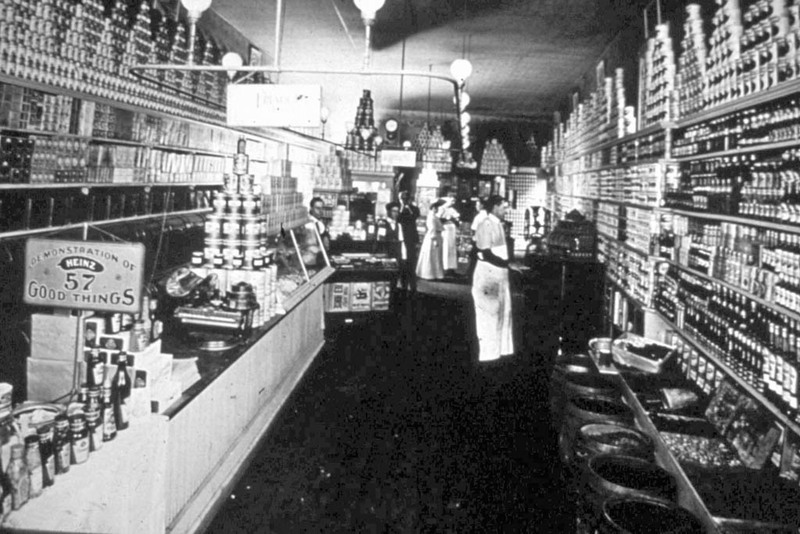 Irene said, that as early as 1924, “Frank had laid out his plans … everything he intended to do and build, step by step, and then he did it, all of it.” Frank incorporates Sobeys Stores Limited. The ship Mauretania docks in Halifax. 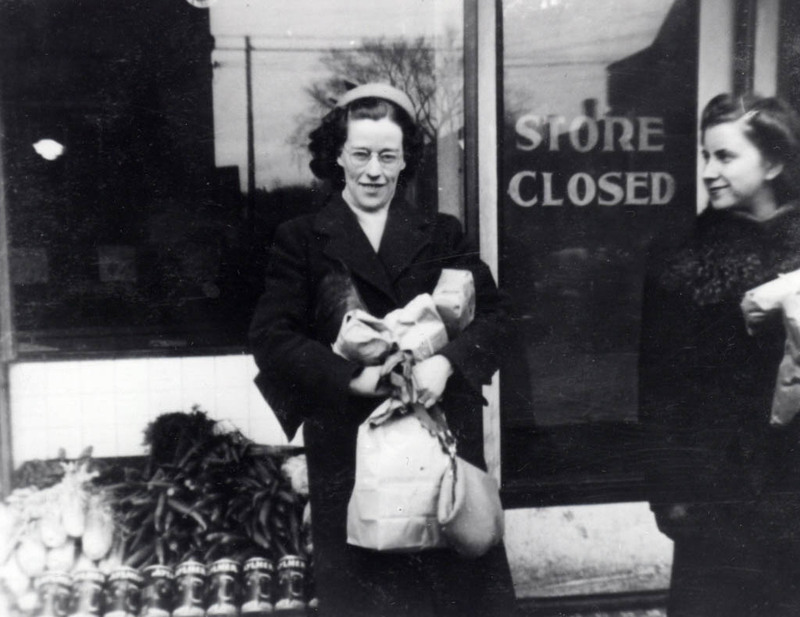 It was carrying 943 war brides and children from England who entered Canada through Pier 21. 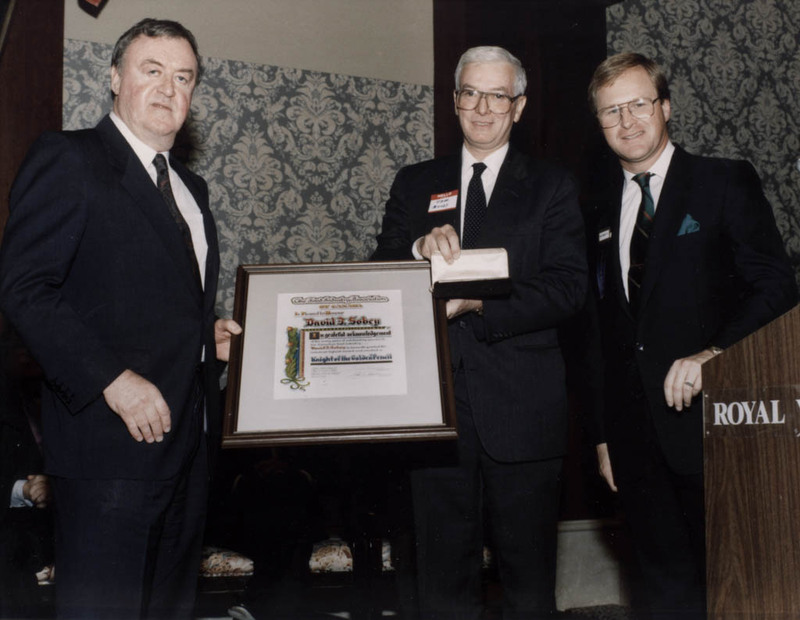 In Ontario, Maurice Wolfe’s son – Max’s grandson – Ray joins the company, and would rise to Oshawa group president, lead expansion, earn the Order of Canada and become a leading Canadian advocate for Israel, the Jewish people and Canadian-Israeli co-operation. The Citizenship Act extends the right to vote federally and provincially to Chinese Canadian and South Asian Canadian men and women, but ignores Indigenous peoples, who wouldn’t get the vote until 1960. “Stick around, Cis, we’re going places.” Harold Sobey to Cis Ryan prior to the opening of #25. Cis Ryan advanced to head cashier at #25 (New Glasgow) and then became Sobeys long-serving cashier trainer. She was also called on to resolve problems at other stores. 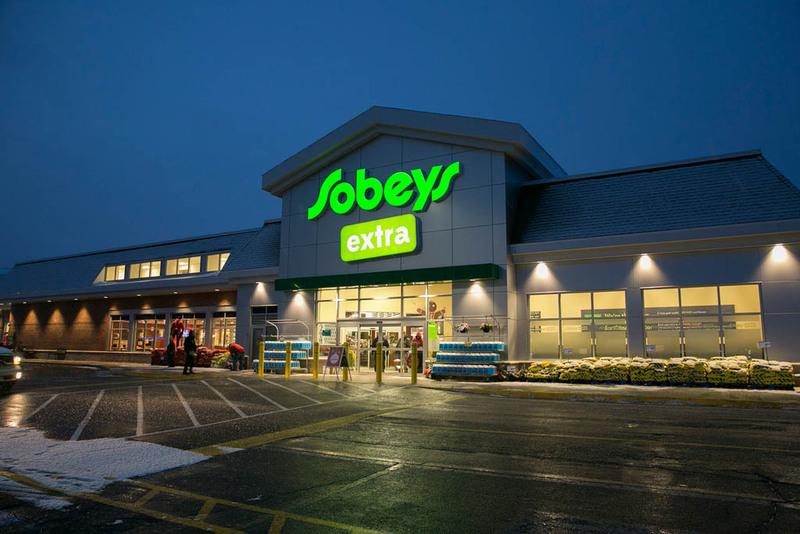 Sobeys opens two new groceterias. A Canadair North Star aircraft from the Experimental and Proving Establishment based in Rockcliffe, Ont., completes the first non-stop trans-Canada flight from Vancouver to Halifax. 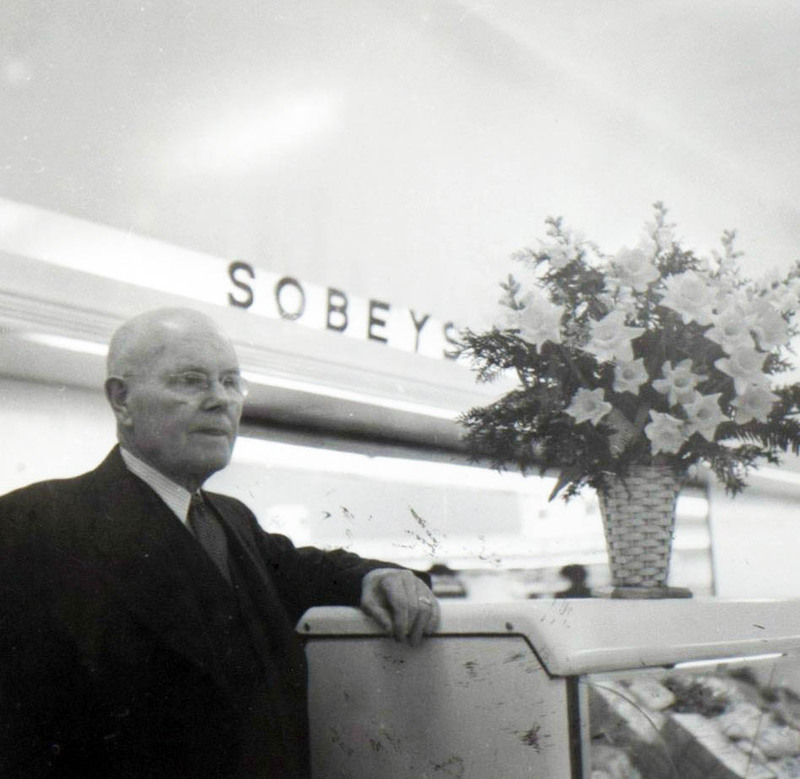 The founder of the Sobeys grocery business, J.W. 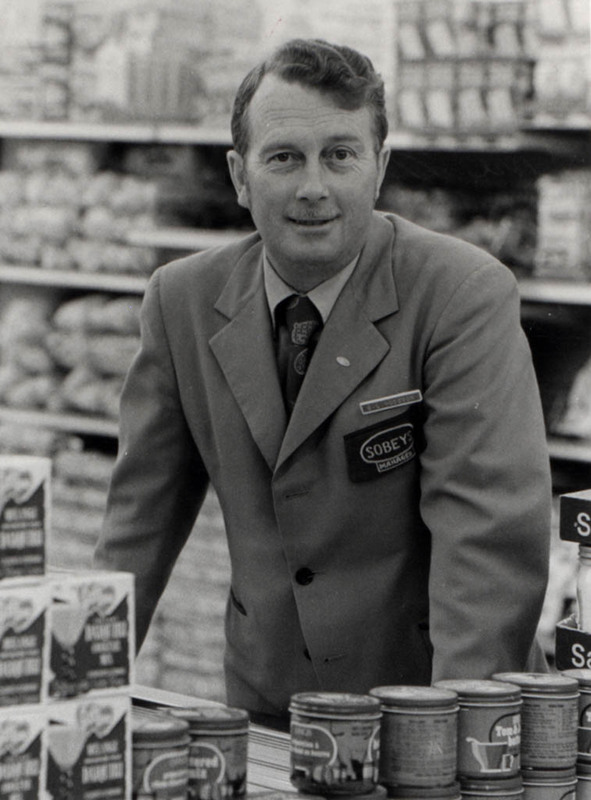 Sobey, dies on Nov. 24. Stanley G. Grizzle organizes the first celebration of February as Black History Month in Canada at Toronto's British Methodist Episcopal Church. 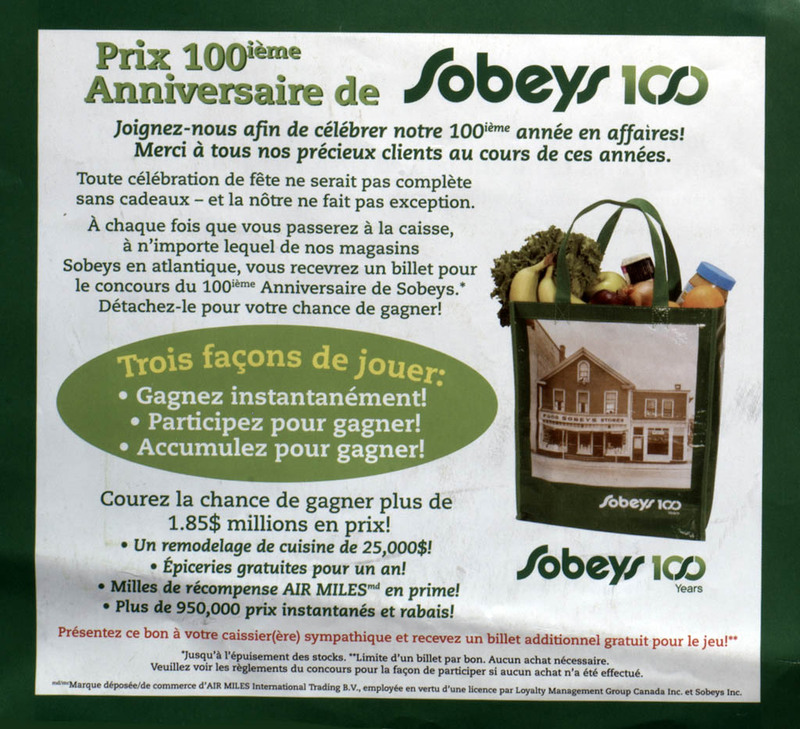 To encourage “competent and caring management” Sobeys promotes employees who come up through the ranks and are imbued with the Sobeys culture. A new Old-Age Security Act comes into effect, providing universal pensions to those 70 and over. 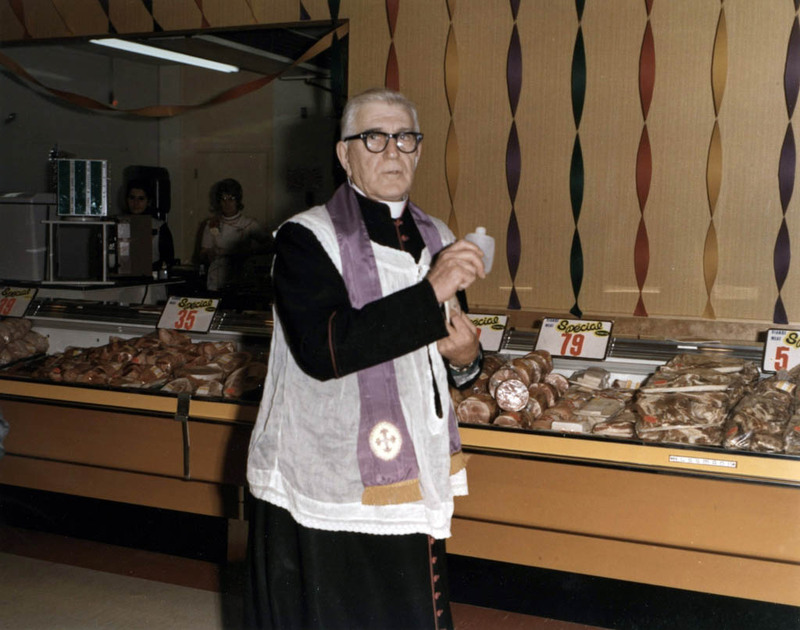 Frank drops into the Marsh Street, New Glasgow, store looking for manager Cis Ryan. “We’re going to have a pension plan. The best pension plan this country has ever seen. I want your name on the top of the sheet,” he told Cis. 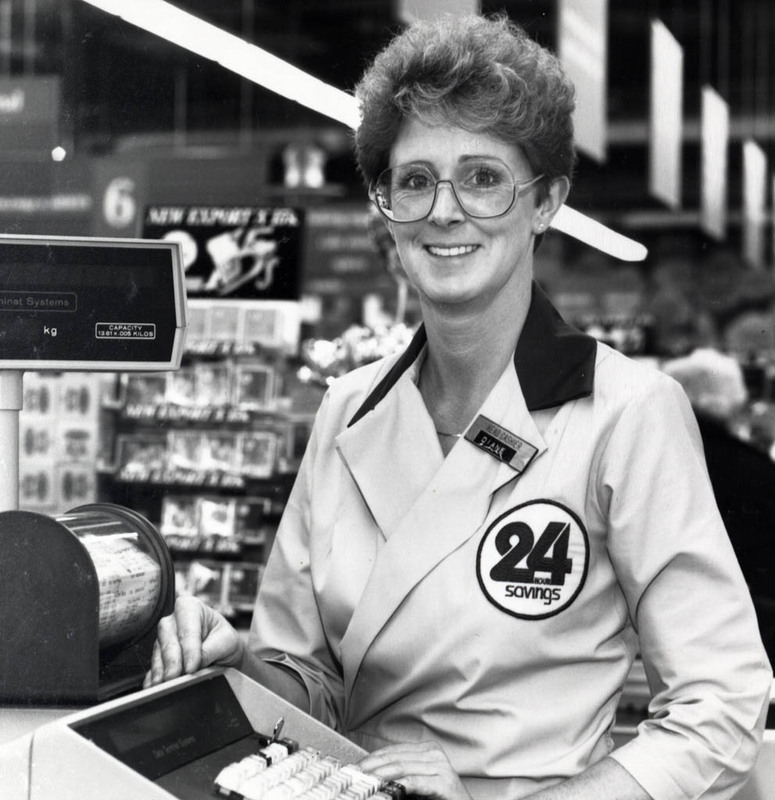 Months later, Sobeys had an employee pension plan. 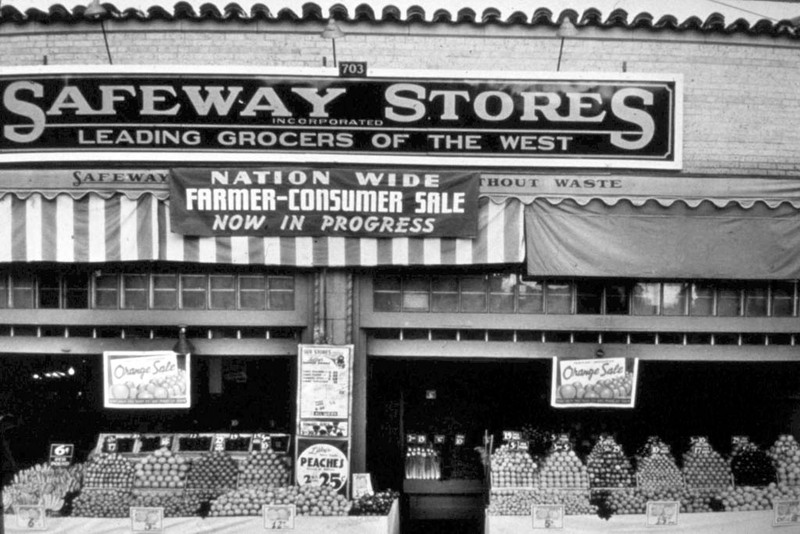 Safeway has the same philosophy, and extends a retirement plan to its 100,000 employees. In 1952, while his eldest daughter, Princess Elizabeth, was touring Africa, King George VI dies at the age of 56. Just 25 years old, Elizabeth becomes Queen Elizabeth II, Queen of — among other places — Canada. Vincent Massey is the first Canadian-born governor-general. 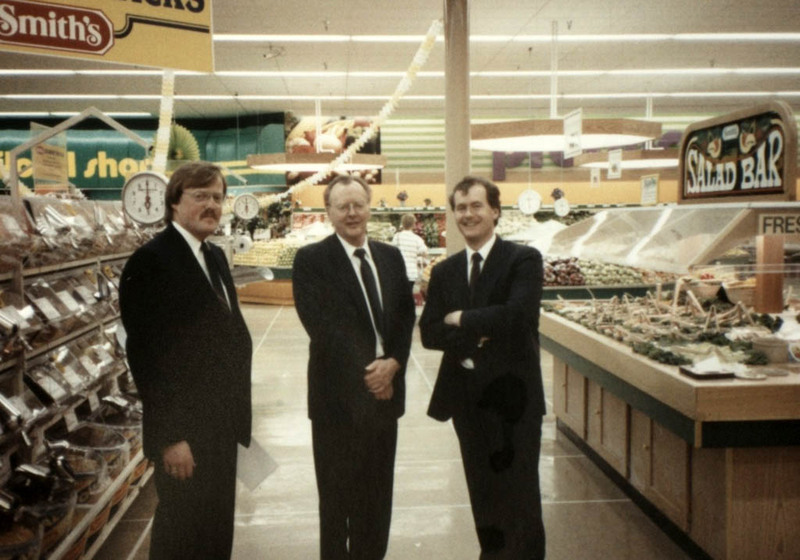 While Sobeys continues to grow, Frank’s sons, Bill, David and Donald, will each join the business and what started as one grocery is on a journey from small town Nova Scotia to a national chain. The Canadian Army’s last major battle of the Korean War in 1953 is brutal. The 3rd Battalion Royal Canadian Regiment endured constant enemy shellfire and wave upon wave of assaults. 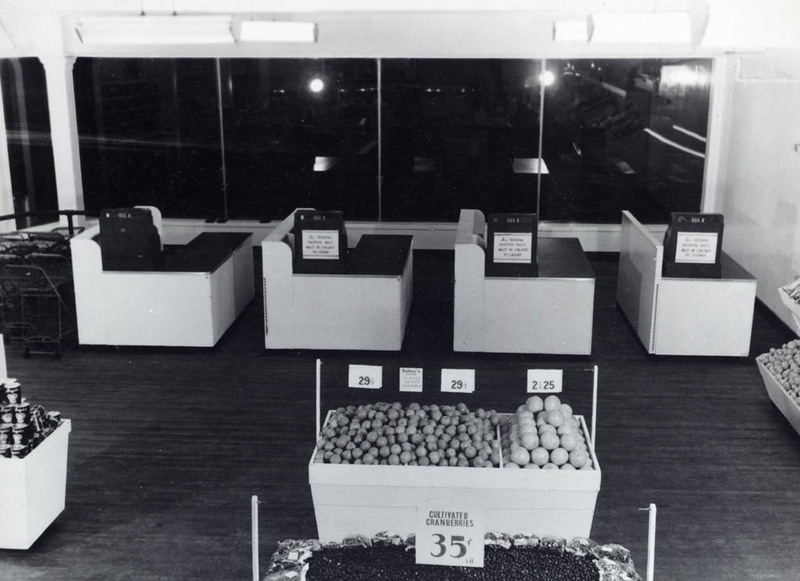 Grocery carts and parking lots become store fixtures. 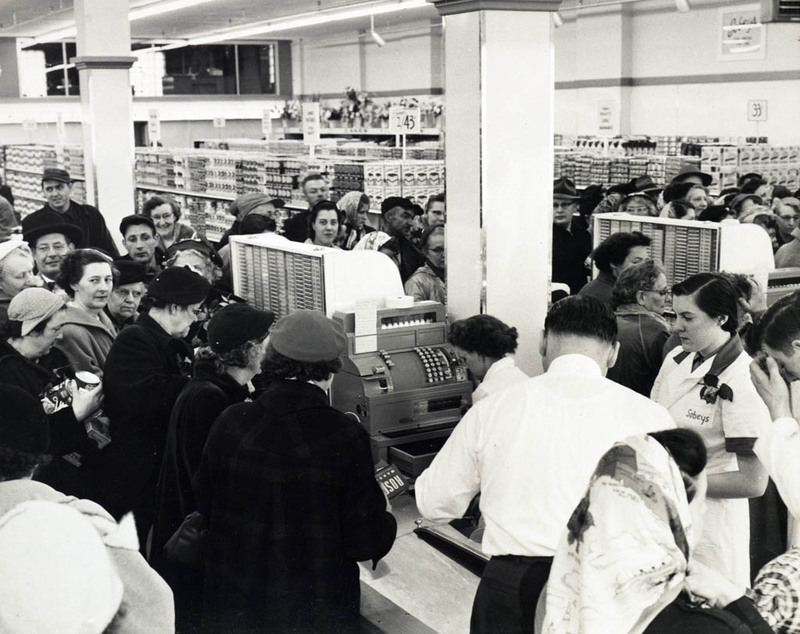 Customer continuity programs are popular. Safeway offers a new volume of an encyclopedia each month. Open-top displays appear. 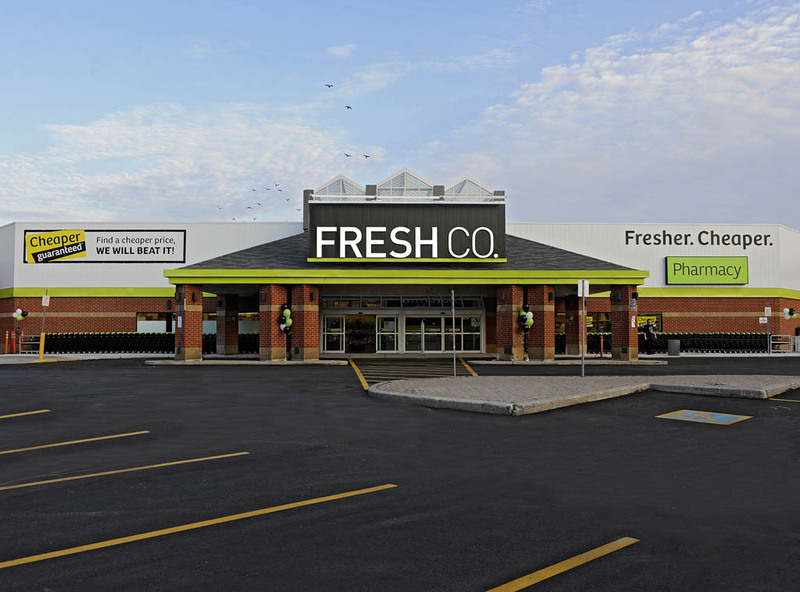 The Oshawa group, M. Loeb and Hudon & Orsali obtain IGA franchises and expand in Ontario and Quebec. 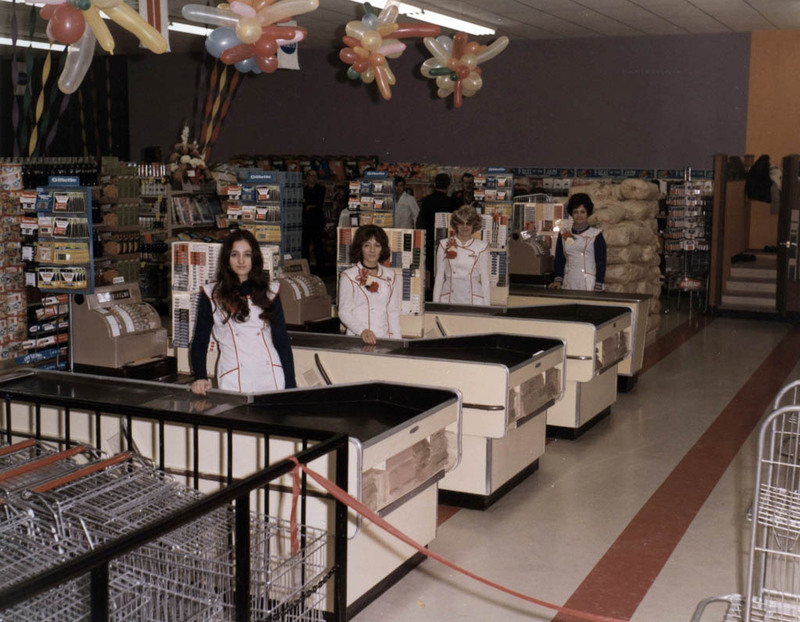 By the decade’s end, the first discount supermarket in Canada – Food City – is opened by the Oshawa Group. The Soviet Union, competing for the first time in the World Ice Hockey Championship in 1954, defeats Canada 7-2 to win the tournament. 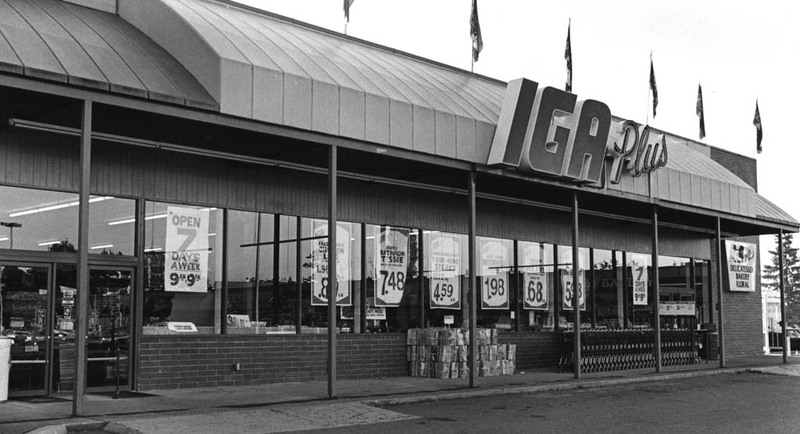 The first IGA in Alberta opens in Bow River. Horne & Pitfield’s predecessor, Codville and H.Y. Louie bring the chain to Alberta, Manitoba and B.C. The federal government passes a law guaranteeing equal pay for women doing "identical or substantially identical" work as men. 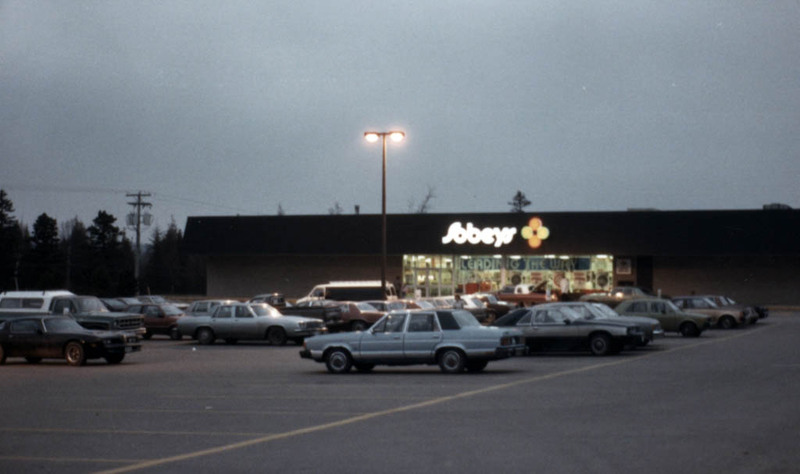 With stores in Yarmouth and Amherst, Sobeys spans Nova Scotia. It moves into New Brunswick with a Saint John location. 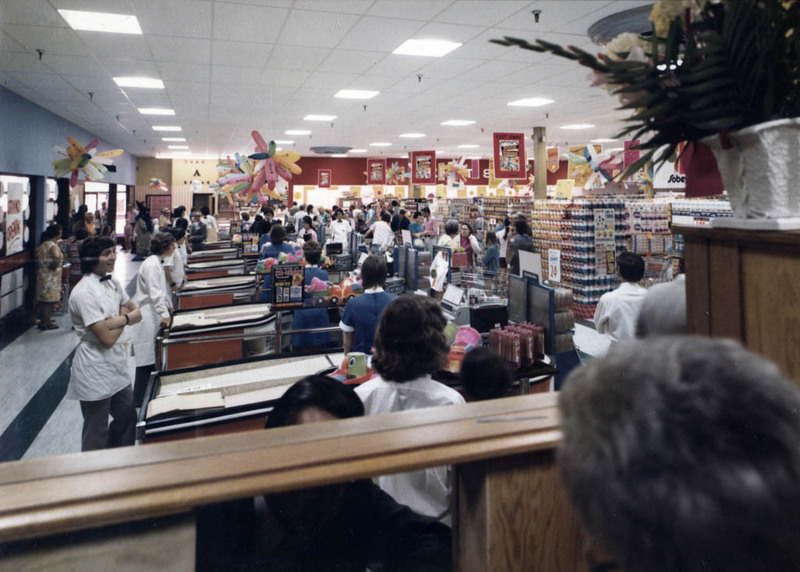 New features include “Snack Shops” and check-out product racks. 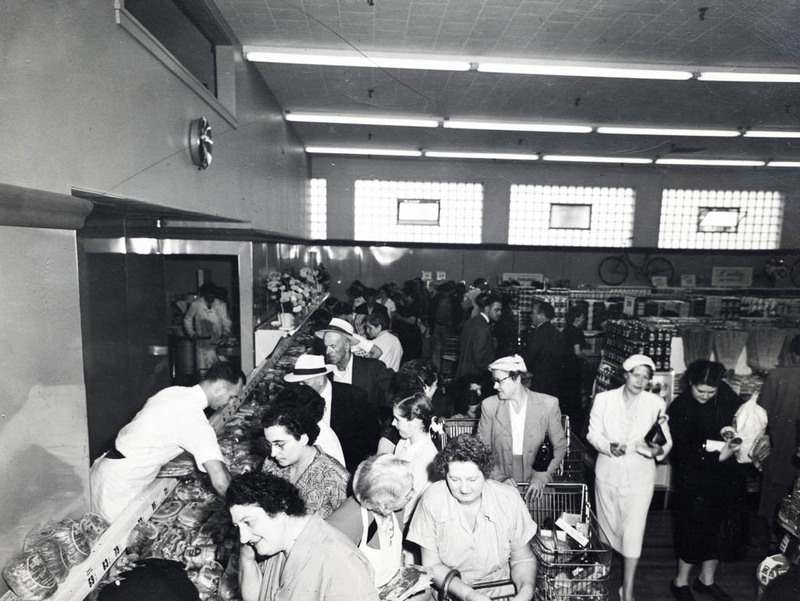 Store openings are big local events creating lots of buzz with gate-crasher specials, gifts, and contests. Hundreds of people would line up to get in. 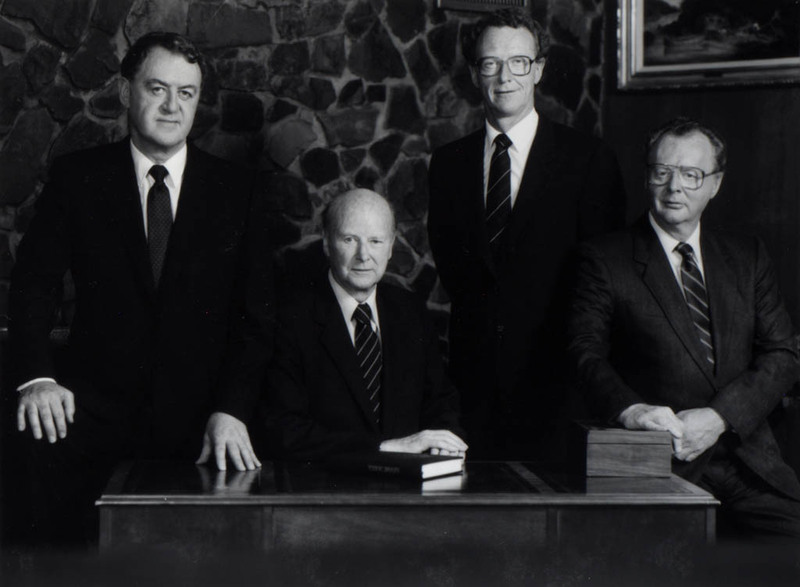 In the federal election, the Progressive Conservatives under John G. Diefenbaker win a minority government. 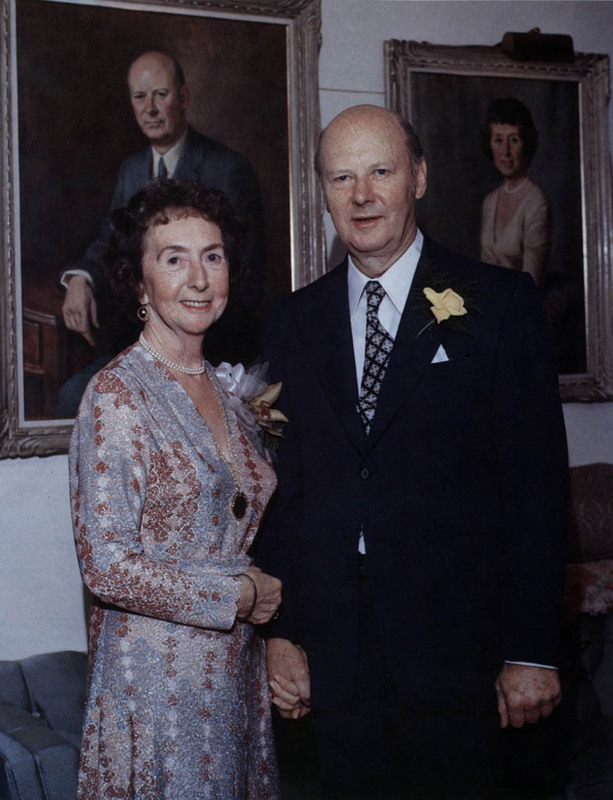 Diefenbaker became the first prime minister from western Canada, and appoints Ellen Louks Fairclough the first woman in the federal Cabinet. 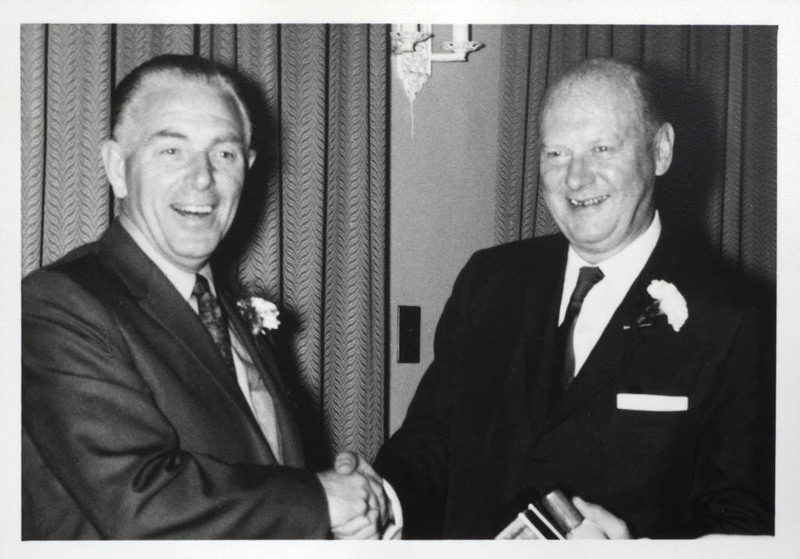 Nova Scotia Premier Robert Stanfield asks Frank to become the first president of Industrial Estates Ltd., the province’s innovative, private-sector-led economic growth engine. Frank took the job, and $1 a year. 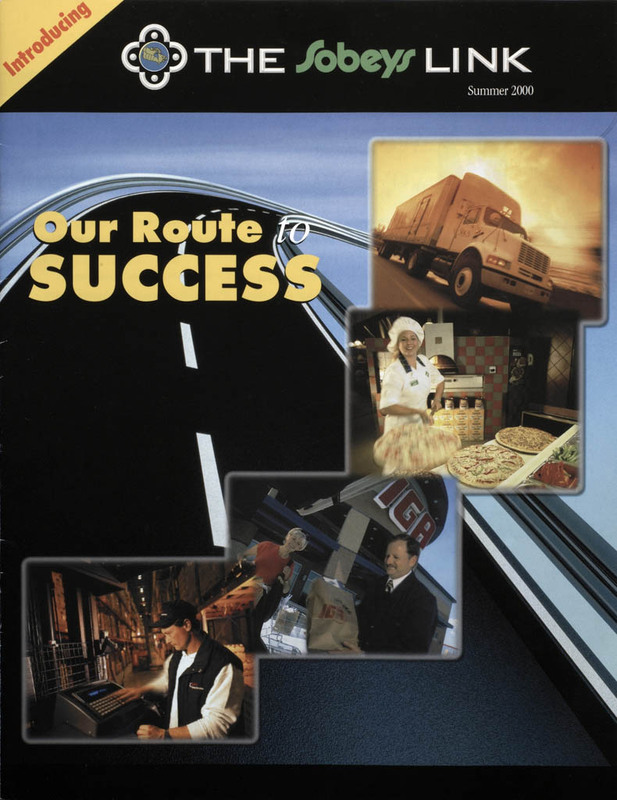 IEL’s successes in attracting new enterprises and jobs became a model for other provinces and other nations. J.W. 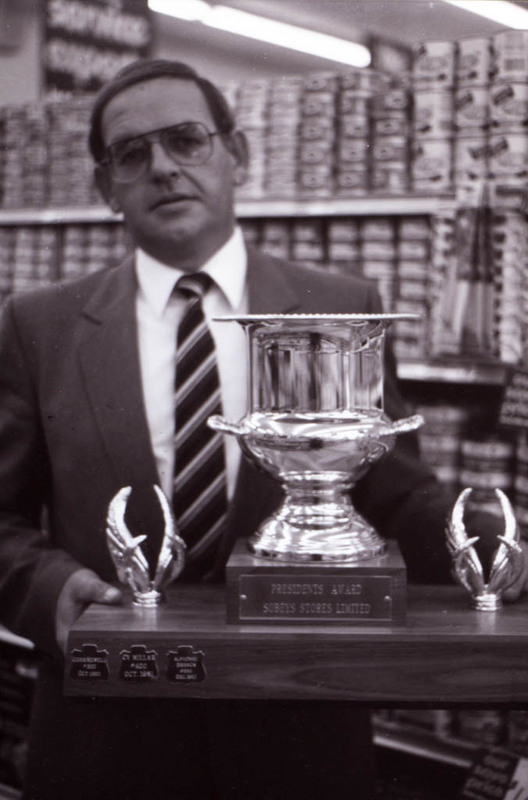 and Frank Sobey left a legacy of generosity and public service that has become a Sobeys hallmark. 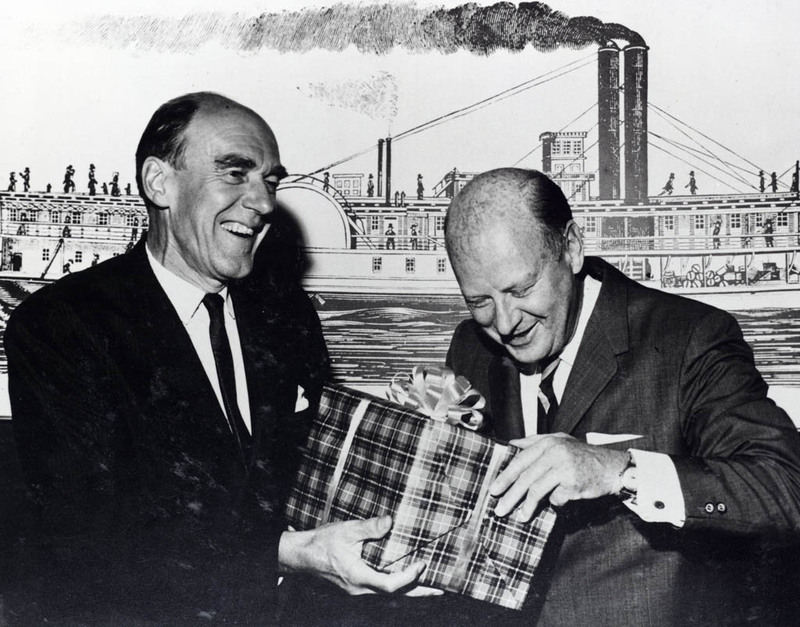 Queen Elizabeth II and U.S. President Dwight Eisenhower dedicate the St. Lawrence Seaway and it opens to commercial shipping. 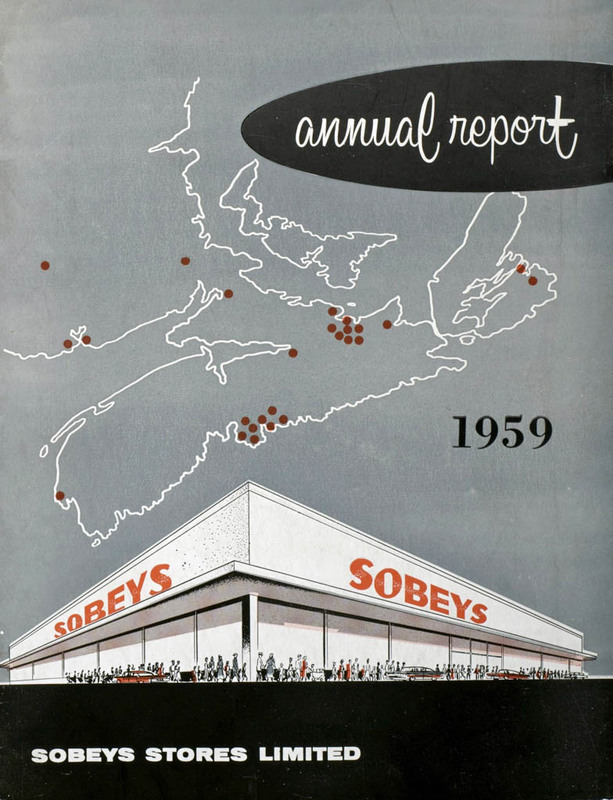 Sobeys issues its first annual report and initiates its initial public offering. While Status Indians obtain the vote, thousands of Indigenous children are taken from their families by provincial and federal social workers and placed in foster or adoption homes. 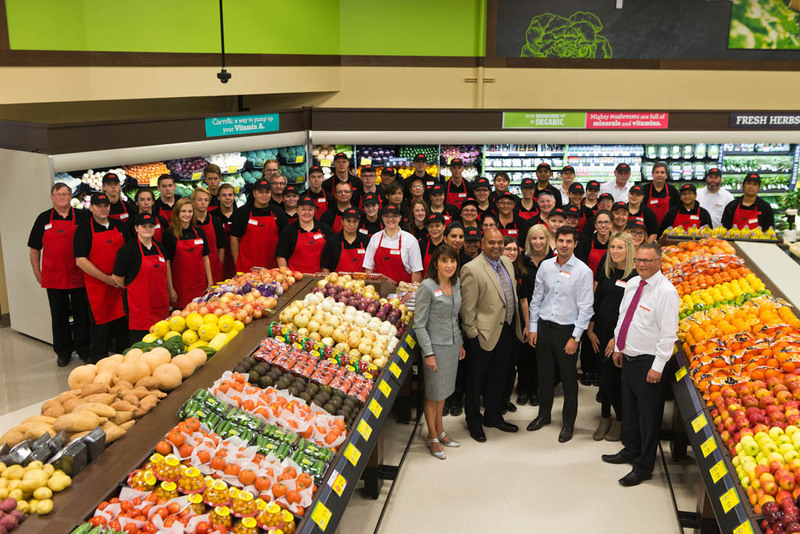 Sobeys opens its first store in P.E.I. 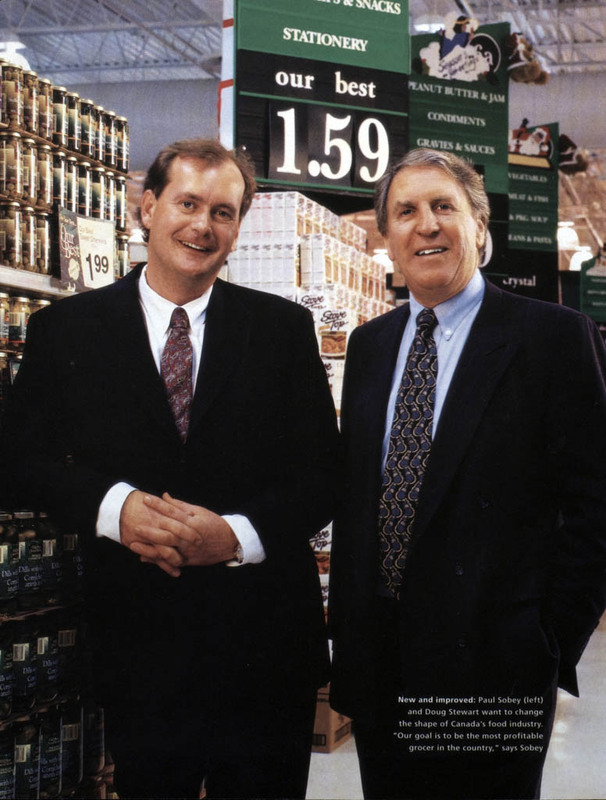 Frank’s son William (Bill) Sobey and brother Harold Sobey are Vice-Presidents of Sobeys. Margaret Atwood receives the E.J. Pratt Medal for Double Persephone. 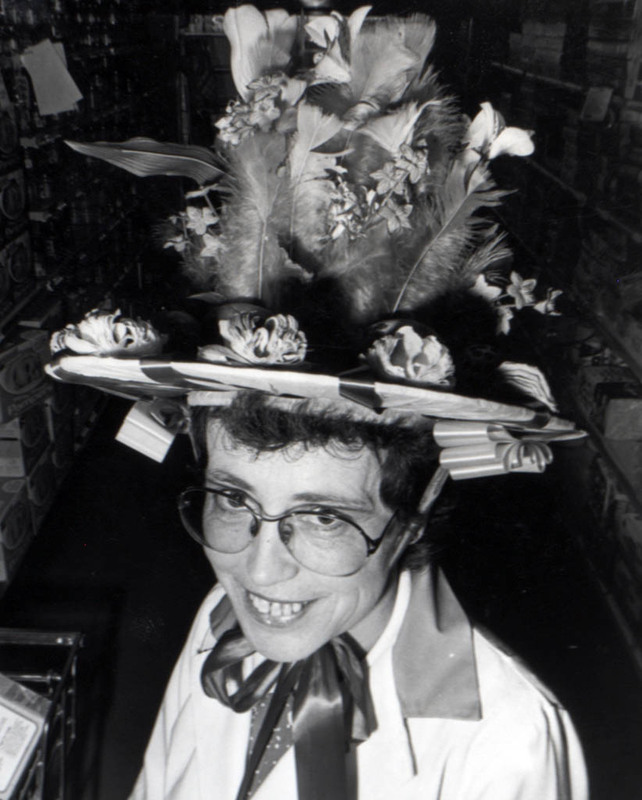 Five years later her reputation as a poet is established with a Governor General's Award for The Circle Game. 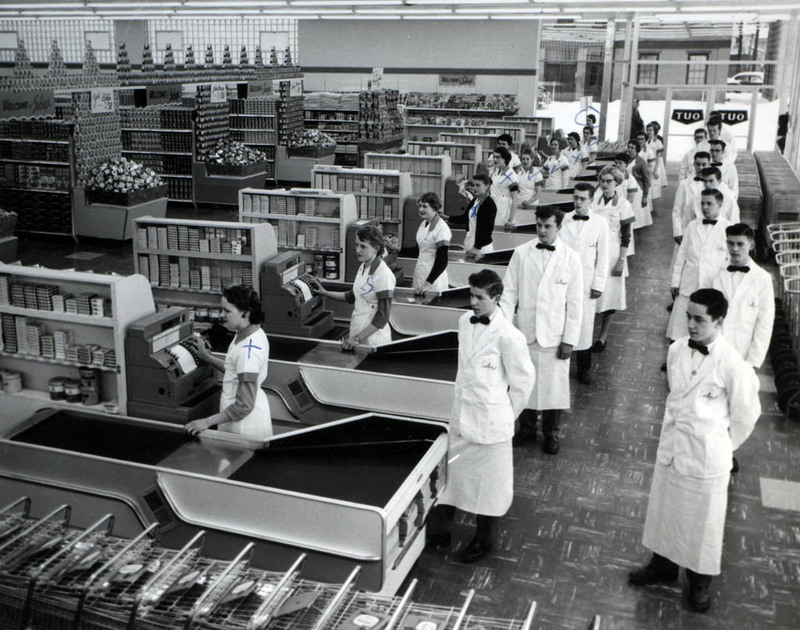 The last person the customer deals with is the cashier, so the interaction is very important. 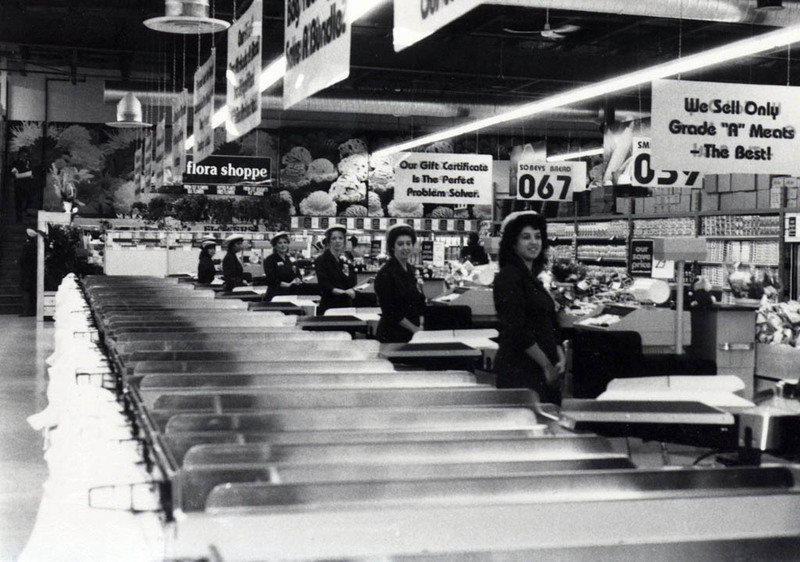 In 1961 Sobeys begins to recognize cashier excellence. 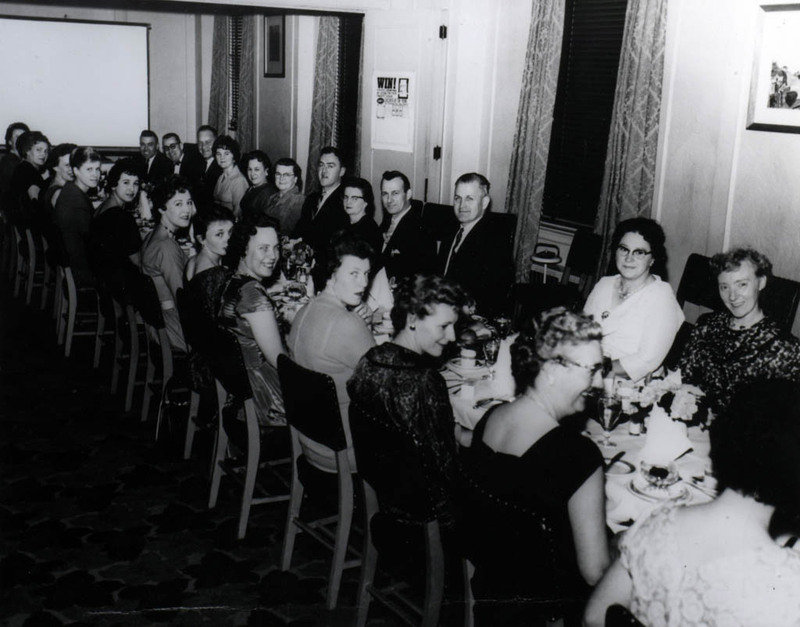 Customers vote for their favourites and the finalists are feted at banquets in Saint John and Halifax. 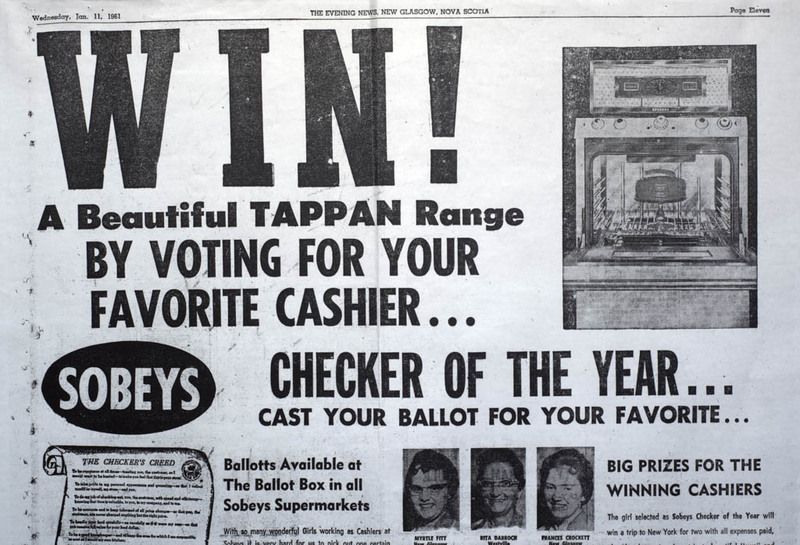 A Checker-of-the-Year is chosen in each Maritime province. 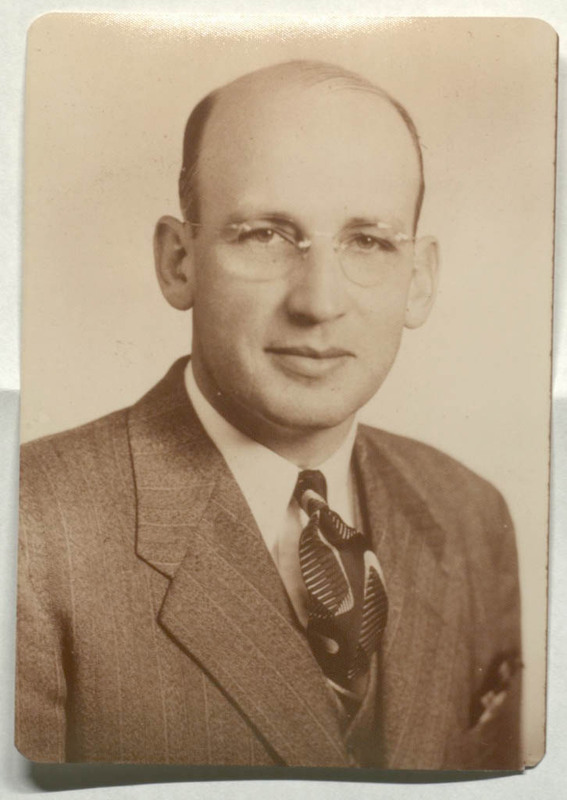 Frank Sobey’s mother, Eliza Sobey, dies in January. 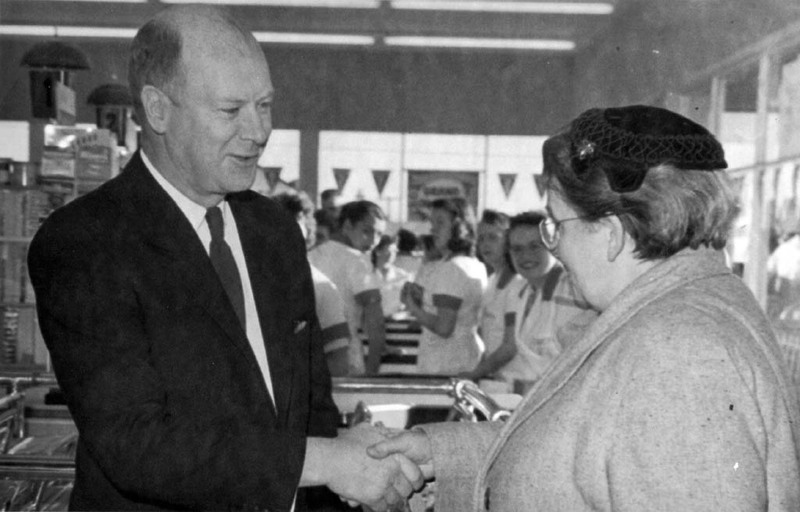 Minister of Citizenship and Immigration, Ellen Fairclough, reforms Canada’s Immigration Service, most notably eliminating the White Canada policy and ending racial discrimination in immigration. The Trans-Canada Highway is officially opened. 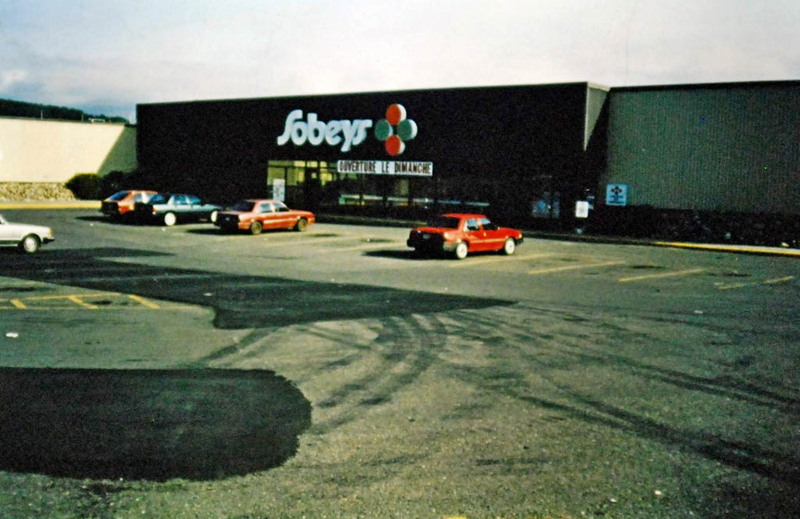 Sobeys has 39 stores in the Maritime provinces, with 525 full-time and 415 part-time employees. 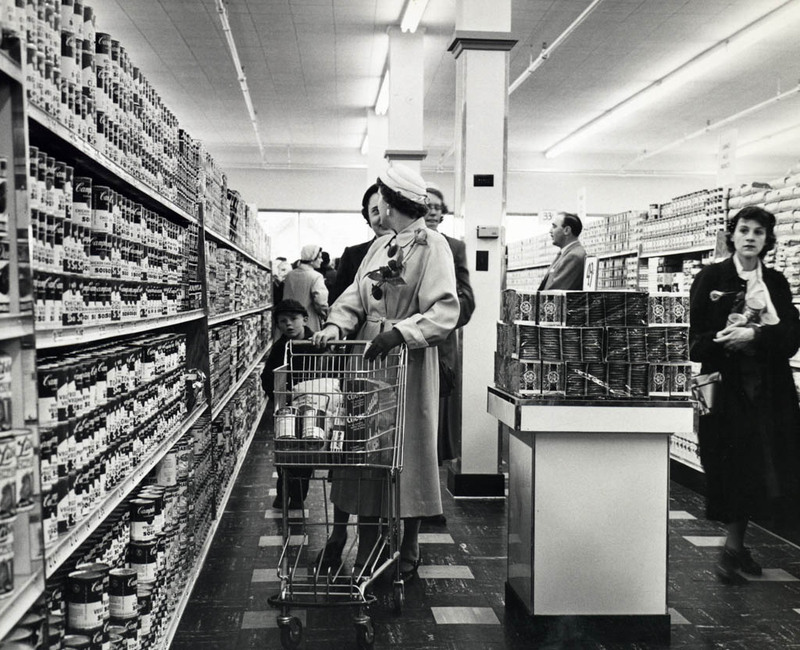 Safeway opens 11 stores in England and, the next year, it opens stores in Australia and Germany. Diefenbaker's government is defeated in the House of Commons on a non-confidence motion over nuclear weapons policy. Liberals regain power in a minority government. Lester Pearson becomes PM. 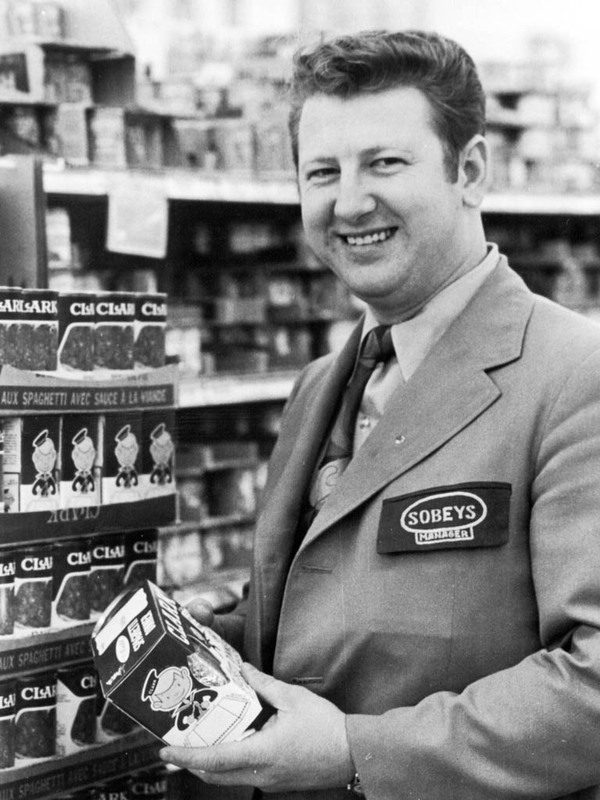 Sobeys institutes a cashier training school and continues its advanced training program for supervisors and managers. 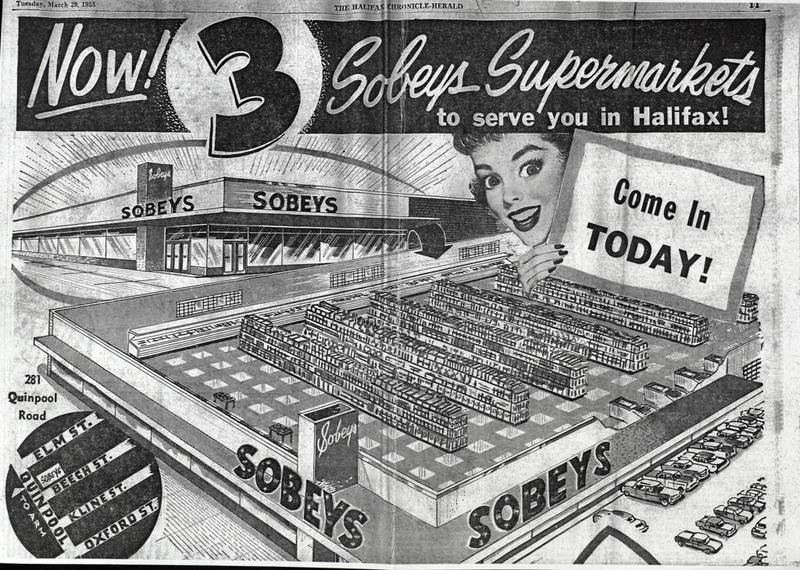 Sobeys’ new Halifax Shopping Centre store will become the largest food market in the Maritimes. Prime Minister Pearson opens the flag debate by presenting his preferred design to Parliament. Known as the Pearson Pennant, it depicted three red maple leaves joined at one stem. It was panned and a committee was appointed that selected the current national flag. Northern Dancer becomes the first Canadian horse to win the Kentucky Derby. 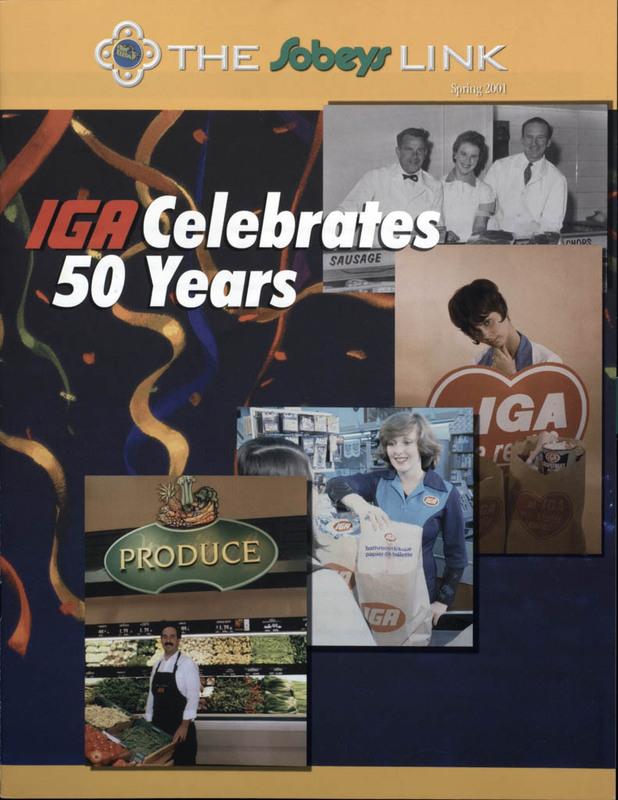 Canadian franchisees and wholesalers purchase IGA in Canada from its American parent and Ray Wolfe becomes the first president of IGA Canada. 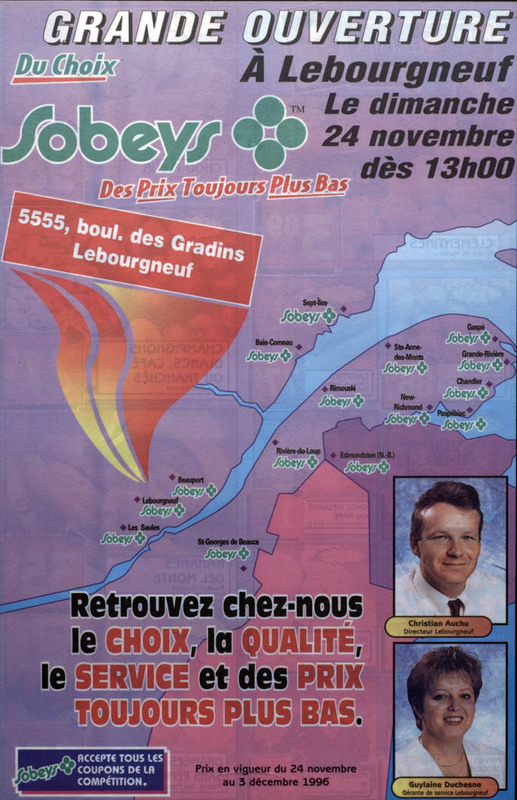 Sobeys enters Quebec with a store in Paspebiac and a year later, opens a store in New Richmond. 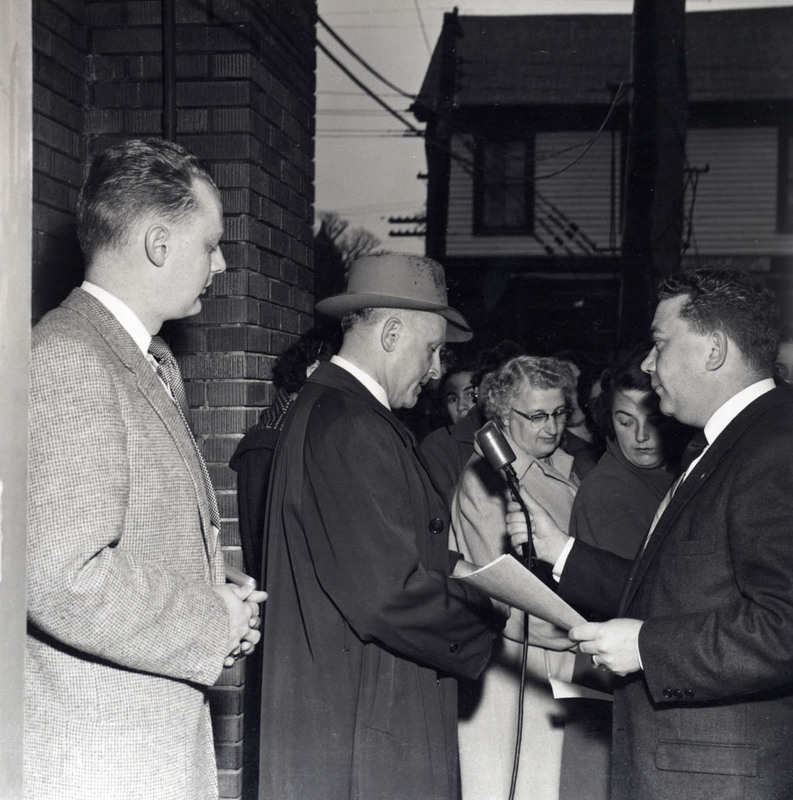 Prime Minister Pearson and President Lyndon Johnson sign the Canada-U.S. 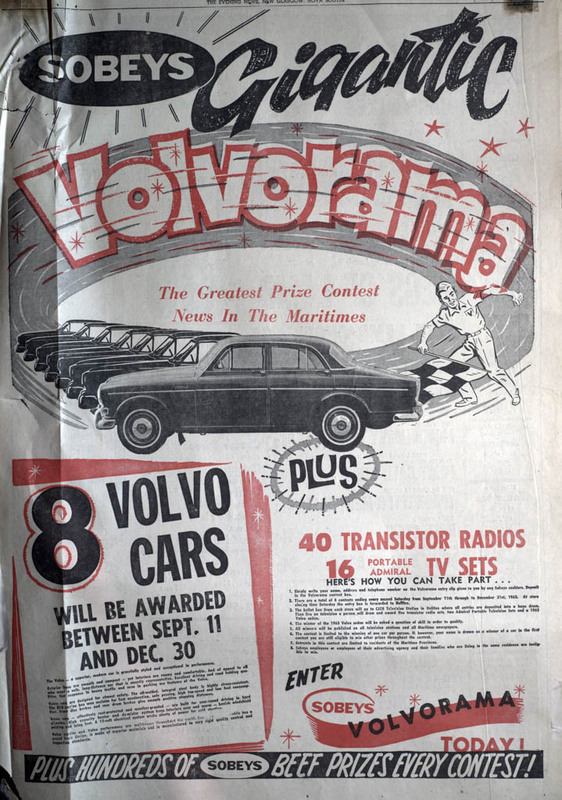 Automotive Agreement. Canadian pitcher Ferguson Jenkins makes his professional debut with the Philadelphia Phillies against the St Louis Cardinals. 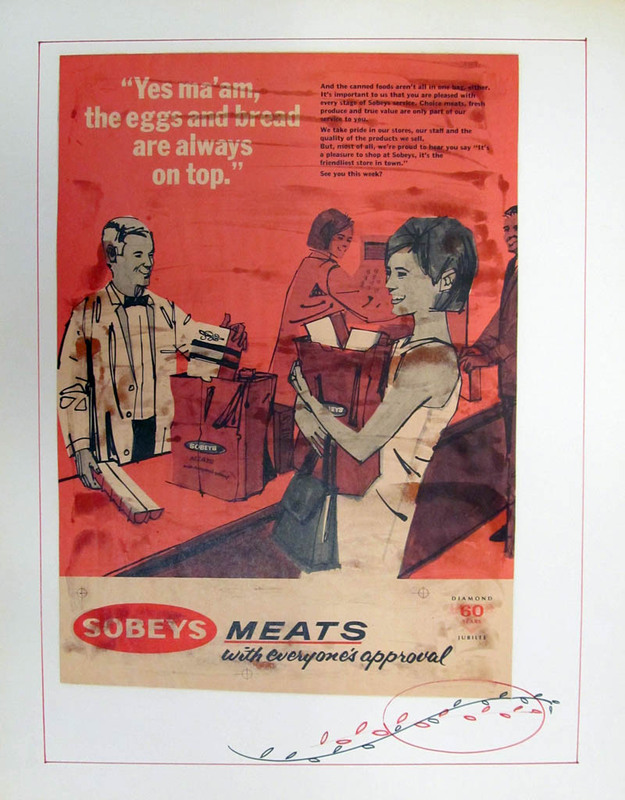 A new slogan & jingle takes Sobeys back to its beginnings in the meat business. 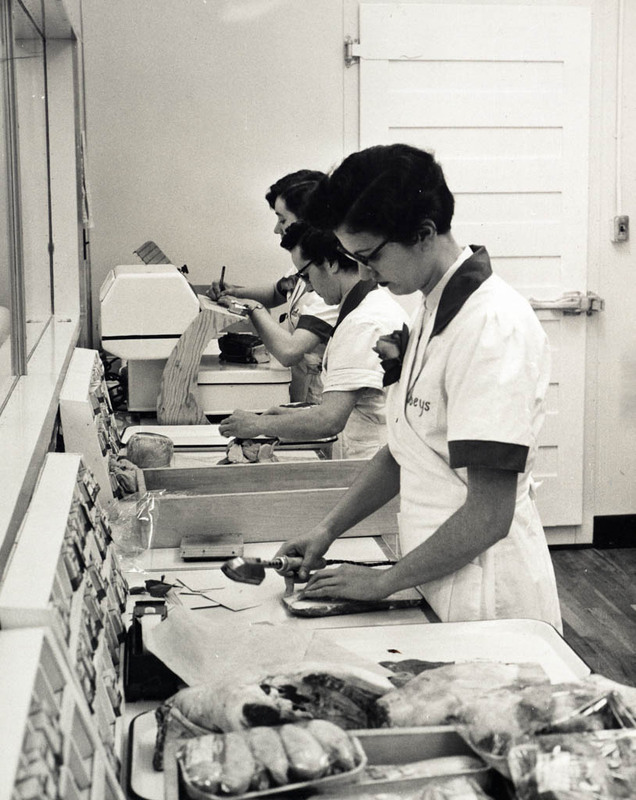 Quality meat products have remained a Sobeys trademark. Canada's centennial celebration is launched with a ceremony in Ottawa, during which PM Pearson lights the Centennial Flame at the entrance to Parliament Hill. 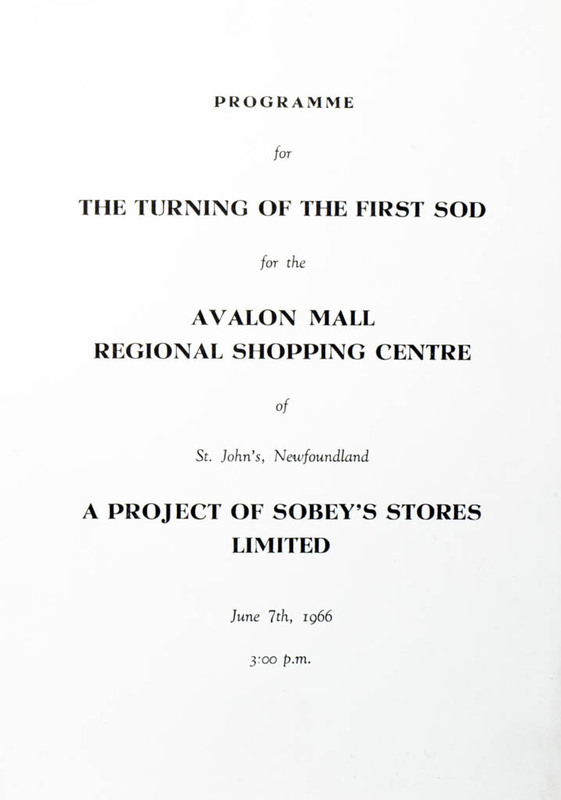 Sobeys institutes employee health and disability plans, and develops the Avalon Mall in St. John’s. 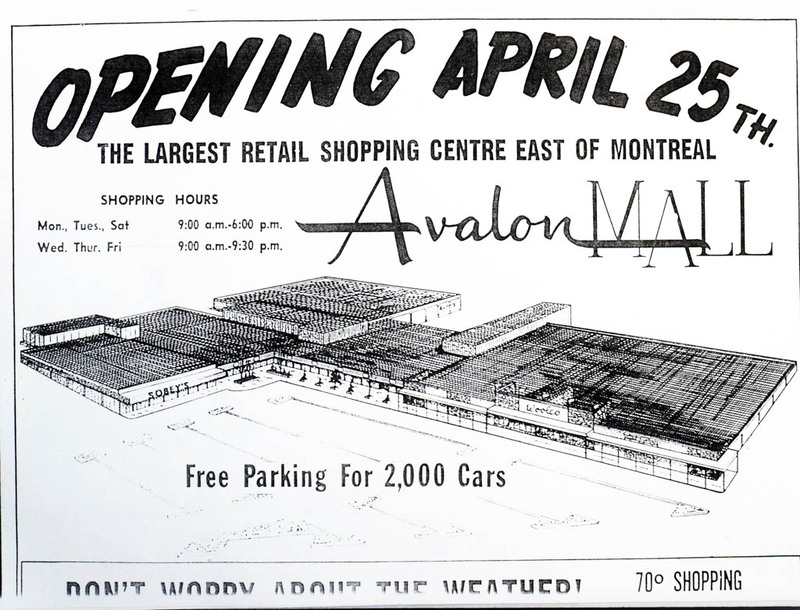 It is the largest shopping centre east of Montreal with 40 retail outlets. 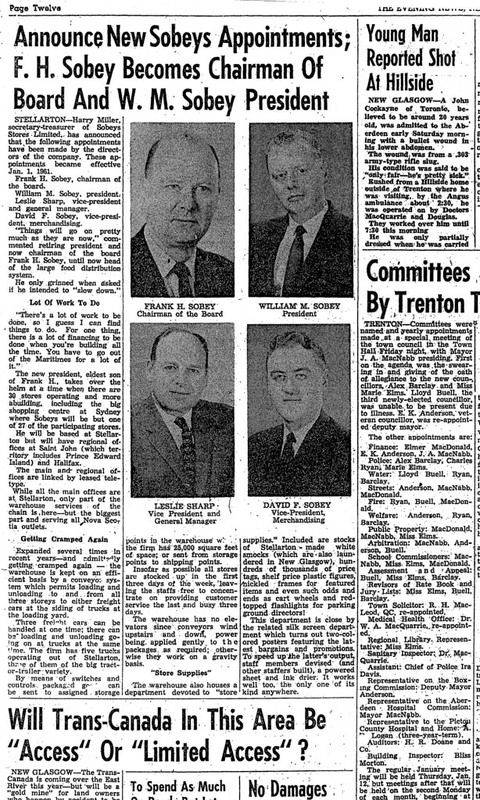 The first Canada Games are hosted by Québec City; De Gaulle is boosting Quebec separatists; and Bob Stanfield becomes national Progressive Conservative leader. Data processing is installed for payroll and some general accounting at Sobeys head office. The move is “cautiously approached and will be enlarged to handle additional expected volume if it proves its efficiencies and its economics.” It does. 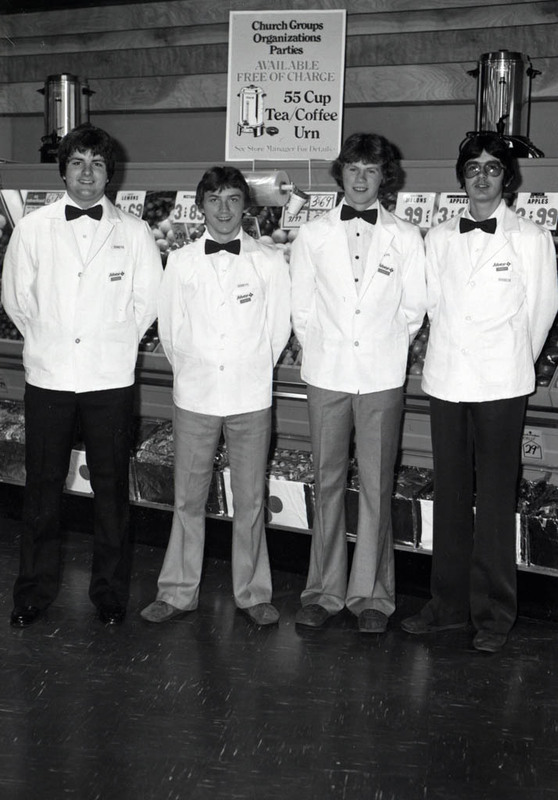 Sobeys holds first Management Conference in Halifax. 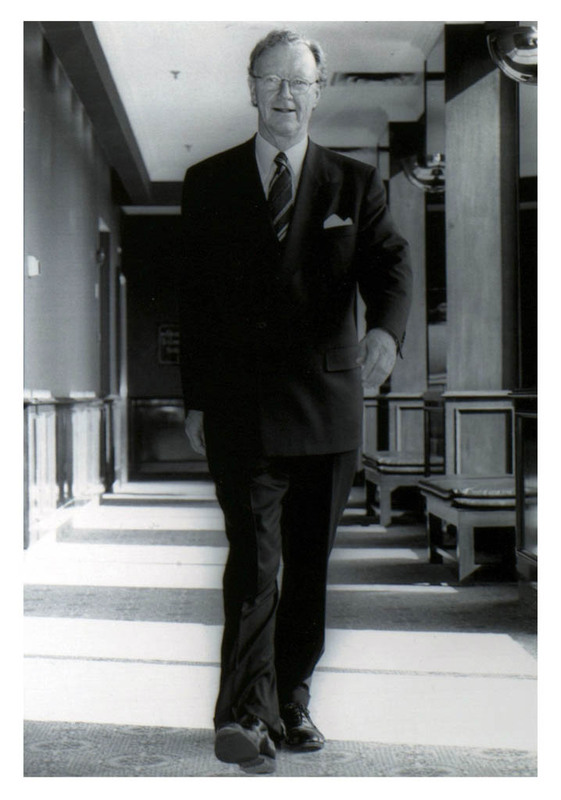 Pierre Trudeau is leader of the Liberal Party of Canada and Canada's 15th prime minister. The Oshawa Group’s growth continues. 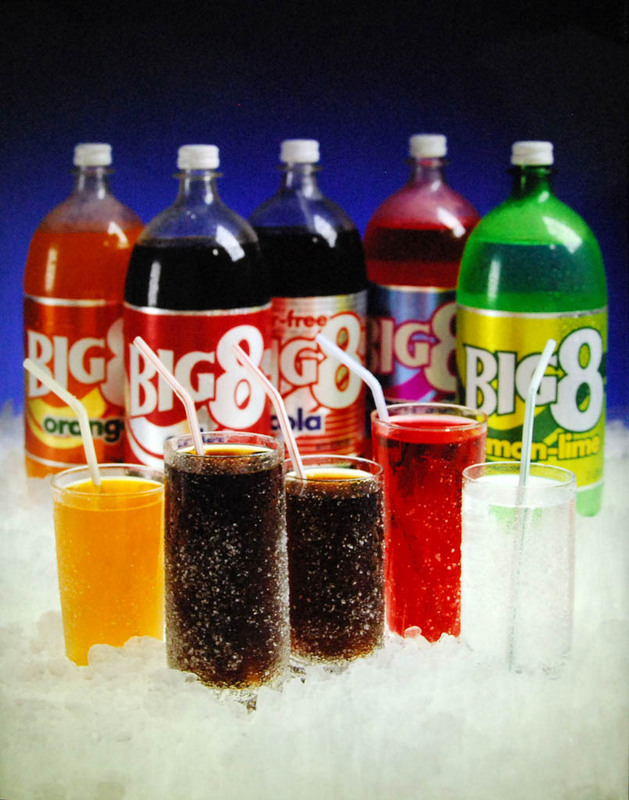 It acquires wholesalers, retailers, including IGA, and food service companies across Canada. 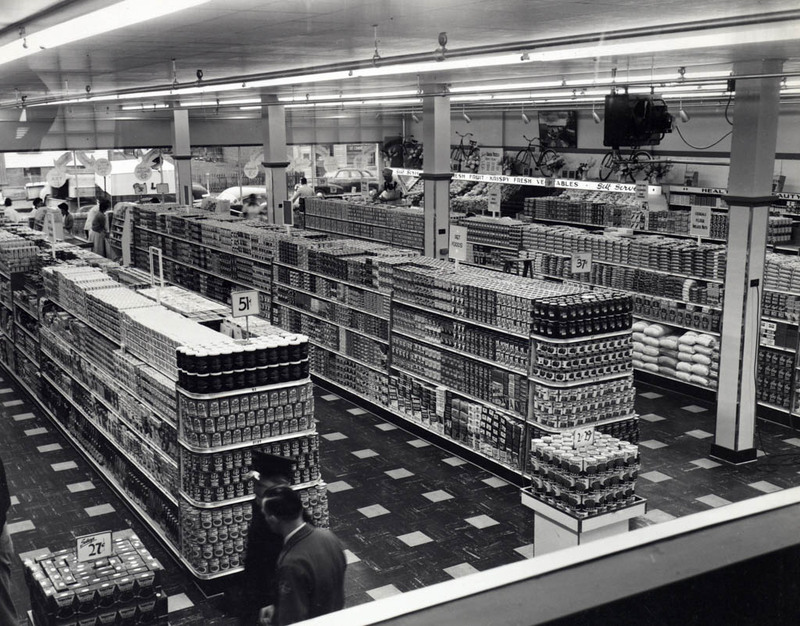 The next year, Oshawa acquires Quebec IGA food giant Hudon & Orsali and retains the 93-year-old Hudon/Orsali brand in Quebec. The Montreal Expos play their first home game at Jarry Park against the St. Louis Cardinals. 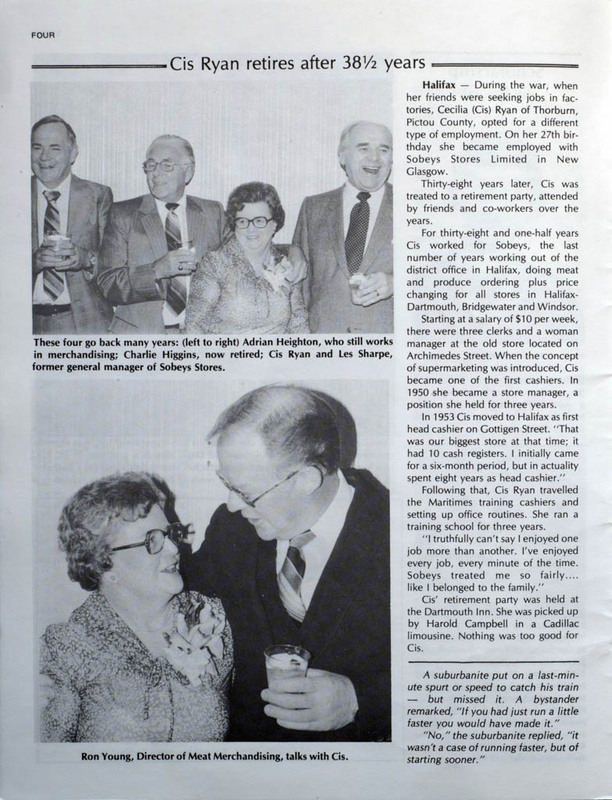 Employees with 25 years or more service join the Quarter Century Club, which lives on today. 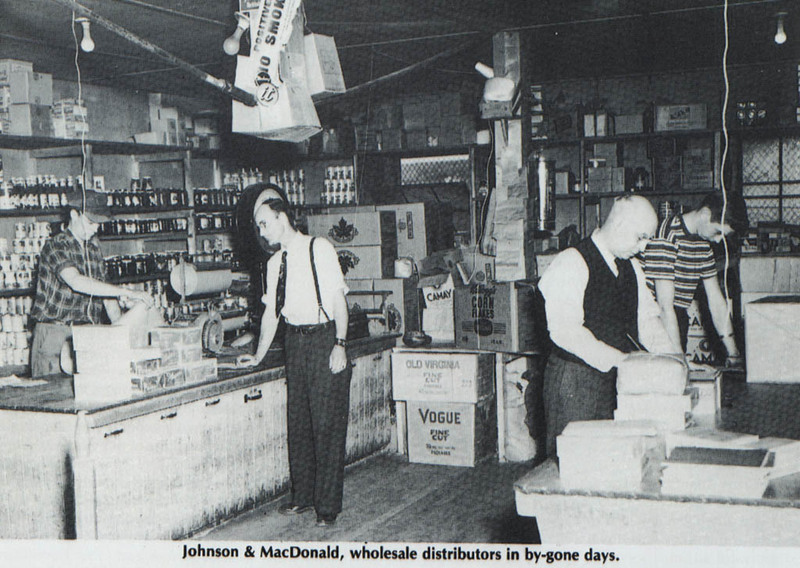 The company purchases the majority share of Lumsden Brothers, a 100-year-old Ontario wholesaler. Canada withdraws from the world hockey championships to protest rules barring the best Canadian players, like the Bruins’ Bobby Orr, the first defenceman to win the NHL scoring title. 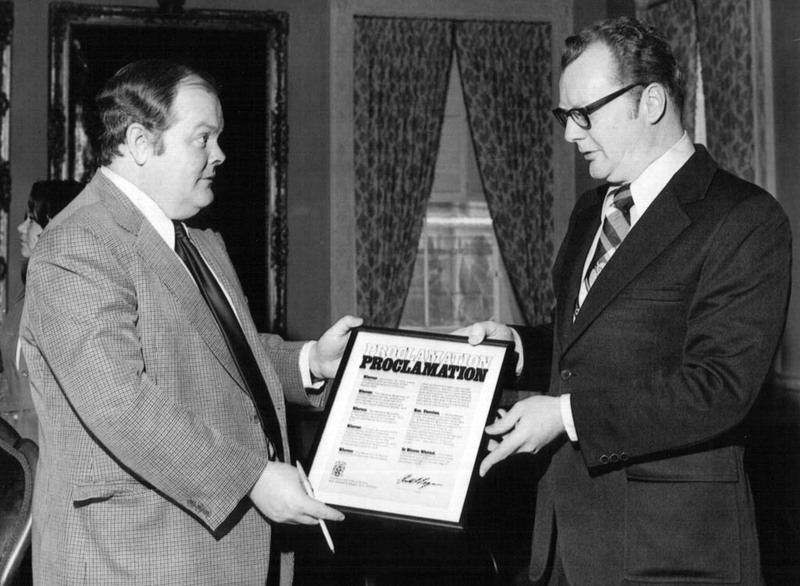 War Measures Act is invoked during October Crisis and FLQ terrorism in Quebec. 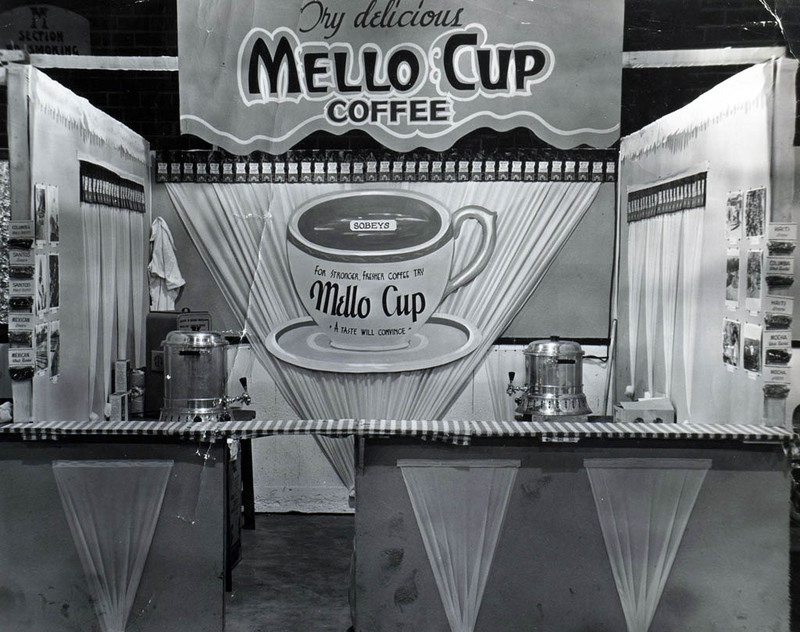 Early ads were designed and produced in the Sign Shop located in the basement of the King Street office/warehouse. 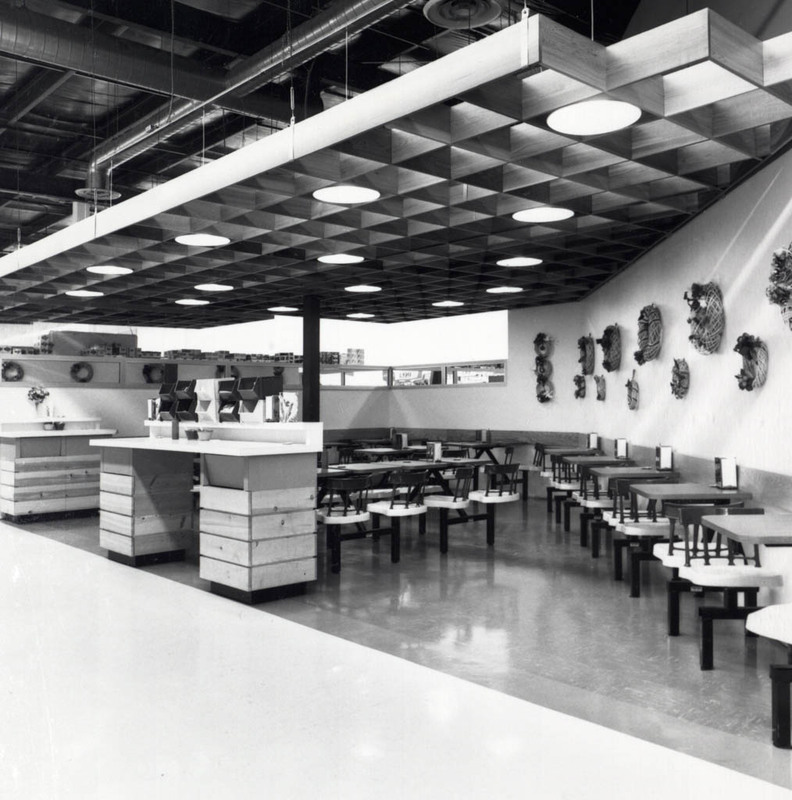 The company was blessed with talented artists who painted and printed the weekly posters for the stores. 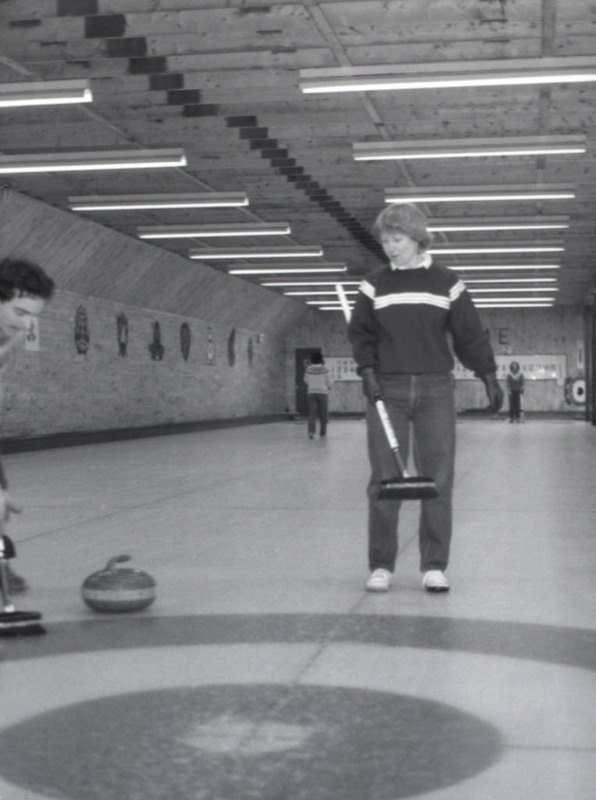 Forty-three years after its official opening, Pier 21 in Halifax closes. A gateway to Canada, one in five Canadians has a connection to Pier 21. Roughly one million immigrants passed through its doors between 1928 and 1971. 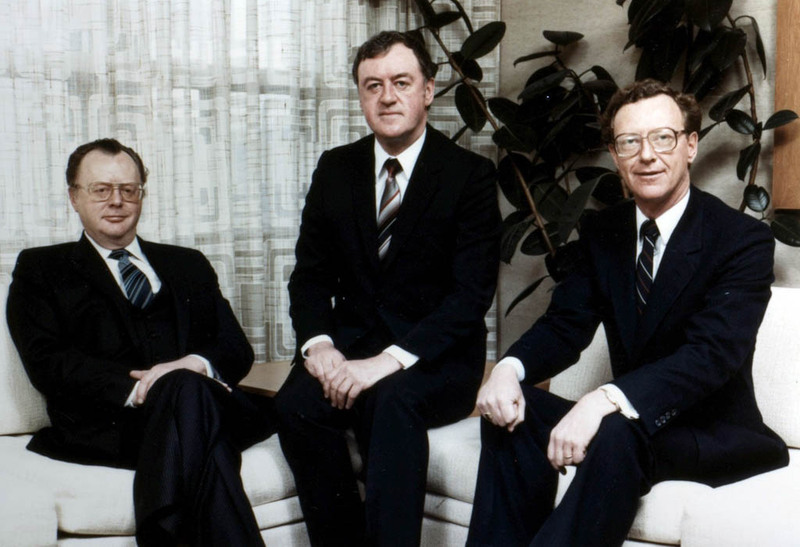 Frank’s sons, Bill, David, and Donald, assume more leadership. 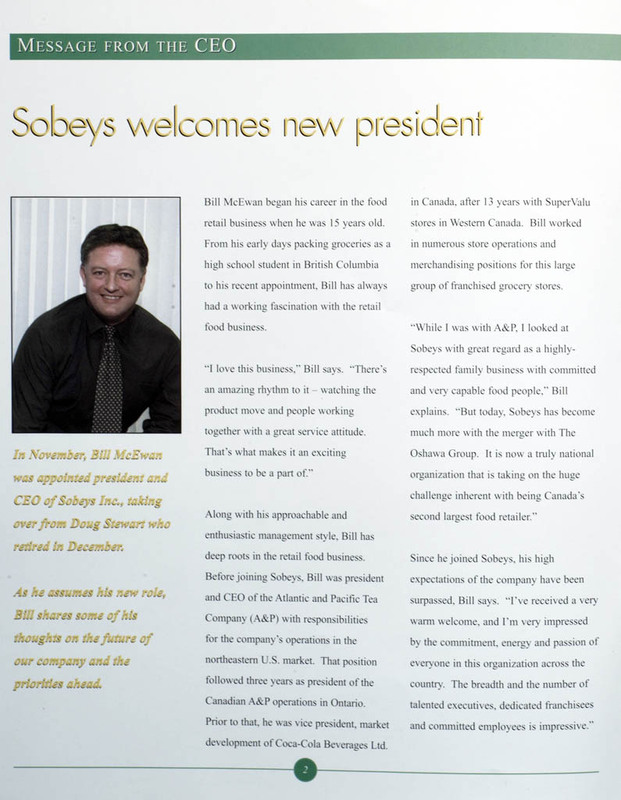 Bill is President, and David, Executive Vice-President of Sobeys, while Donald heads Empire Company Limited. Paul Henderson scores the dramatic winning goal with 34 seconds left as Canada defeats the Soviet Union 6–5 to win the Summit Series. 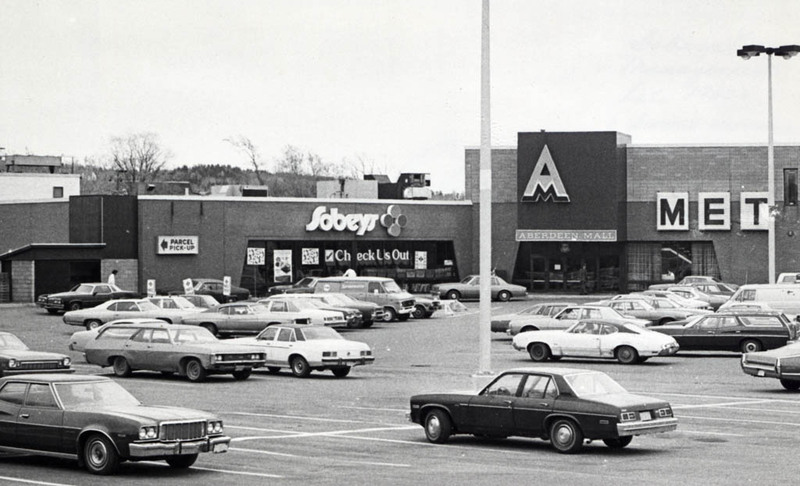 Sobeys opens the Aberdeen Mall shopping centre in New Glasgow, as large real estate and shopping centre developments become an important part of the company’s operations. Vancouver-born Karen Magnussen wins the World Women's Figure Skating Championships in Bratislava in what was then Czechoslovakia. 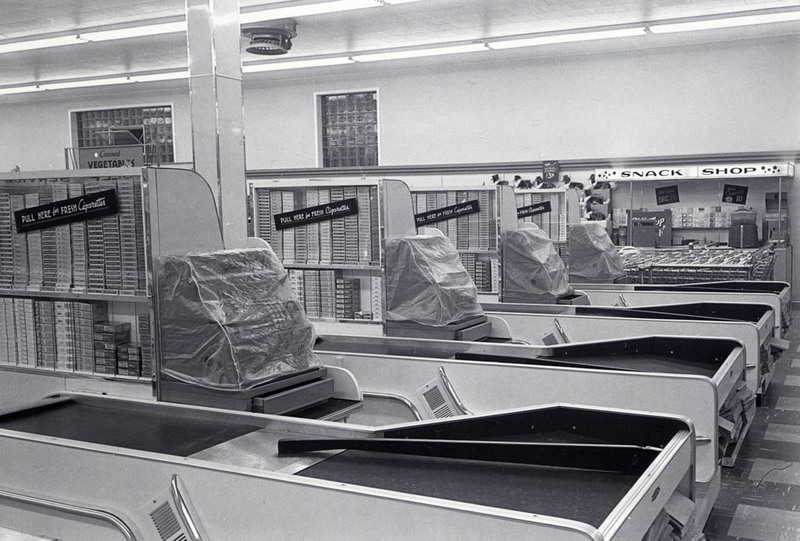 A new computerized distribution centre opens in Stellarton, replacing the original Sobeys warehouse. Sobeys signs an affirmative action agreement with the Nova Scotia Human Rights Commission committing to actively recruit minority group employees. Trudeau’s Liberals win a majority in the federal election. Four women recruits, the first ever, join the RCMP. 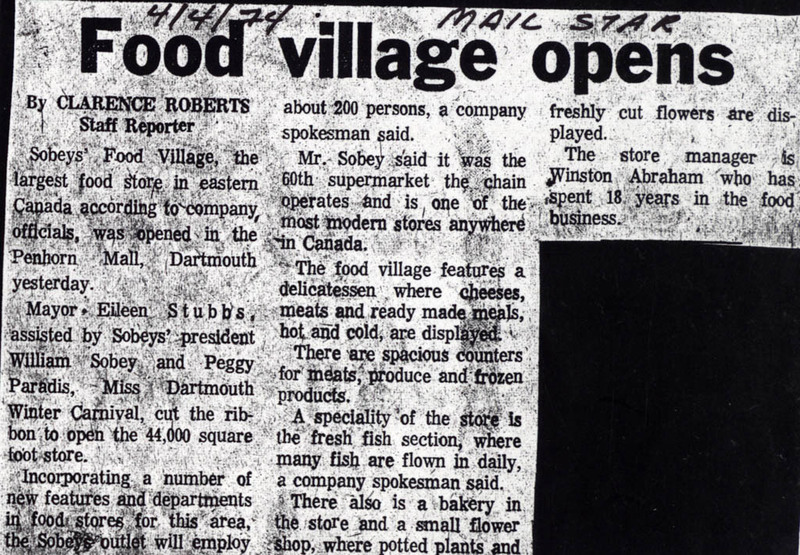 Sobeys opens its first Food Village, a 44,000-square-foot store in Dartmouth’s Penhorn Mall. 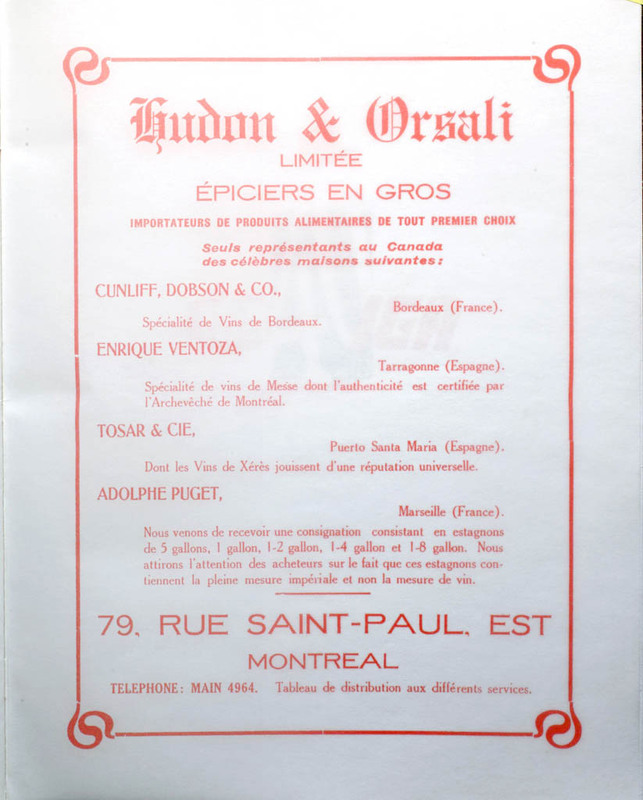 In Quebec, Hudon & Orsali acquires wholesaler, E. Deaudelin, and the next year changes its name to Hudon et Deaudelin. The Alberta, Ontario and federal governments agree to invest $600 million in the Syncrude Canada project to develop the oil sands near Fort McMurray. Canadian Oscar Peterson wins at the Grammy Awards. 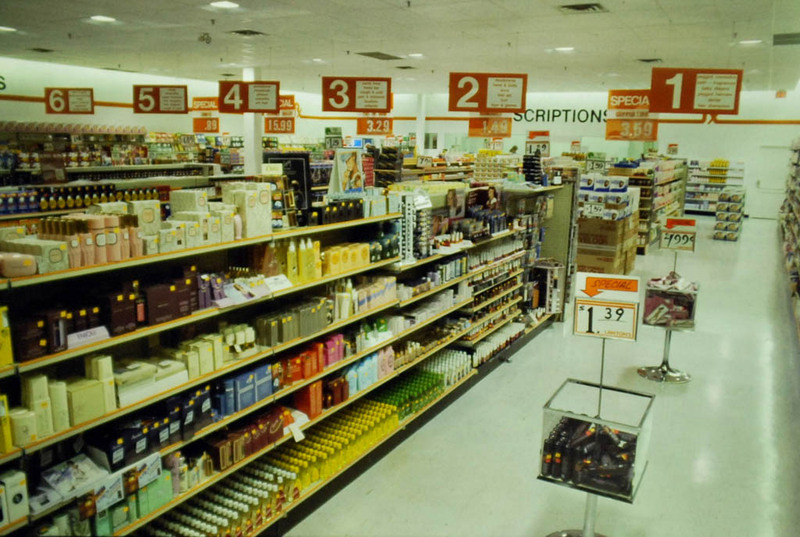 Empire Company Limited, Sobeys’ holding company, purchases five Lawtons pharmacies, with 80 employees. 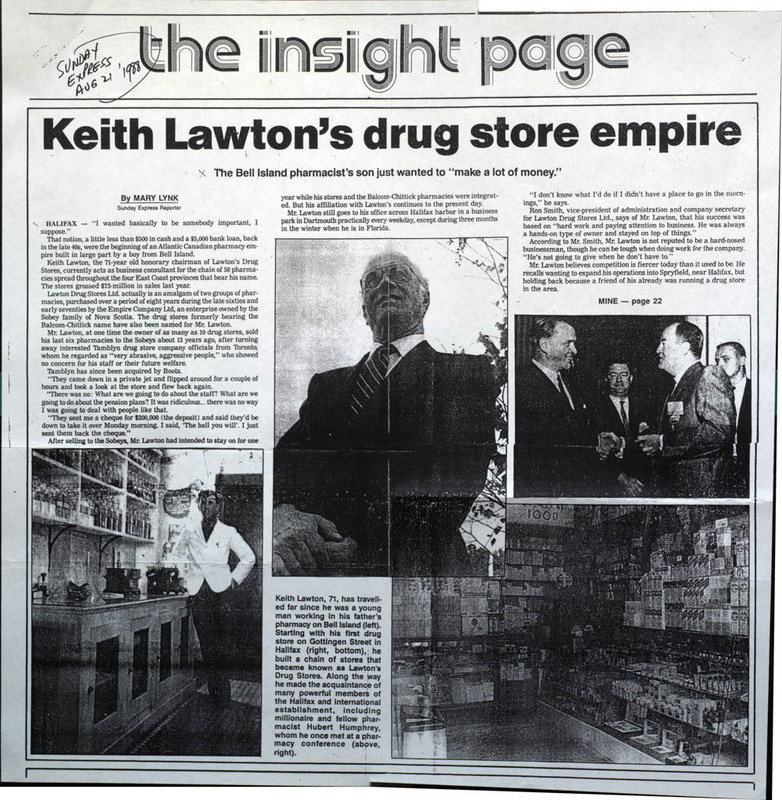 Keith Lawton kept his flagship store, Scotia Pharmacy, for a time. 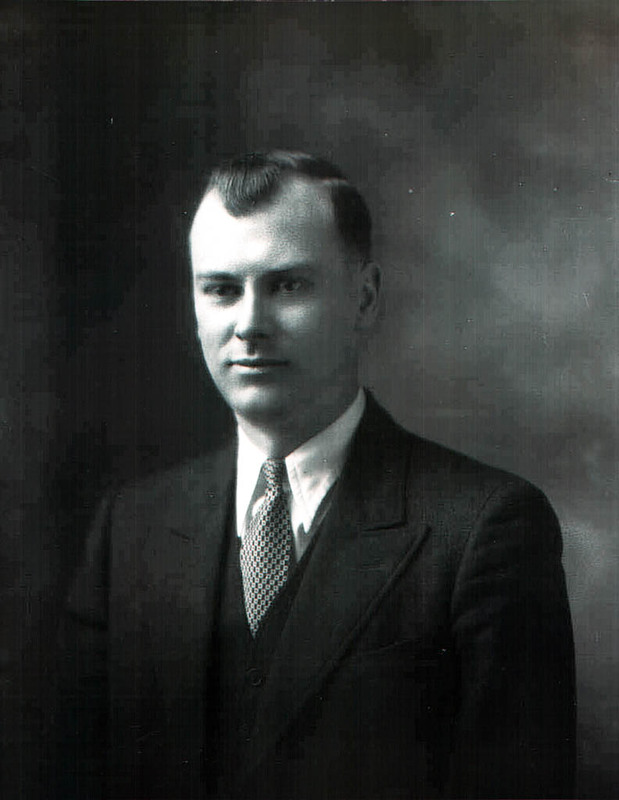 He later became chairman of Balcom-Chittick’s, then the Lawtons board. The Olympic Games officially open in Montréal. The star is Romanian gymnast Nadia Comaneci. The Parti Quebecois, dedicated to separation, wins the provincial election in Quebec, with Rene Levesque as premier. 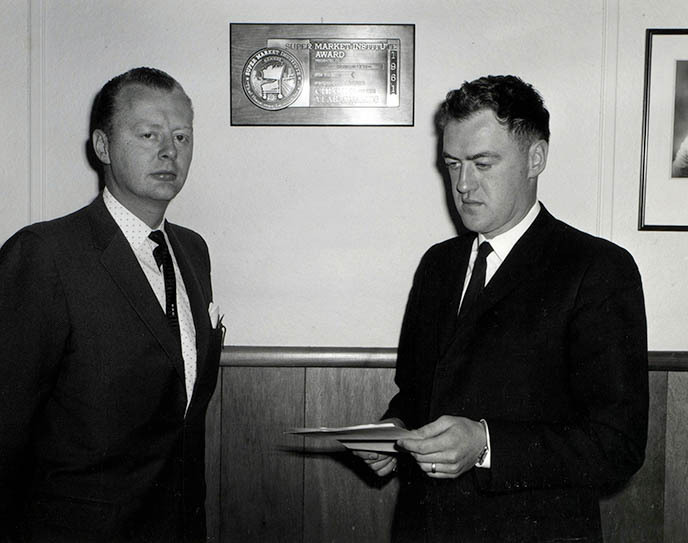 Frank Sobey is Honorary Chairman of the company. His son William is now Chairman & Chief Executive Officer while David assumes the role of President. 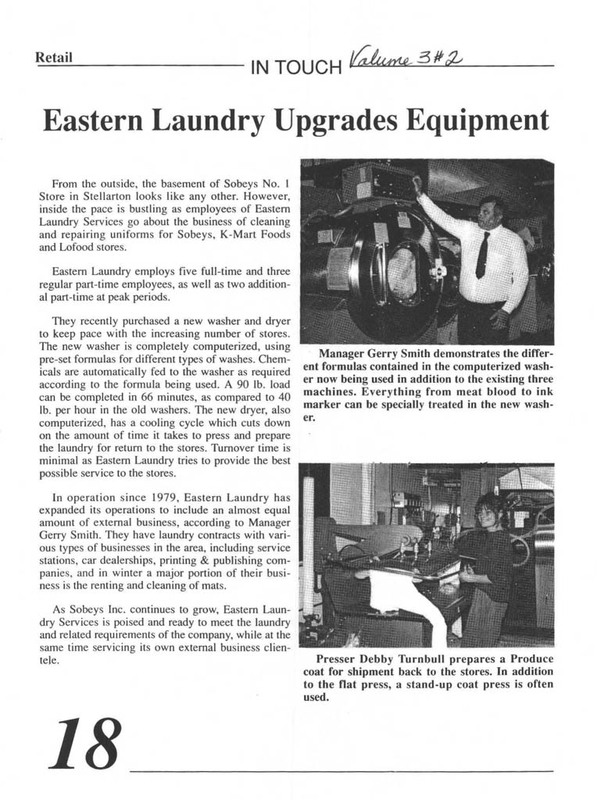 Donald leads Empire Company Ltd. The Toronto Blue Jays defeat the Chicago White Sox 9-5 in Toronto in the franchise's first game. 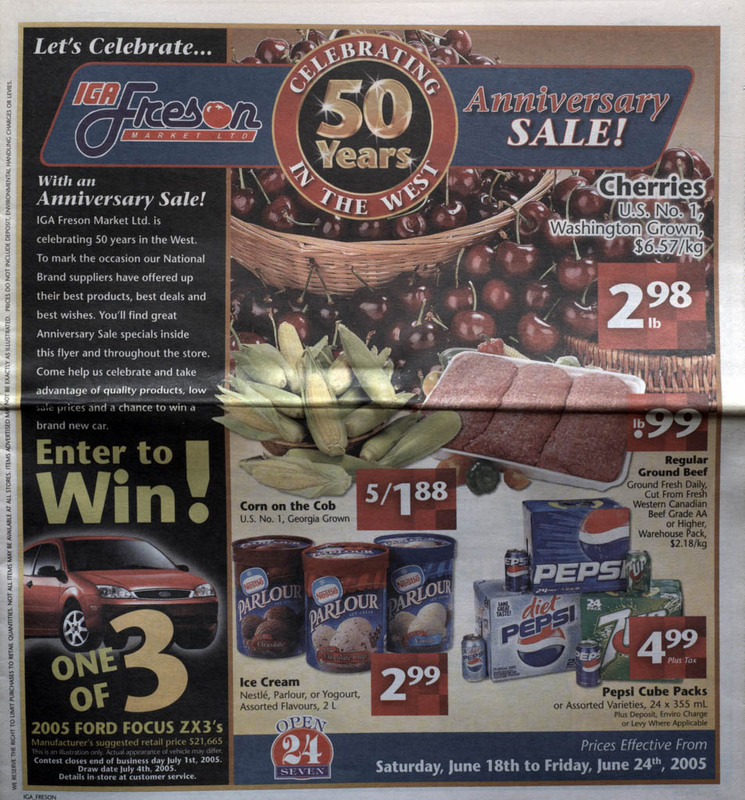 In Quebec, Hudon et Deaudelin – now the Oshawa group’s arm in that province – takes command of the market by merging the IGA and Boniprix banners. 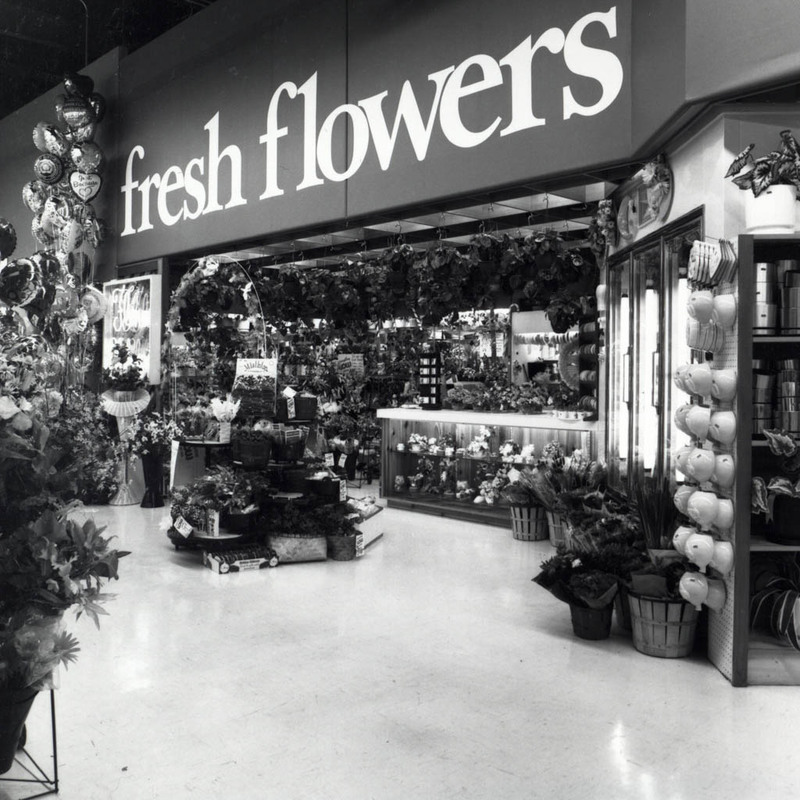 In B.C., Alex Campbell opens his first Thrifty Foods Store in Vancouver. Canada enacts a new Immigration Act that affirms Canada's commitment to the resettlement of refugees. Admission of refugees becomes part of Canadian immigration law and regulations. Through Sobeys subsidiary, Joy Stores, the company opens its first two Pizza Hut restaurants in Nova Scotia. 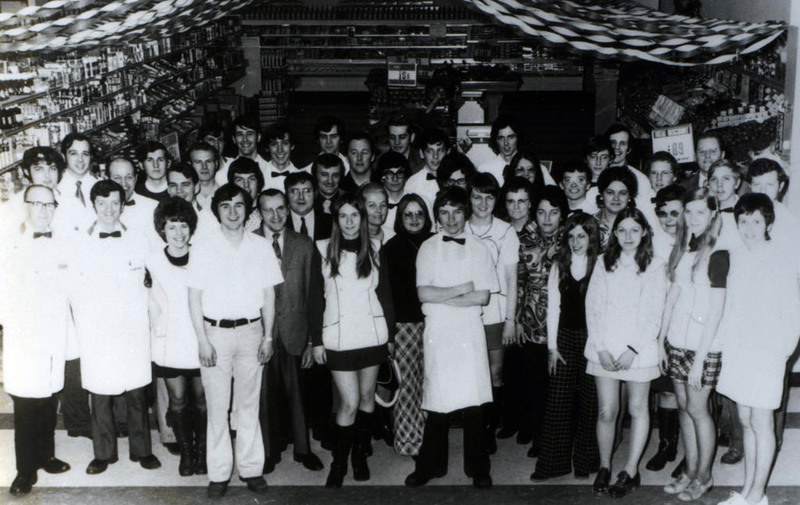 The fourth generation, Frank Cameron Sobey, son of William and Doris and grandson of Frank H., joins the company as a Pizza Hut manager trainee. 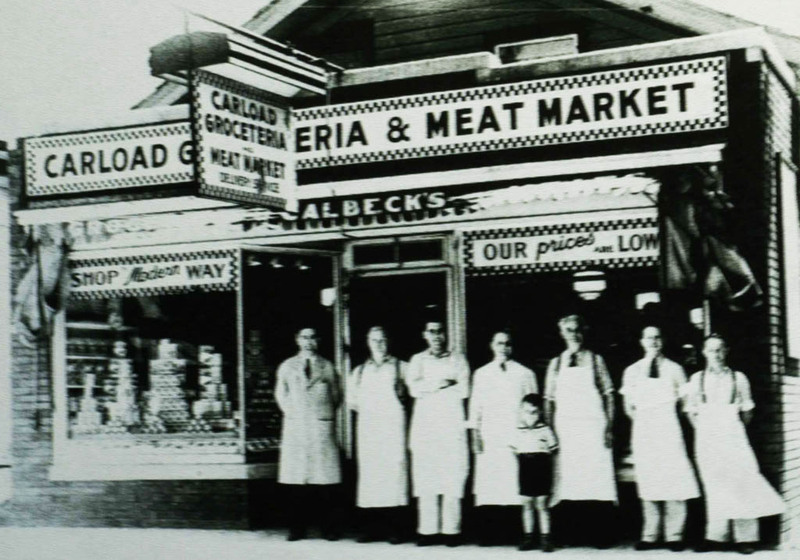 The tradition of family learning the business from the ground up holds fast. Joe’s minority a Trivial Pursuit? 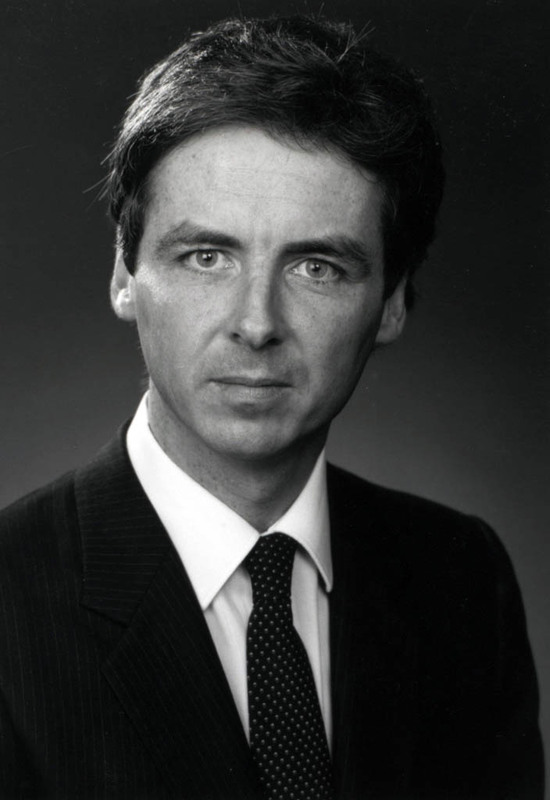 Joe Clark is prime minister, but his Conservatives fall just short of a majority government. In Montreal, journalists Chris Haney and Scott Abbott invent a new board game. Trivial Pursuit went to market in 1982. Sobeys brings grocery scanning into its Penhorn, Dartmouth store, the first such installation in the Atlantic provinces. 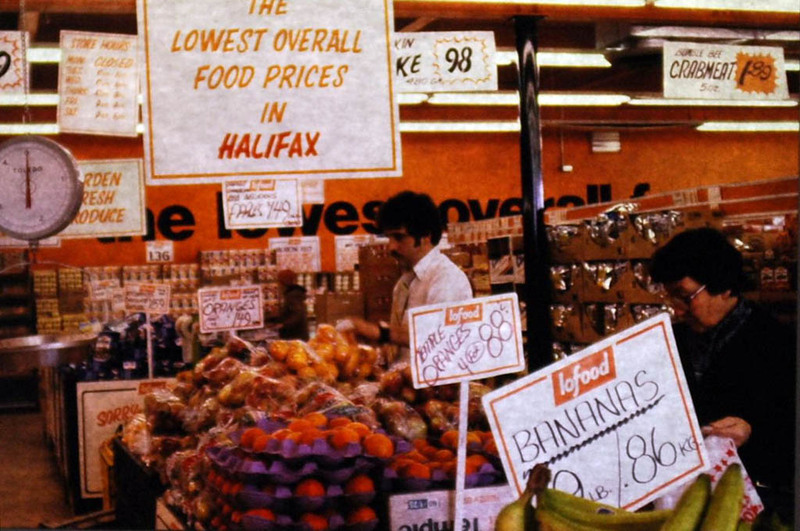 The company also moves into discount and opens its first no-frills, “box store” Lofood, in Halifax. 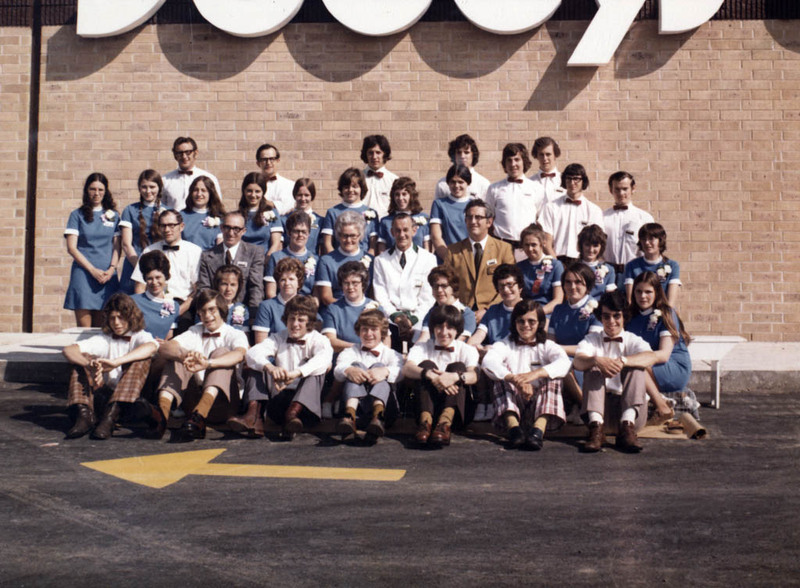 In the West, Codville (acquired by the Oshawa group in 1971) employs more than 600 Canadians in its wholesale and retail operations. 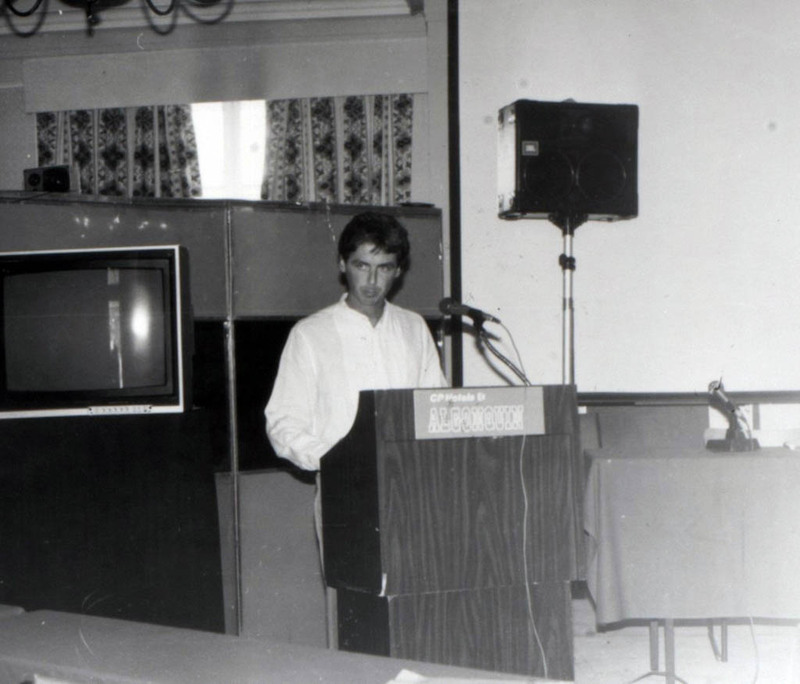 Terry Fox begins his Marathon of Hope in St. John's, NL, on April 12. The run ends Sept. 1 in Thunder Bay when cancer is discovered in his lungs. Within days, more than $10 million is raised. Pierre Trudeau returns as Prime Minister after a nine-month hiatus during Clark’s minority. Gordie Howe retires, and Quebecers vote 60 per cent against sovereignty association. 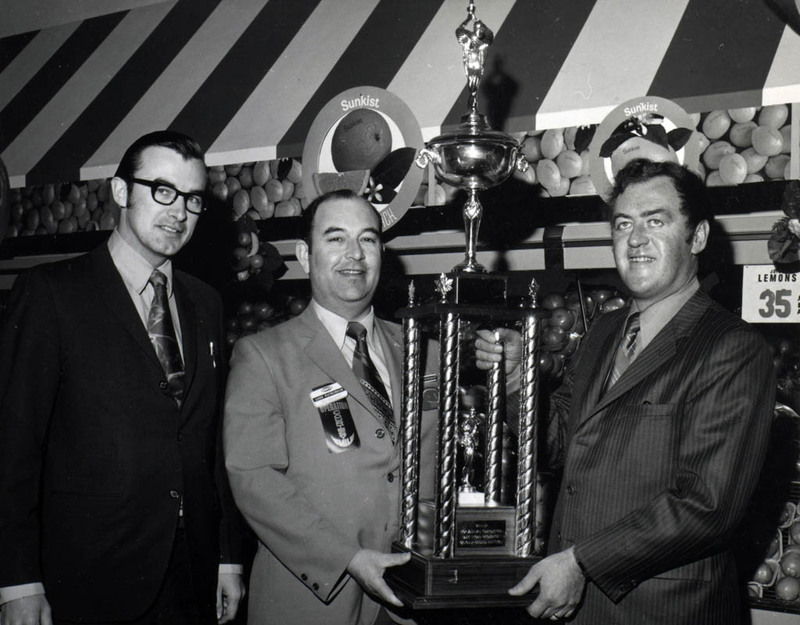 Provincial and overall Manager-of-the-Year awards are presented at annual managers’ conferences. 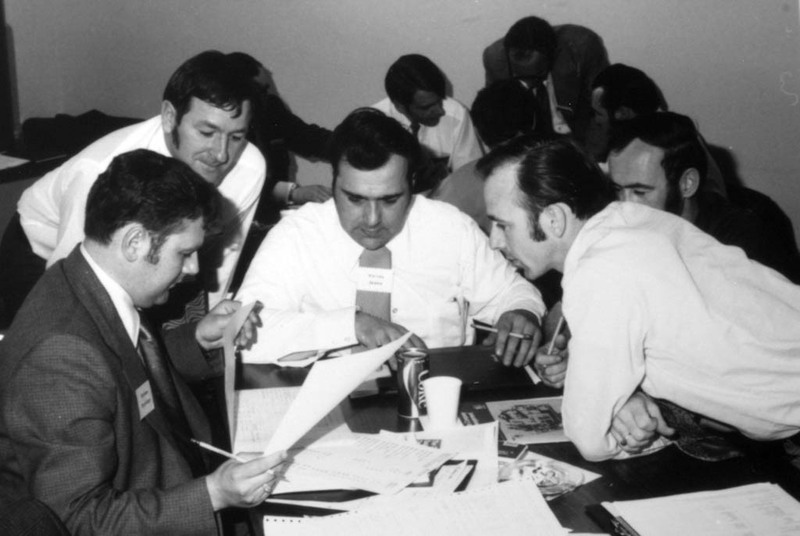 The conferences, which began in 1967, were occasions for training and development; educating employees was always a company priority. On Feb. 13, Captains Leah Mosher, Nora Bottomley and Dee Brasseur graduate as the first Canadian female pilots to change the face of the Canadian Air Force. The first Terry Fox Run is held in more than 800 Canadian communities. Today, millions of people in dozens of countries take part in the run and raise money for cancer research in honour of the young Canadian who started it all. 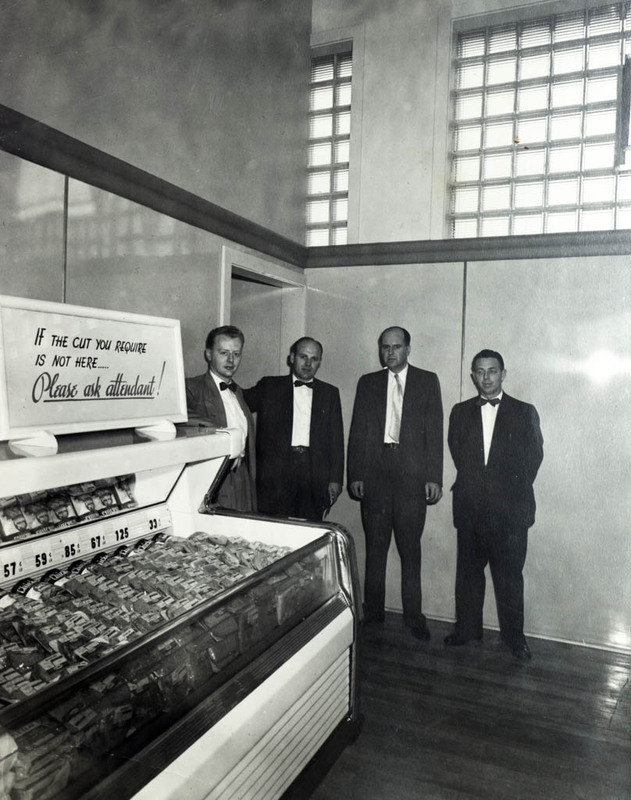 Bill Sobey’s sons: Young Frank moves from Pizza Hut to join the real estate division. 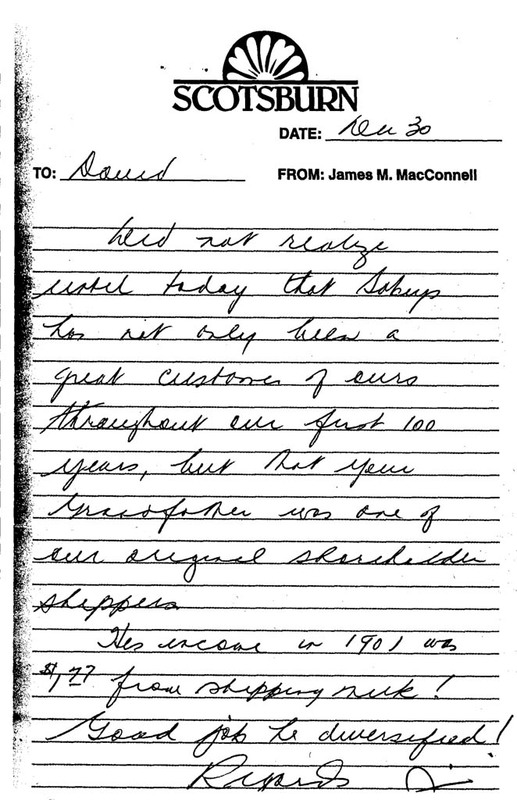 Today (2017) he is Chairman of Crombie REIT and Vice-President of Real Estate, Empire Company Ltd. Karl becomes manager of the Sobeys in the Halifax Shopping Centre. 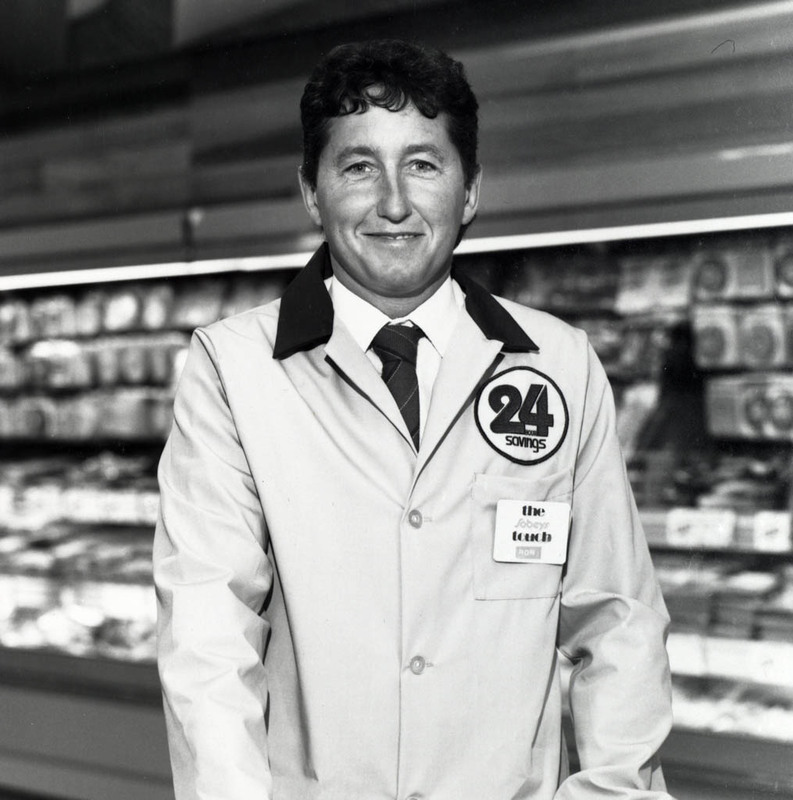 Karl started in the meat department in Sydney in 1973 and in 2001, he retired as President of Retail Operations in Ontario, Quebec, Atlantic, and Lawtons Drugs. Canada has a constitution and Charter of Rights and Freedoms. All Canadians’ fundamental rights, democratic rights, legal rights, equality rights and linguistic rights are guaranteed. The world's largest semi-submersible drill rig, the Ocean Ranger, capsizes and sinks in a storm off Newfoundland with the loss of all 84 crew members. 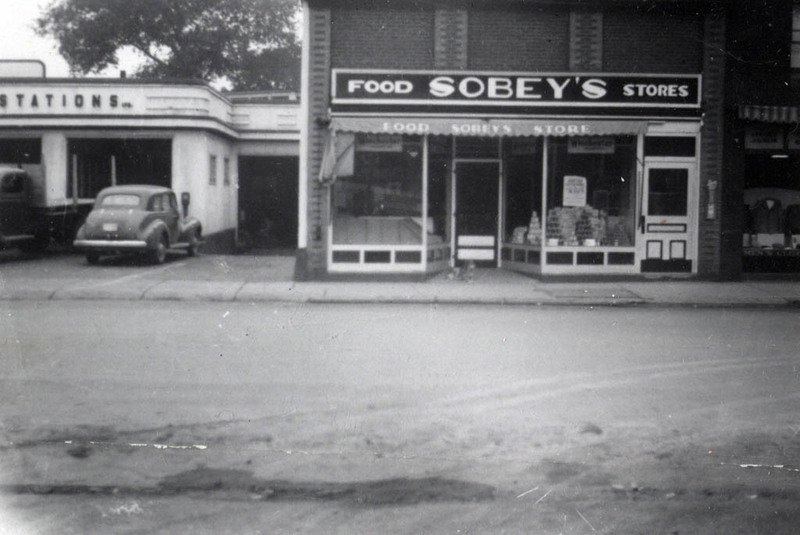 Sobeys celebrates “75 Friendly Years,” with 77 supermarkets and 13 Lofood stores. 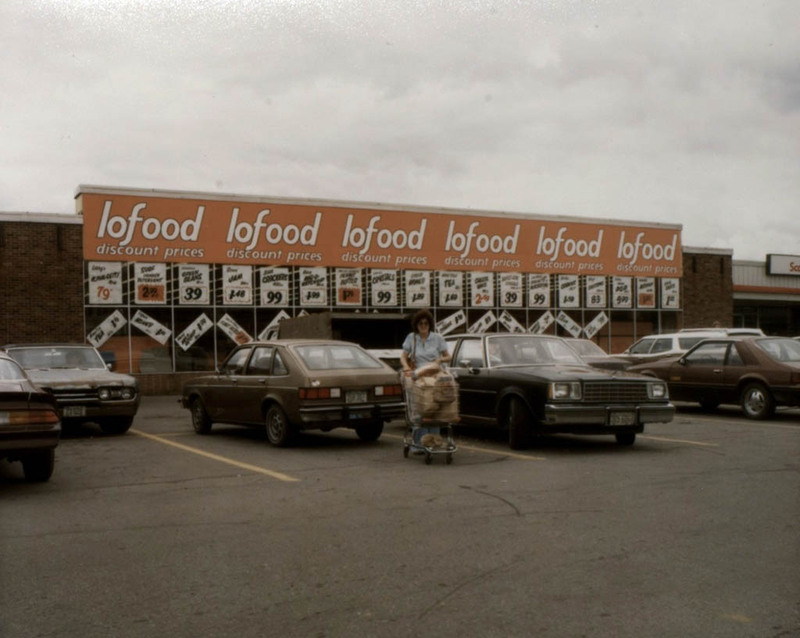 A new Lofood in Burlington is opened by Lumsden’s, making it the company’s first retail store in Ontario. David Sobey is now Deputy Chairman and CEO; Skiffington Murchie is President. 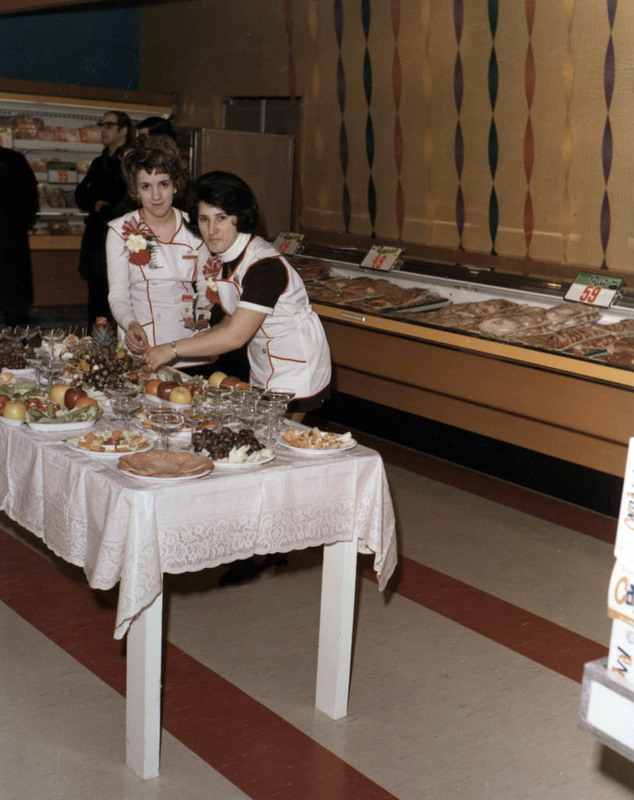 Sobeys initiates the Employee-of-the-Month program in all stores to recognize superior performance in customer service. 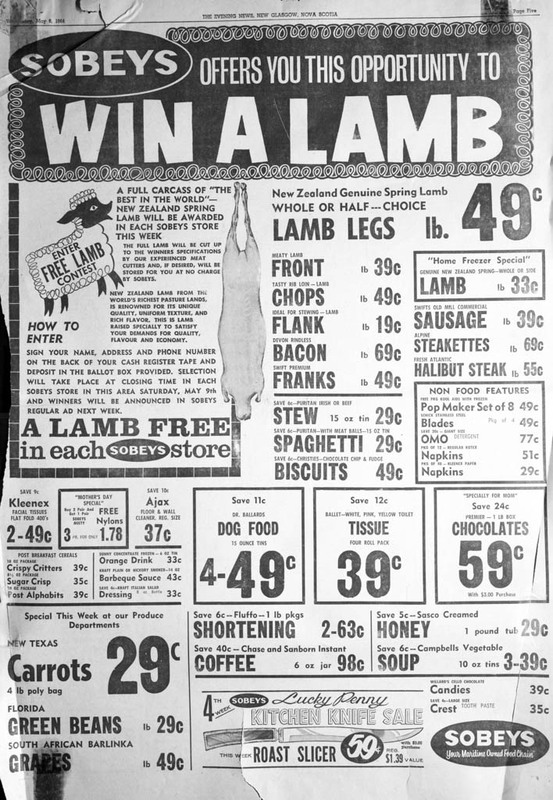 With Sobey’s support and Frank H. Sobey’s determination to buy local fresh lamb, NorthumberLamb co-operative formed. The Right Honourable Jeanne Sauve’s name is put forward to become Governor General. 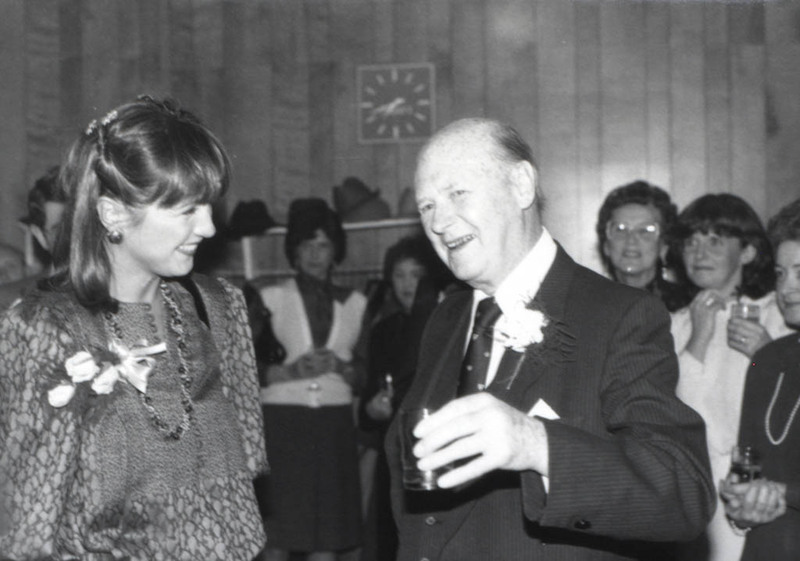 In 1984, she becomes the first female appointed to the position. 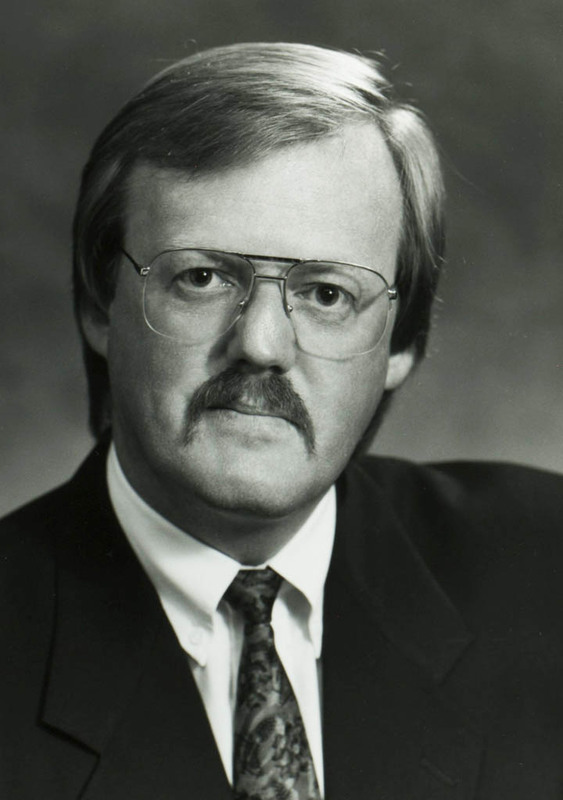 The metric system of measures replaces the Imperial system, and Brian Mulroney replaces Joe Clark as P.C. leader. 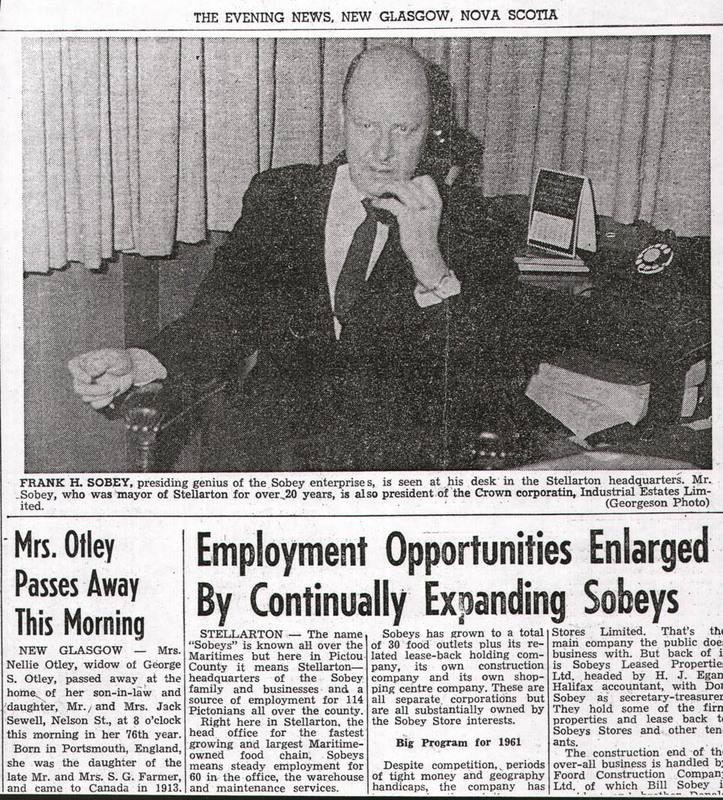 Frank H. Sobey’s wife, Irene, dies. Sobeys stores introduce the warehouse concept and bulk foods. 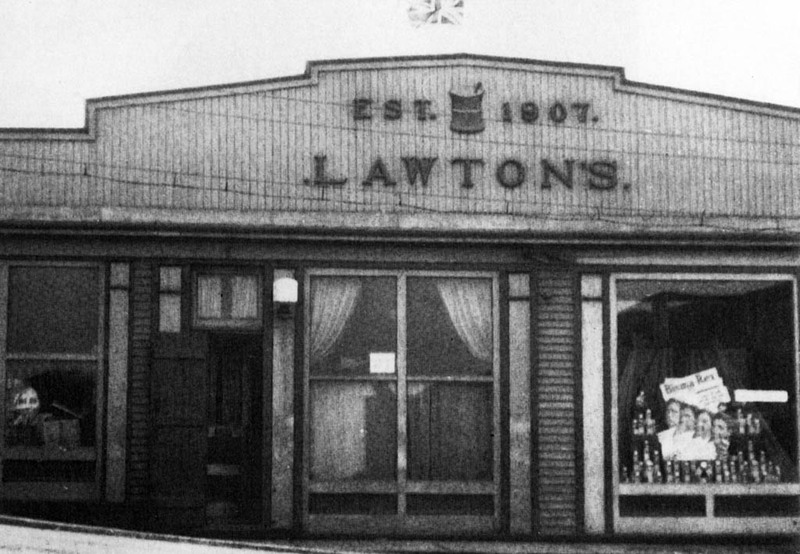 The Lawtons banner now flies over Sobeys-owned drug stores. Brian Mulroney’s Conservatives win a massive majority. Daurene Lewis, a descendant of Black Loyalists, is elected mayor of the Nova Scotia town of Annapolis Royal, the first black female mayor in Canada. 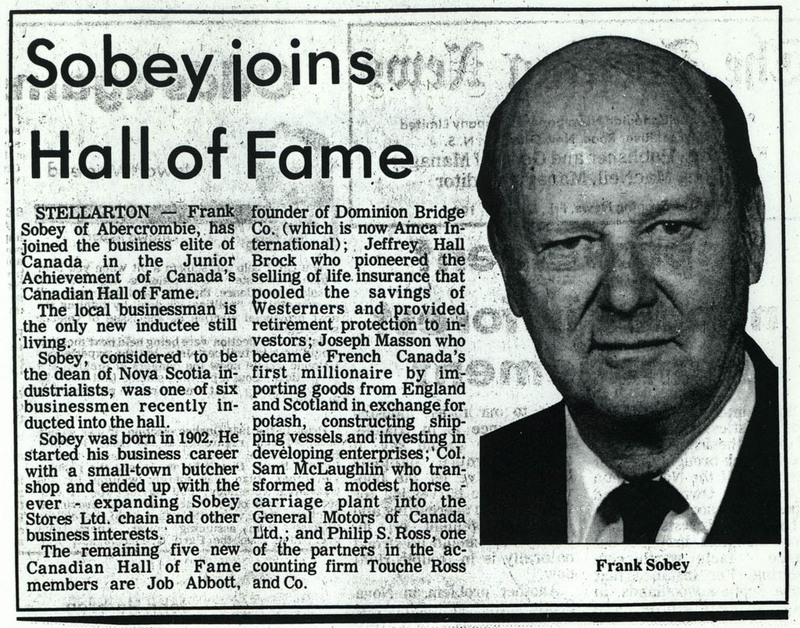 “Starting this (pension) fund was perhaps the best thing I ever did and the thing of which I am most proud.” – said Frank H. Sobey, who was inducted to the Canadian Business Hall of Fame. 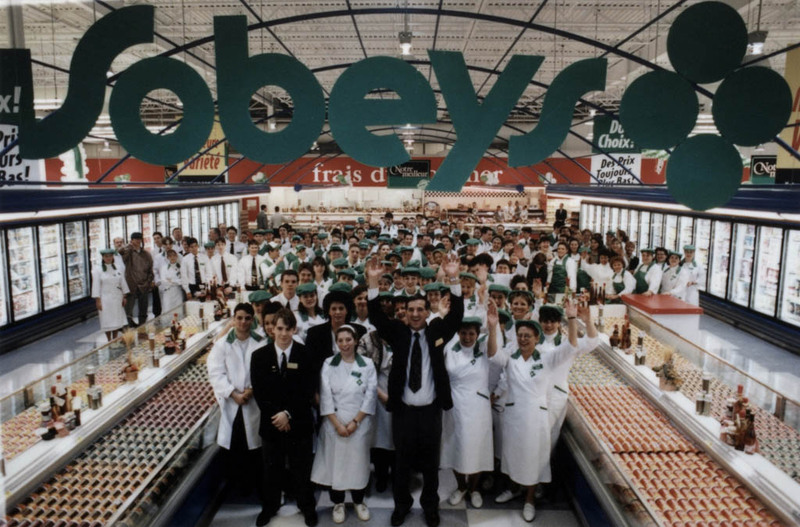 Sobeys and its subsidiaries now employ 4,545 Canadians. Margaret Atwood’s The Handmaid's Tale is published. The novel wins the Governor General's Award, the Los Angeles Times Prize, the Arthur C. Clarke Award and the Commonwealth Literary Prize. Wheelchair athlete Rick Hansen leaves Vancouver on his around-the-world Man In Motion tour to raise money for spinal-cord research. He would travel 40,000 kilometres through 34 countries. 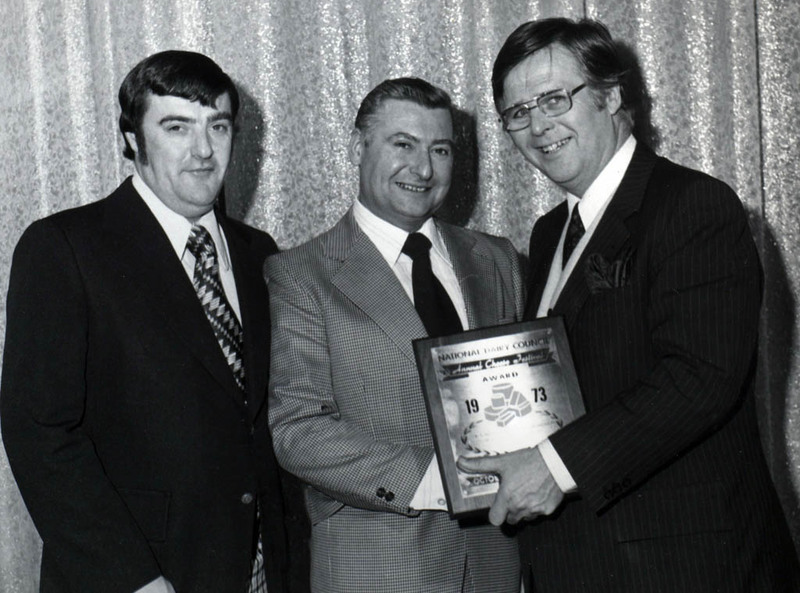 Sobeys builder, and community, provincial, national leader, Frank H. Sobey dies. 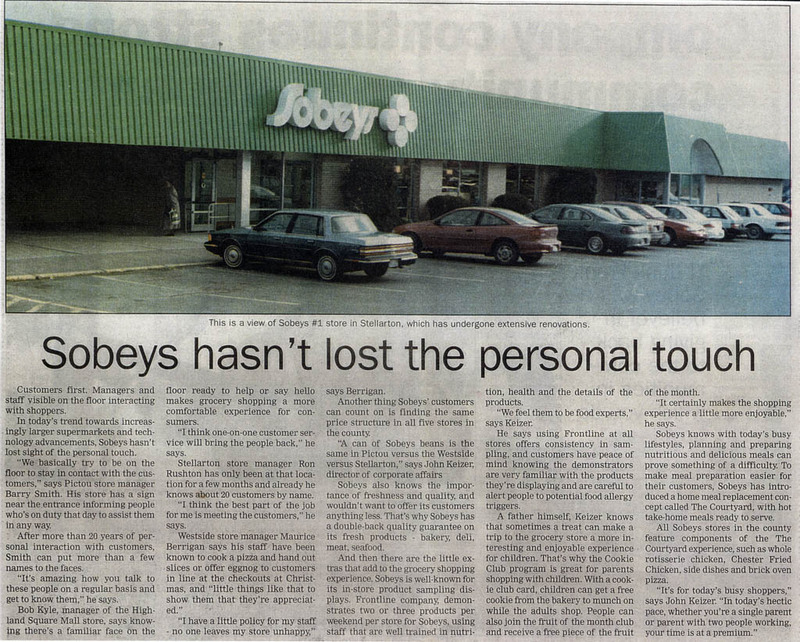 The Sobeys Touch Award is initiated to recognize “warm, friendly service” and 250 employees are chosen for their outstanding customer service. 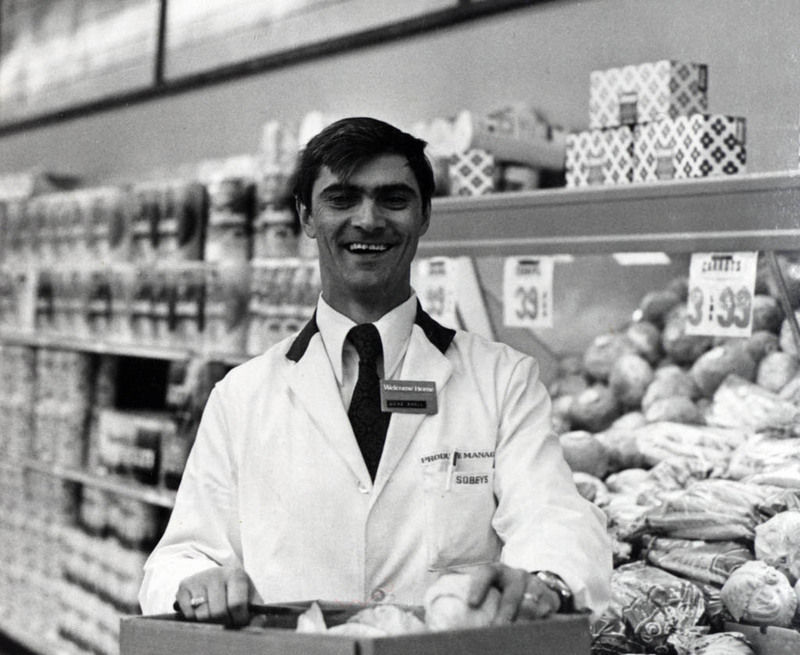 Today Sobeys honours exemplary employees with the Value Champion award. Expo 86 at Vancouver, B.C., opens on May 2 by the Prince and Princess of Wales. It attracts 20 million visitors during its six-month run. 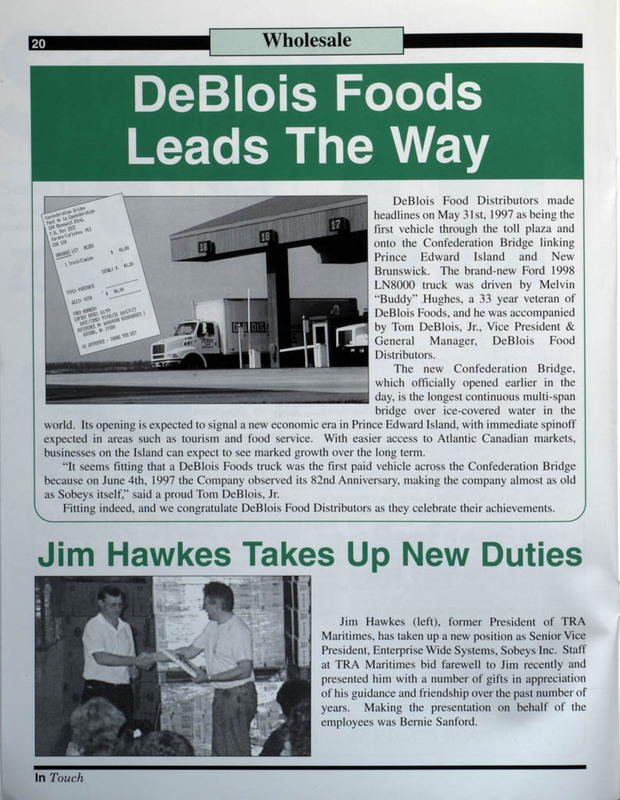 DeBlois Food Distributors, a Prince Edward Island tradition for more than 70 years, becomes part of the Sobeys-TRA family. The Olympic flame begins an 88-day, 18,000-kilometre journey from Signal Hill in St. John’s, NL., to the Calgary Winter Games. Former Olympians Barbara Ann Scott and Fred Hayward begin the relay. More than 7,000 Canadians take turns carrying the torch. 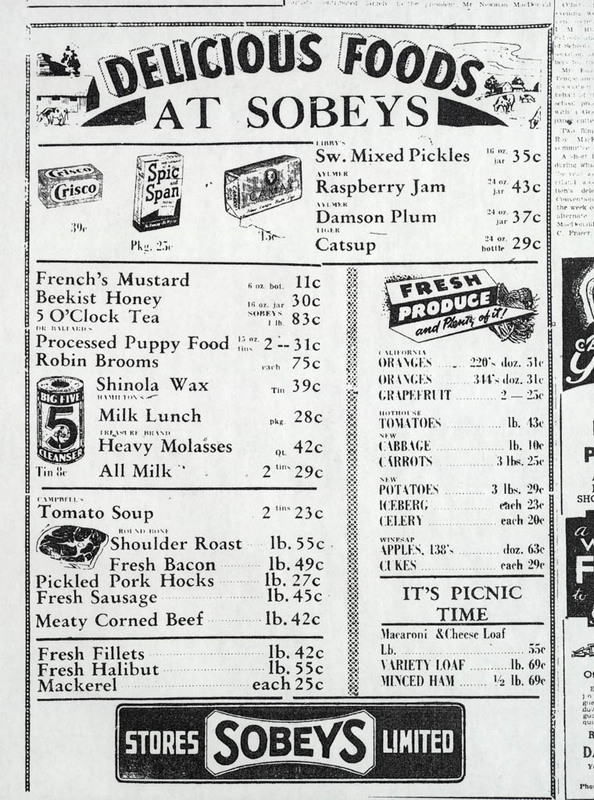 Sobeys is now 6,970 employees strong, working in the retail, wholesale, food service and industry groups. 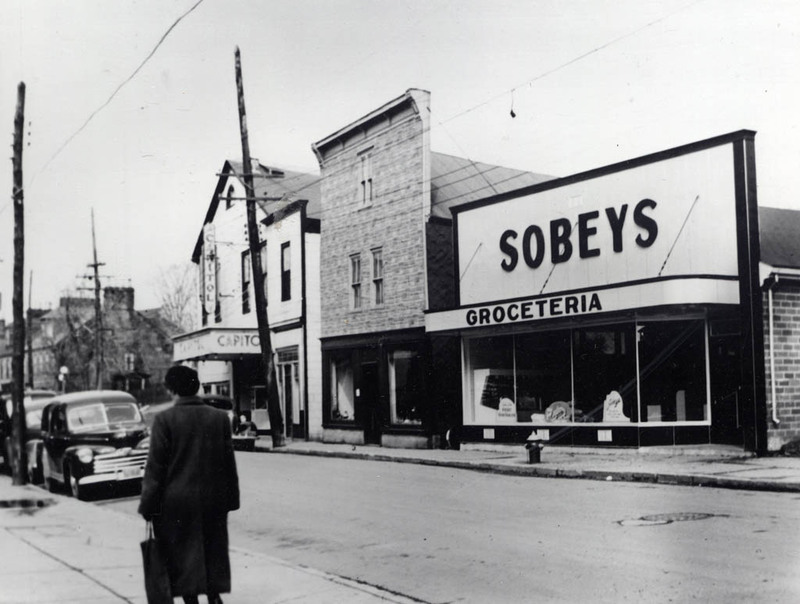 The company’s first Sobeys store in Ontario opens in Guelph. 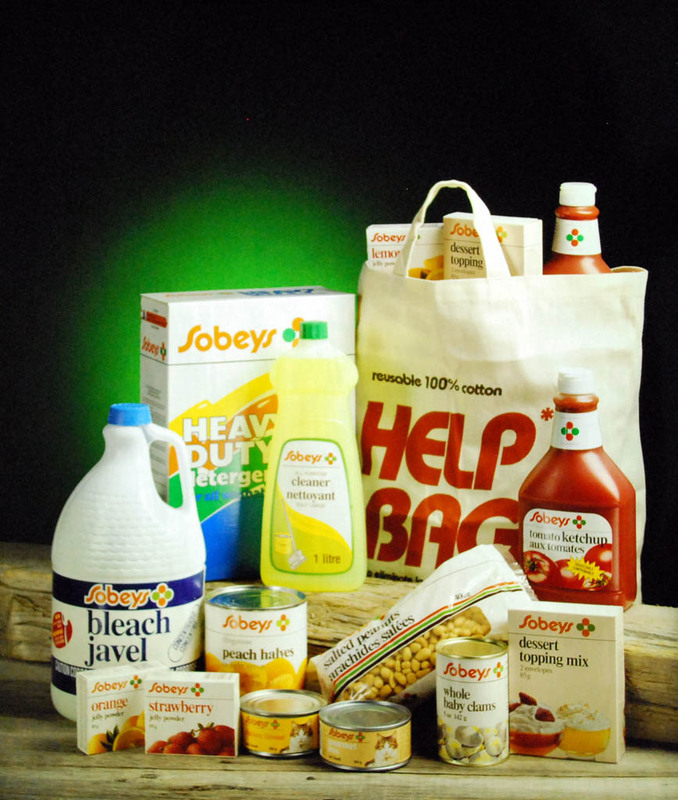 Sobeys has about 250 private label items all of which rival national brands in quality. Wayne Gretzky is traded from Edmonton to Los Angeles. The new National Gallery of Canada is officially opened in Ottawa. Ethel Dorothy Blondin-Andrew, member of the Dene Nation, is the first Indigenous woman elected to the House of Commons. 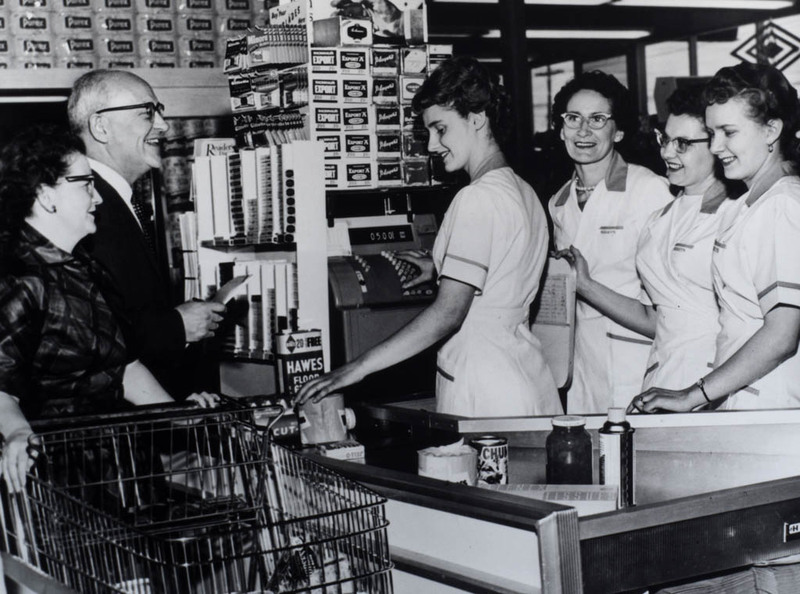 Lawtons grows to 58 pharmacies in the Maritimes and Newfoundland. Yukon MP Audrey McLaughlin is chosen leader of the NDP and is the first woman to lead a national Canadian political party. A shooting rampage at Ecole Polytechnique at the Universite de Montreal engineering school kills 14 women and injures another 14 people, elevating issues like gender-based violence and misogyny. 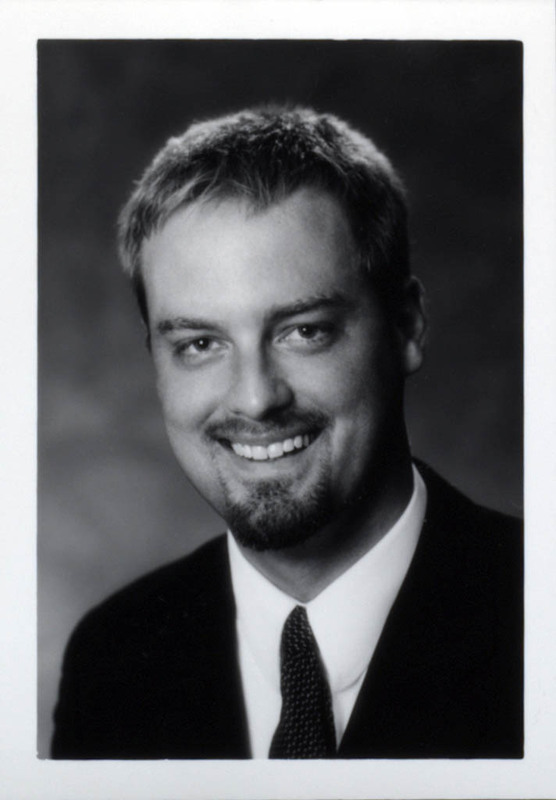 Rob Sobey, son of Donald and Beth, joins the company in the Store Manager Training Program. 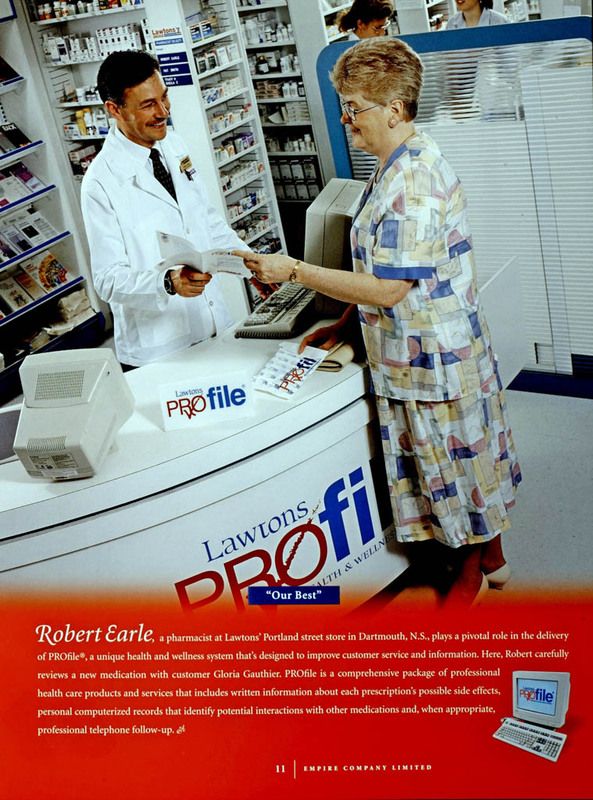 He climbs the ladder spending his last eight years as CEO and President of Lawtons Drugs. His uncle, Bill, dies. In the House of Commons, the federal government introduces legislation to impose its controversial Goods and Services Tax (GST). 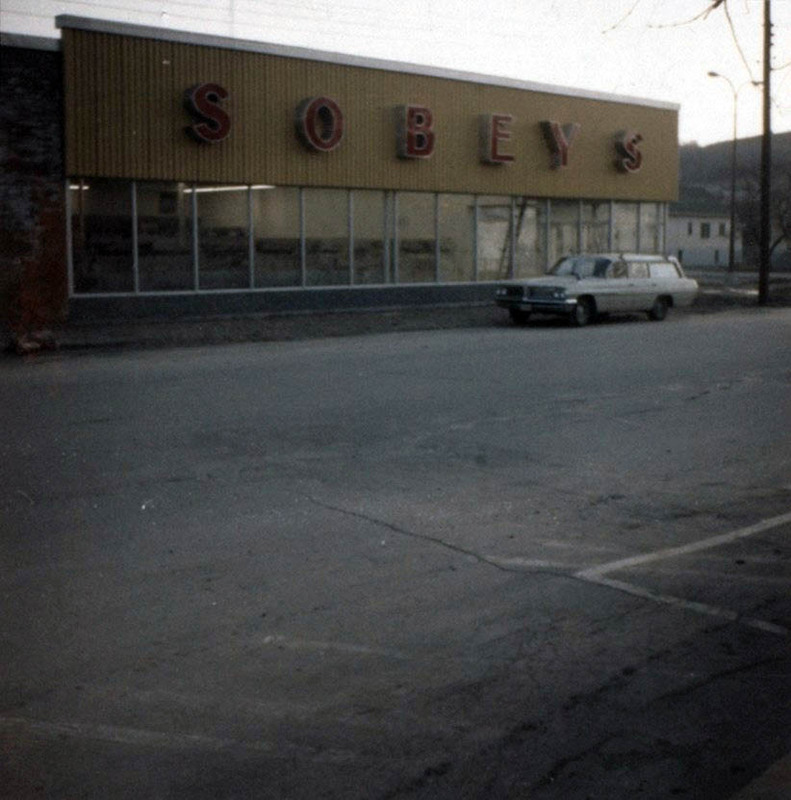 “For three generations my family has operated a business based on the same philosophy as Sobeys. 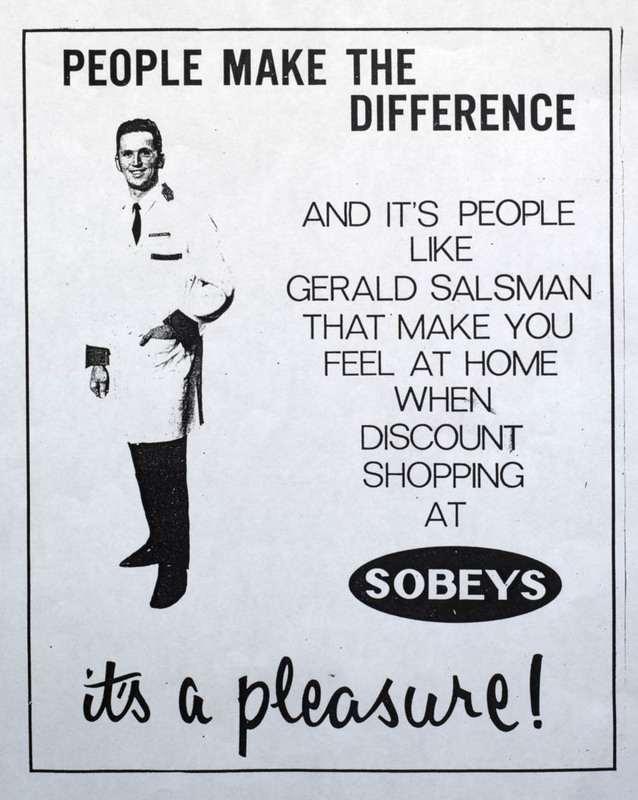 Treat people the way you would like to be treated,” Jack Calbeck says of the sale of his seven family-owned, Ontario supermarkets to Sobeys. Social Credit leader Rita Johnston is sworn in as B.C.’s 29th premier, becoming the country’s first female premier. 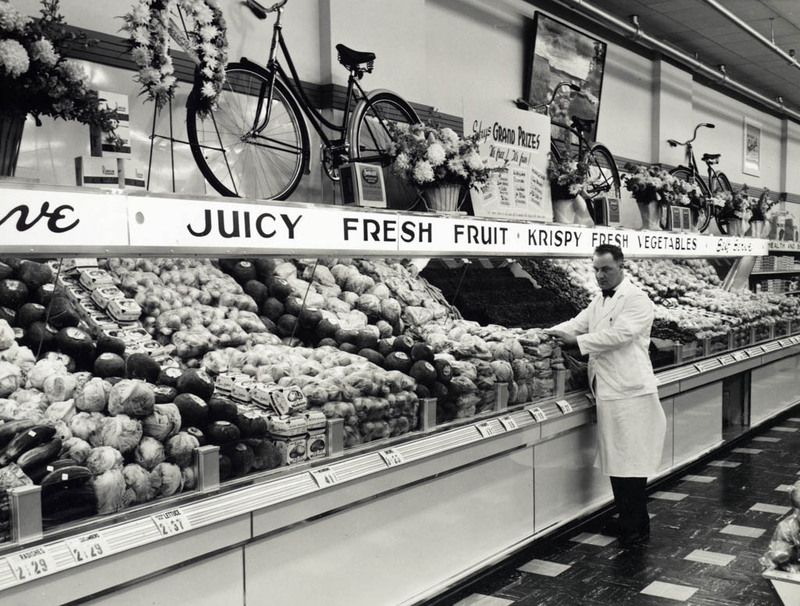 Thrifty Foods provides customers with the largest selection of Certified Organic products in B.C., with more than 70 varieties of fruit and vegetables. 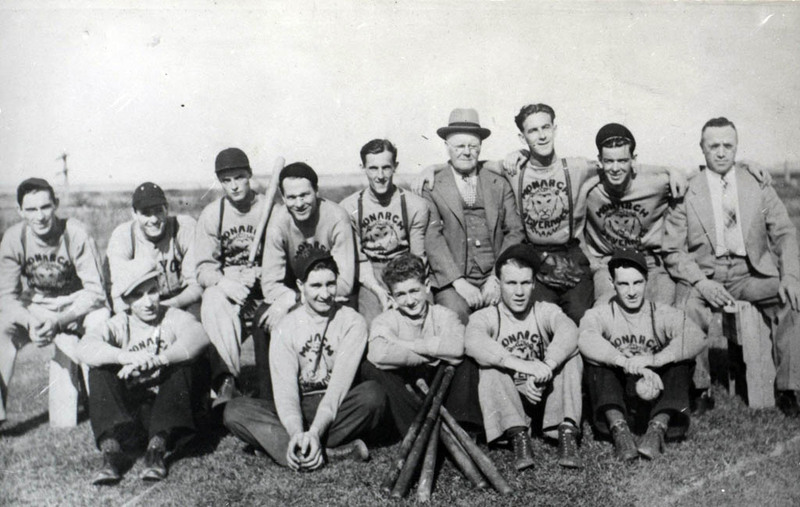 The Toronto Blue Jays become the first team outside the U.S. to win the World Series. Canadian neurologist and clinical science researcher, Dr. Roberta Bondar, blasts into space aboard the U.S. space shuttle Discovery to become Canada's first female astronaut. 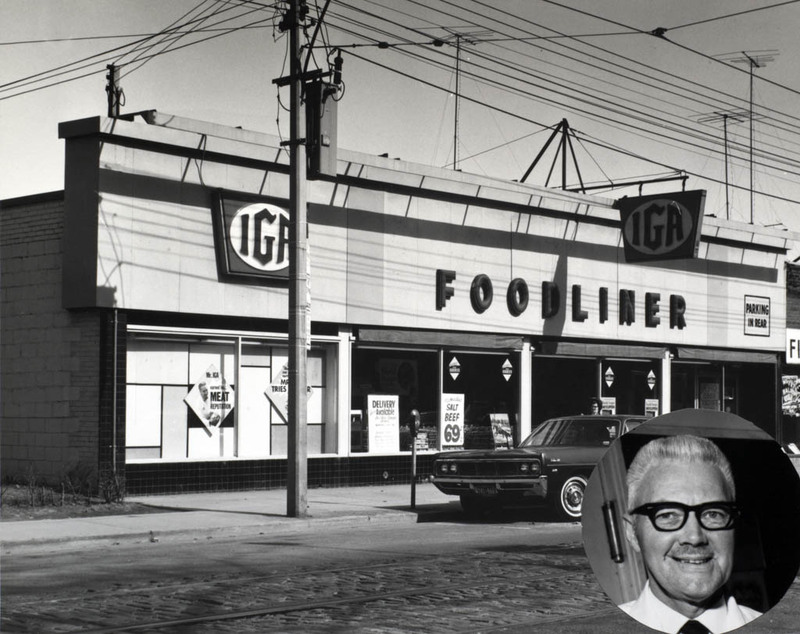 The Oshawa Group, founded by the Wolfe family, completes purchase of IGA stores in Quebec, Ontario and Alberta, and is now sole supplier of IGA stores in every province except B.C. The Ray D. Wolfe Emergency Admissions Unit at Mount Sinai Hospital is dedicated. Brian Mulroney resigns and is succeeded by Kim Campbell, Canada’s first female prime minister, who loses the election to Jean Chrétien’s Liberals. The Nunavut Act establishes the new territory and its government. Lawtons is awarded the Pharmacy Practice Commitment to Care Award. At Lillehammer, Norway, Myriam Bédard becomes the first Canadian woman to win two Olympic gold medals and the first North American athlete to win gold in an Olympic biathlon event. Oshawa’s now massive food service operations are consolidated with the launch of SERCA Foodservices Inc., while the quality Our Compliments brand is launched in Hudon et Deaudelin stores in Quebec. Neil Young is inducted into the Rock and Roll Hall of Fame. The CBC drops Front Page Challenge, which had been on the air since 1957. In Calgary, Christine Silverberg becomes the first woman police chief of a major Canadian city. Québec holds its second sovereignty referendum in 15 years. The “"no"” side wins with 50.6 per cent. 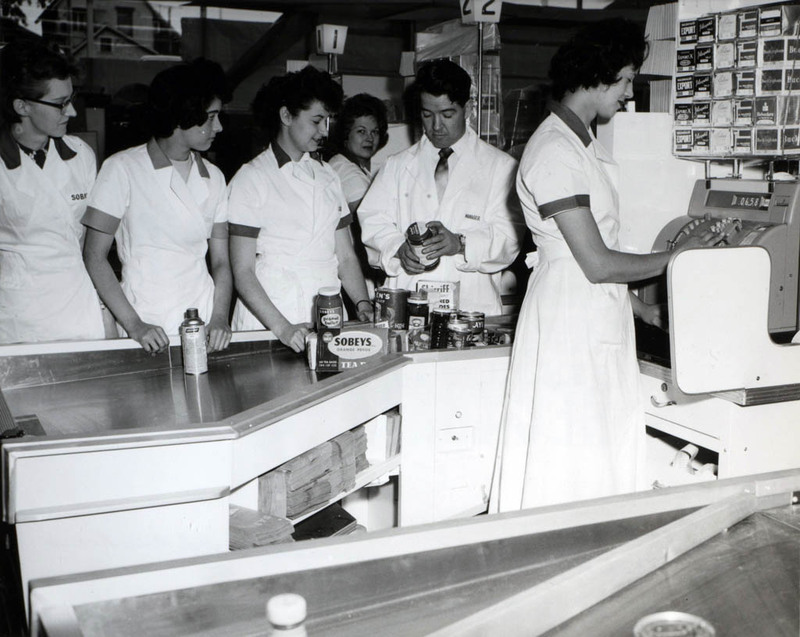 Sobeys and Lawtons initiate a drug insurance plan for all Sobeys group employees. The plan is so successful it has been adopted by other businesses in the Atlantic region. 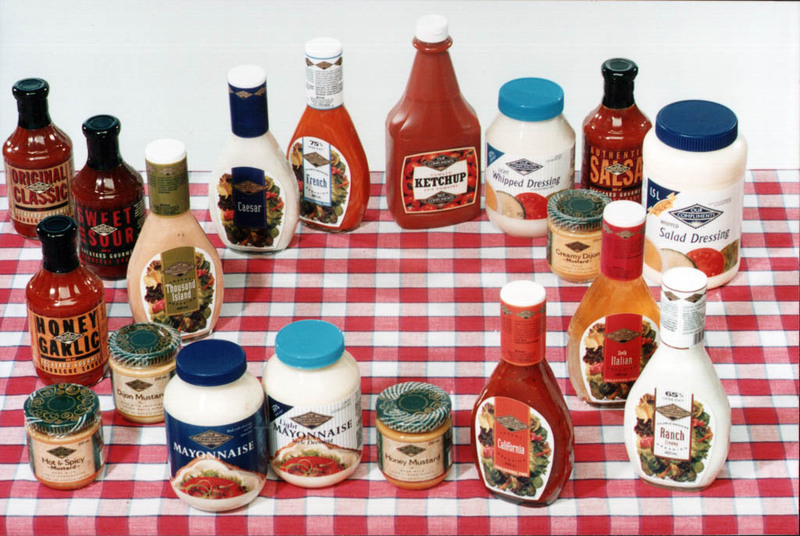 Safeway select brands are introduced. The first national Black History Month is celebrated in February. Canada’s population hits 30 million. Donovan Bailey sets a new 100-metre world record and earns gold at the Atlanta Olympics. 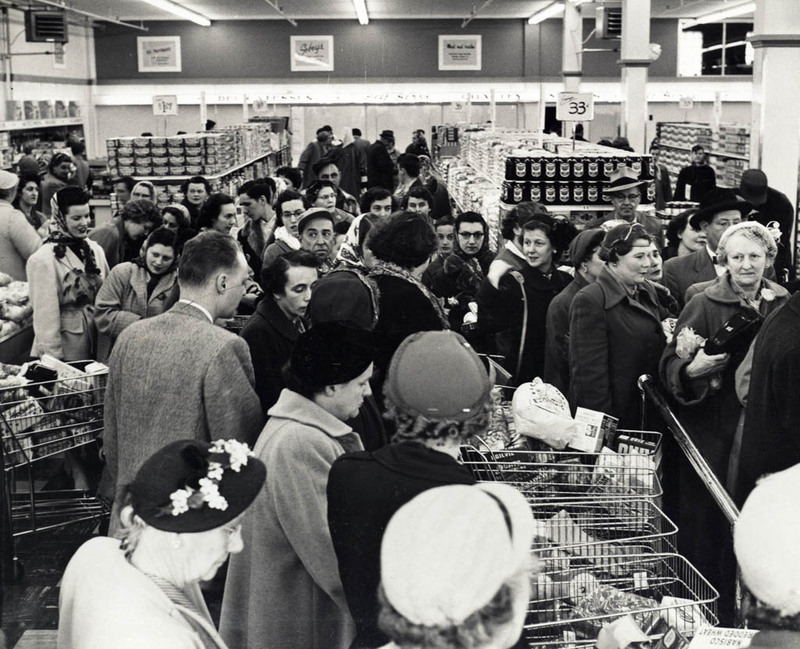 Sobeys commitment to low-cost, nutritious, high-quality food is reflected in its first Price Check store, which opens in Sudbury. Within a year, 17 more outlets are operating. David Sobey is appointed to the Order of Canada. StatsCan reports that the wage gap between women and men had narrowed to an average of 73%. 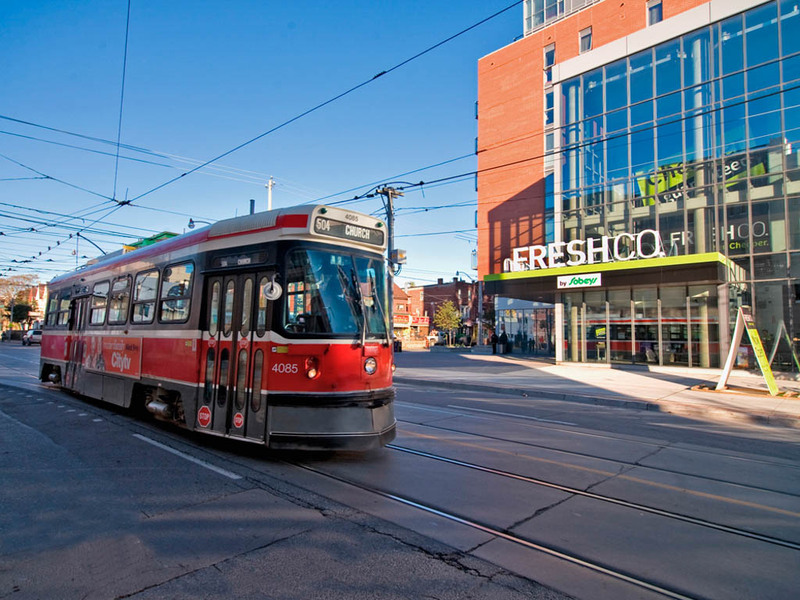 Oshawa is the first food service company operating in all 10 provinces. 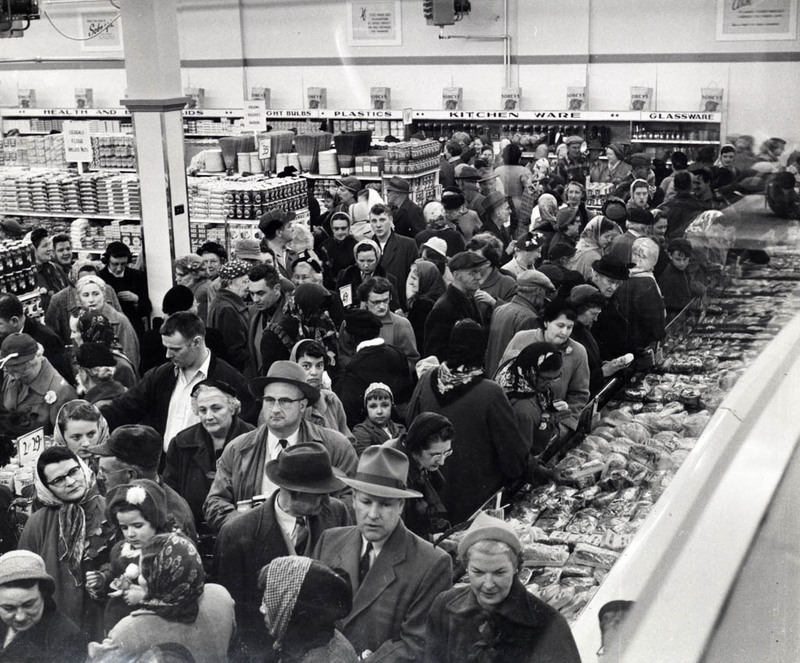 The first online grocery service in Canada, the IGA Cybermarket, is initiated by Hudon et Deaudelin in Quebec. Sandra Schmirler and her rink of Jan Betker, Joan McCusker and Marcia Gudereit captures the first women's Olympic gold medal in curling. The team dominated the sport in the 1990s, winning three Canadian championships and three world titles. 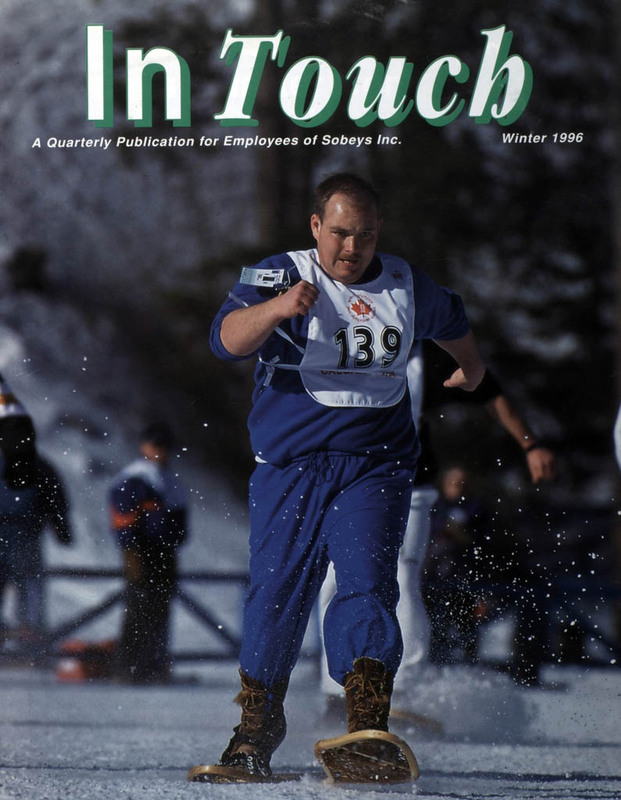 Schmirler succumbed to cancer in 2000. Sobeys buys Agora, formerly Oshawa Foods. 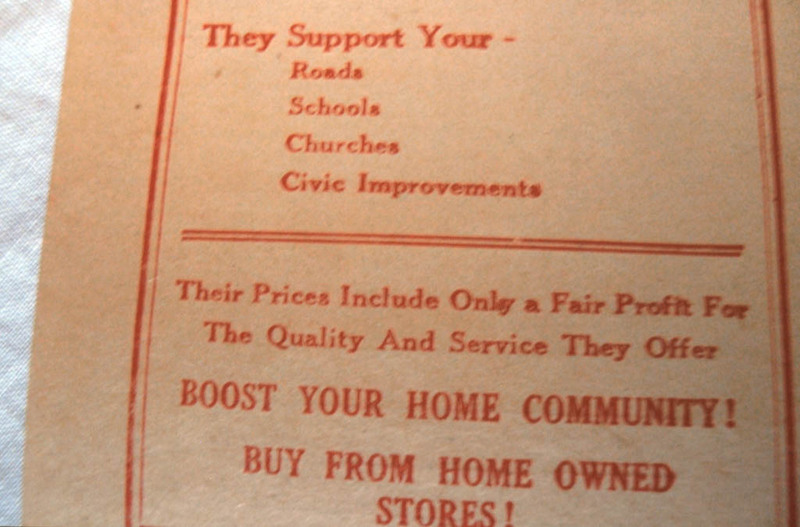 Both companies have long histories of family ownership. 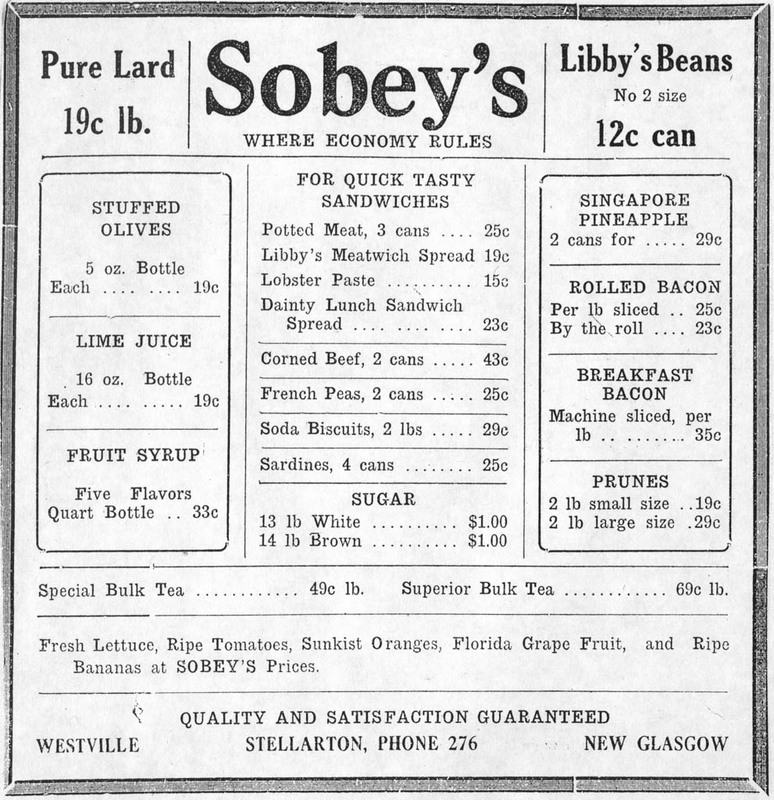 Sobeys becomes the second largest food distributor in Canada, with operations from Newfoundland to B.C. 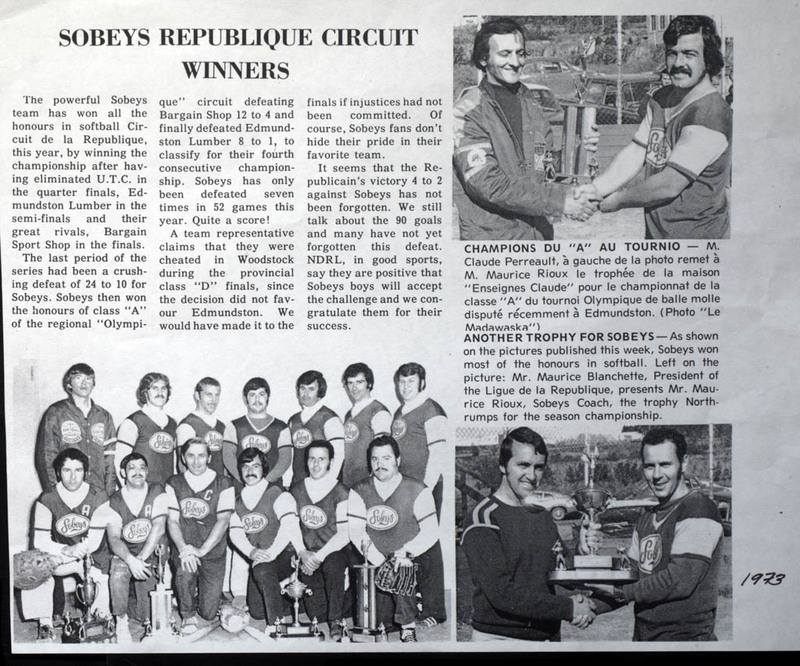 The Sobeys Quebec division grows significantly. Three Canadian women win Grammys: Céline Dion (Best Female Pop Vocal Performance, Record of the Year), Alanis Morissette (Best Female Rock Vocal Performance, Best Rock Song) and Shania Twain (Best Female Country Vocal Performance, Best Country Song). 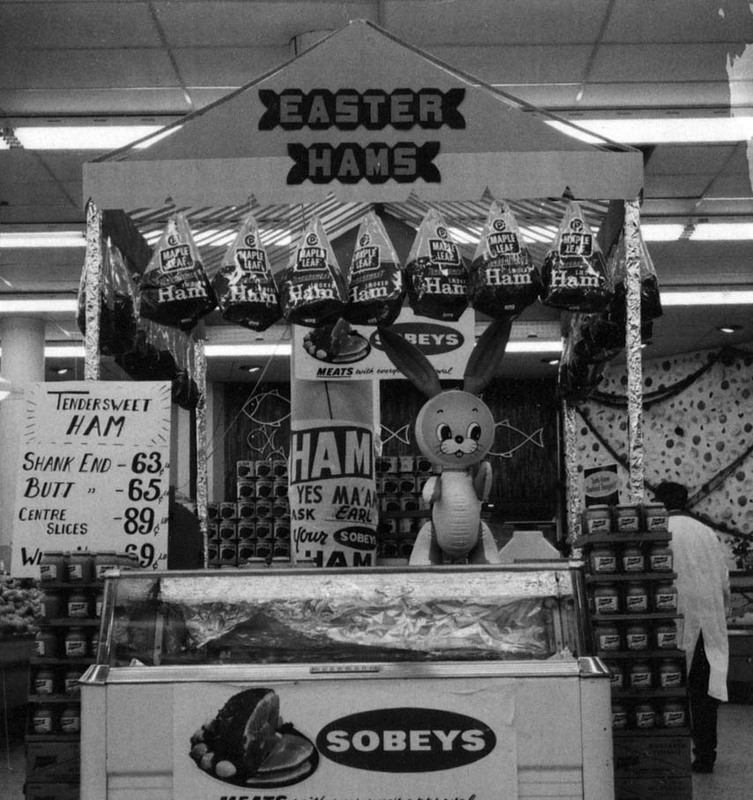 Sobeys has 1,392 stores (corporate and franchised); 900 are supermarkets in 10 provinces. 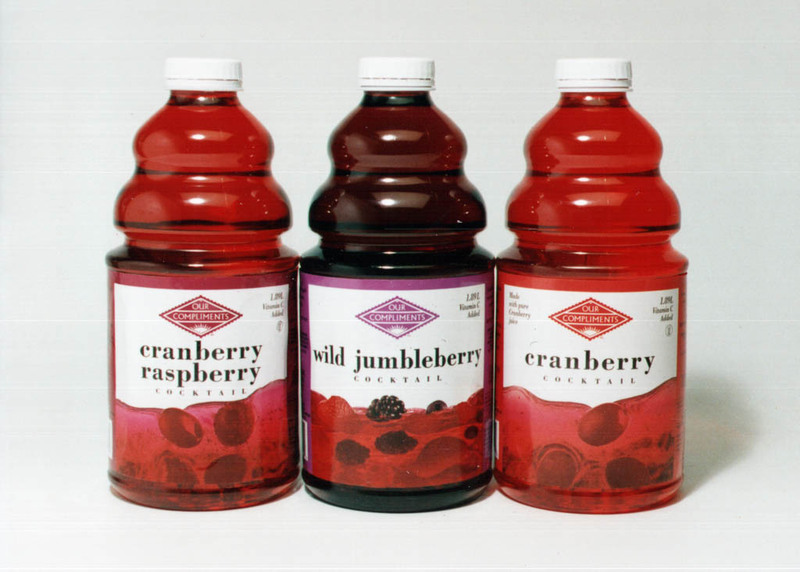 The company has thousands of wholesale customers and is the country’s largest and only coast-to-coast foodservice operation. 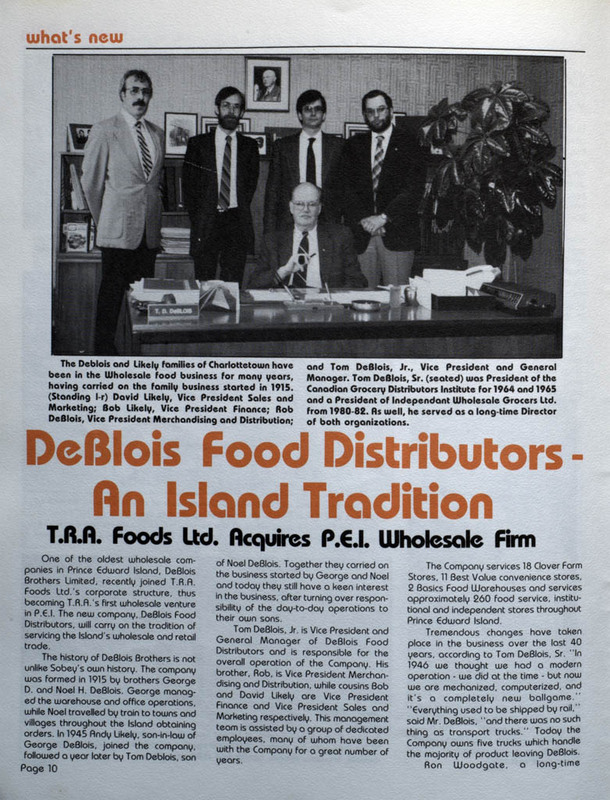 Built on the rich heritage of two of the largest food distribution companies in Canada – Sobeys and Oshawa – the company employs 32,000 people across the country. 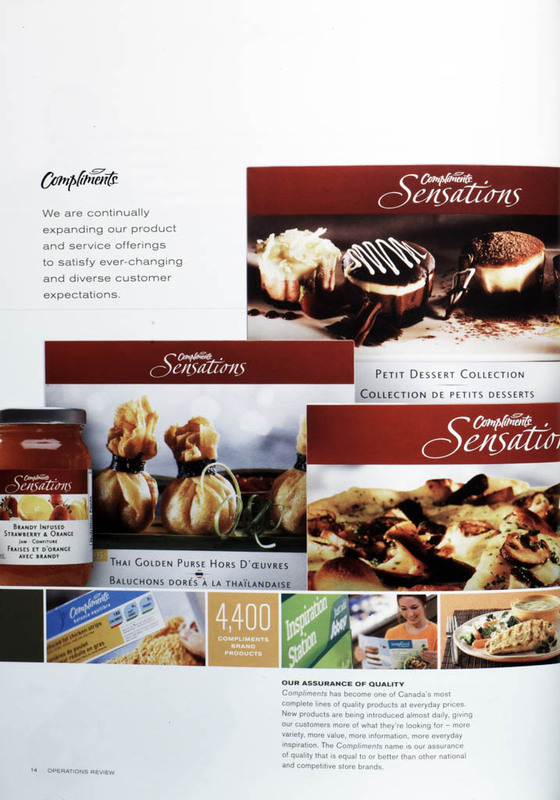 Sobeys chooses the IGA private labels “Our Compliments” and “Smart Choice” as brand names for private label products. The first female Chief Justice of Canada, the Right Honourable Beverley McLachlin, is appointed by Prime Minister Chretien. McLachlin is the longest serving chief justice in Canadian history. Pierre Trudeau dies in Montreal. 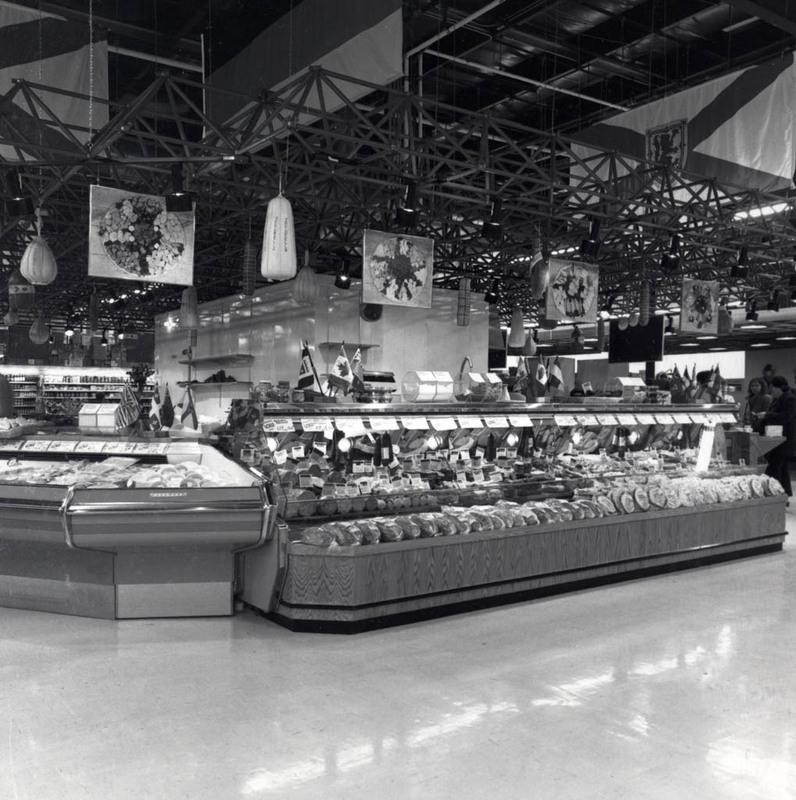 Drawing on the vast experience and expertise of employees who have served Quebec stores for years, Sobeys Quebec now includes 238 IGA stores, as well as 782 under such banners as Marché Bonichoix; Omni; Boni-Soir; Le Dépanneur; Sertard; Voisin and Les Marchés Tradition. 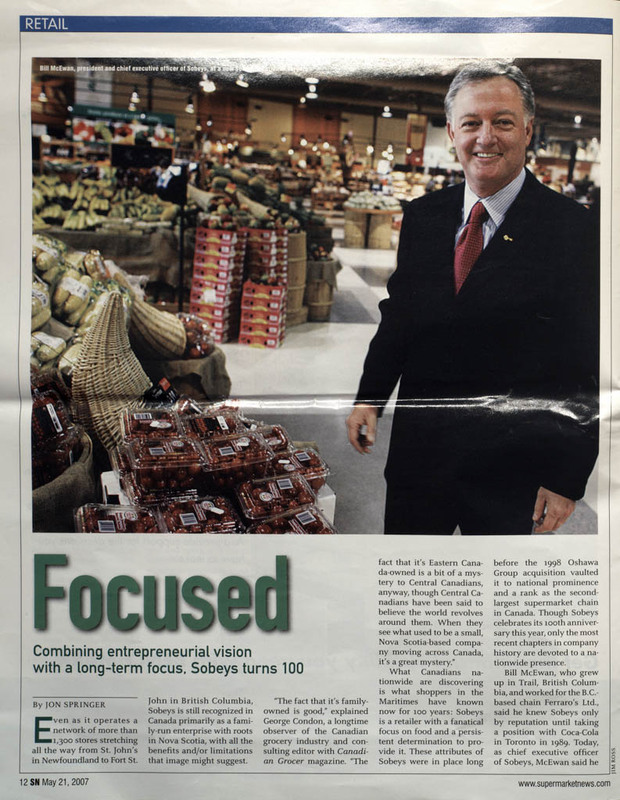 John Robert Sobey, son of Harold, retires as Sobeys President and CEO. Alistair MacLeod is named winner of the International IMPAC Dublin Literary Award for his novel No Great Mischief, set in Cape Breton. Sobeys is the presenting sponsor of the annual DND Family Days at CFB Stadacona as a thank-you to the military for their service. It is a two-day festival with events for all ages. Canada's men’s hockey team ends a 50-year dry spell with an Olympic gold medal at Salt Lake City. The women’s team also wins gold. Jean Augustine became Canada’s first black female cabinet minister. The Canada Council Art Bank purchases 71 works by aboriginal artists to celebrate its 30th anniversary. 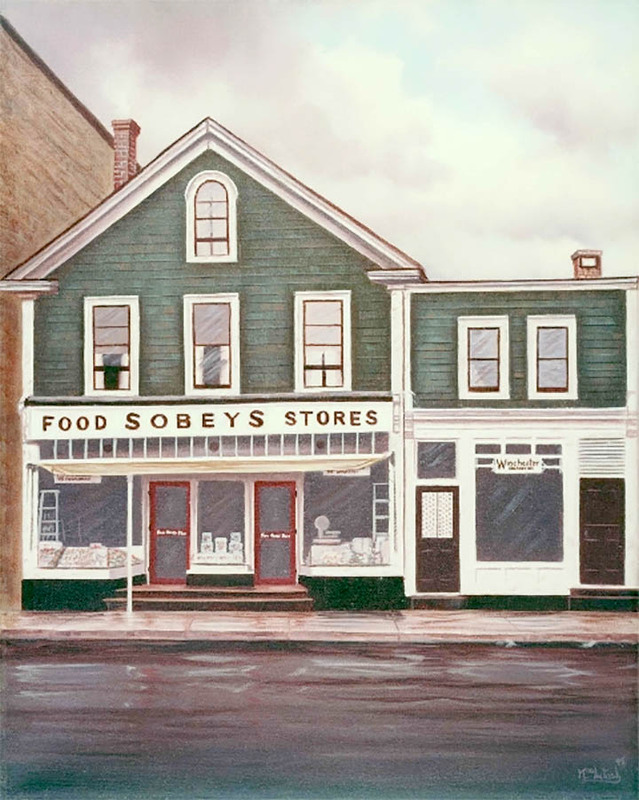 The Sobey Art Foundation establishes the Sobey Art Award, “Canada’s pre-eminent award for contemporary Canadian art.” The annual prize is given to an artist age 40 or under. 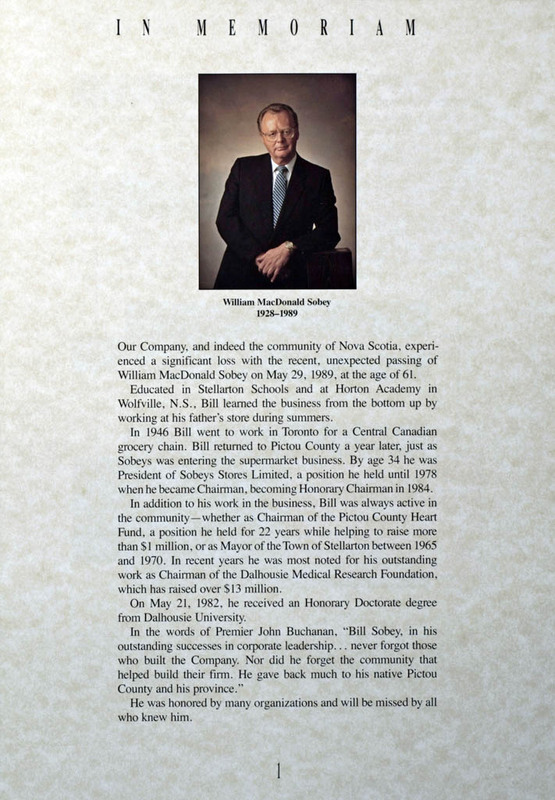 Bill (posthumously), David, and Donald Sobey are elected to the Nova Scotia Business Hall of Fame. The Montreal Expos play their last home game before the team is moved to Washington, D.C..
Bev Oda becomes the first Japanese-Canadian Member of Parliament. 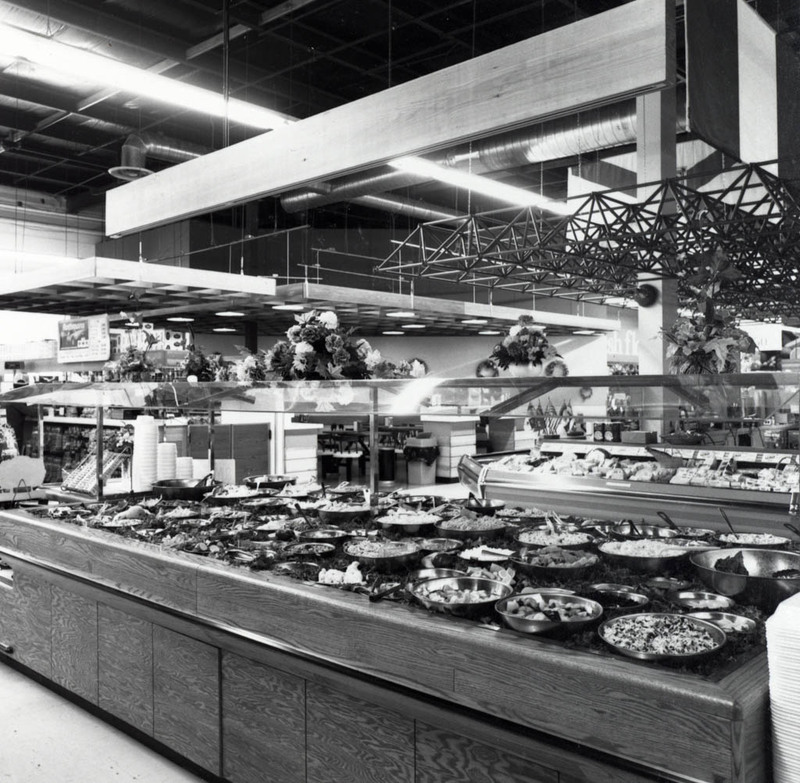 Commisso’s, an Ontario food service company with a solid reputation for quality products, friendly people and low prices, is a perfect fit for the Sobeys brand. 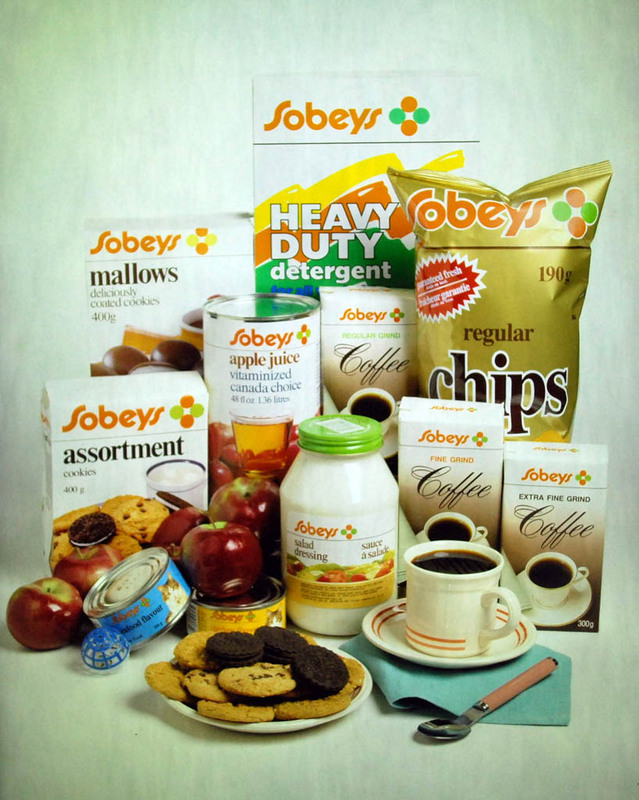 Sobeys acquires the company, its 22 stores, and wholesale and distribution channels. 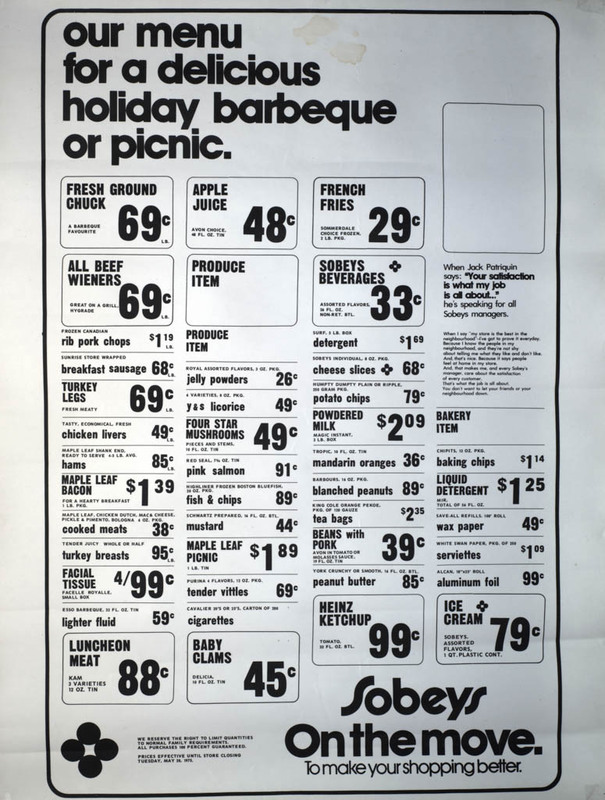 The stores operate under the Sobeys or Price Chopper banner. Haitian-born Michaëlle Jean is Canada’s Governor General. Steve Nash is the first Canadian to win the Maurice Podoloff Trophy as the NBA’s Most Valuable Player. The Victoria native would win it again the following season. 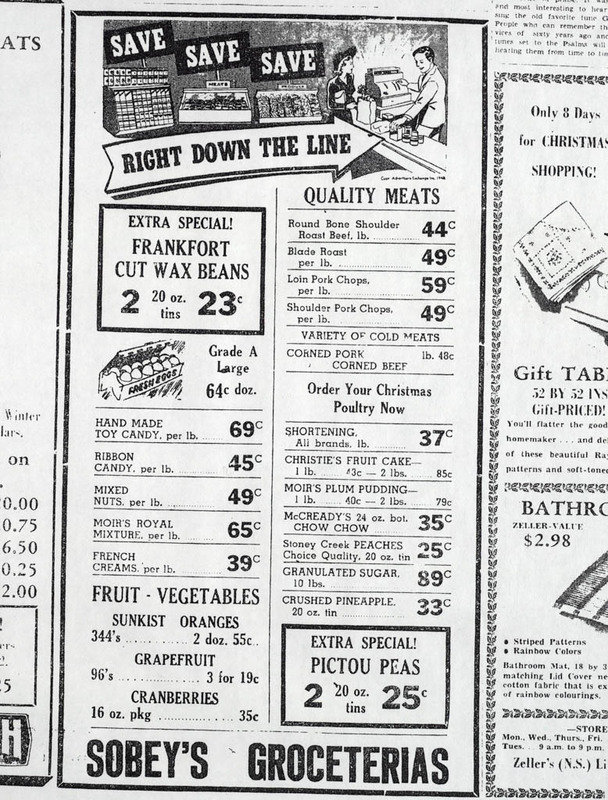 Thrifty partners with B.C. Hydro to bring power smart initiatives to its stores and takes a leadership role in corporate environmental responsibility. The Conservative Party, led by Stephen Harper, defeats Paul Martin’s Liberals, ending that party’s 13-year reign. Canada’s women’’s hockey team defends its Olympic gold medal. Brad Gushue’s Newfoundland rink wins Canada’'s first gold medal in men’s curling. 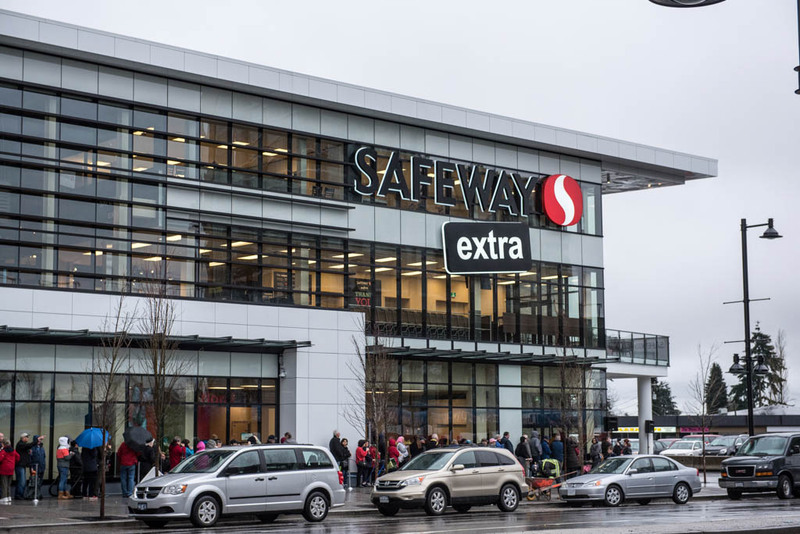 Thrifty’s next step in environmental stewardship is a big one – the first carbon neutral grocery store opens in Coquitlam, B.C. By planting 1,776 trees in provincial parks, the store balances the carbon generated by the store. The Indian Residential Schools Settlement Agreement provides compensation to survivors of residential schools. All survivors received the Common Experience Payment, based on the number of years they attended residential school. Other claims are assessed on a case-by-case basis. A century has passed since J.W. 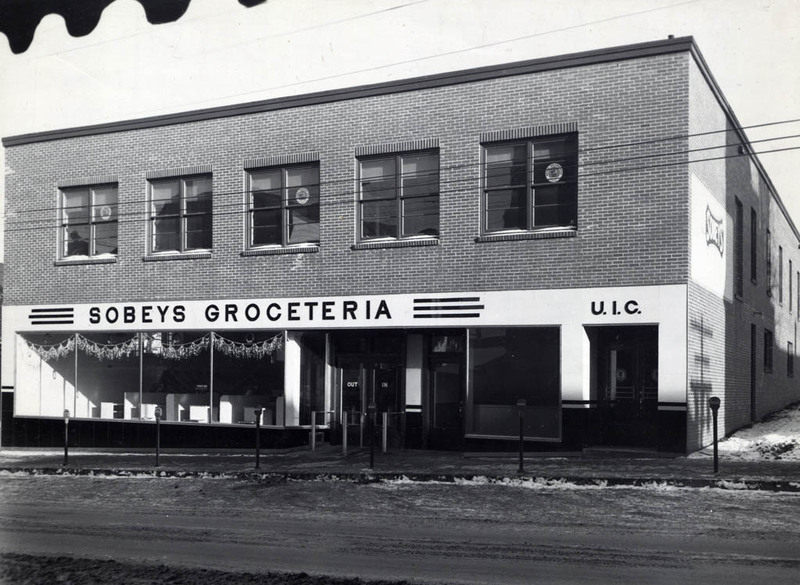 Sobey left the carpentry trade for the meat and later grocery business, and Sobeys is recognized as one of the best work environments in Canada. 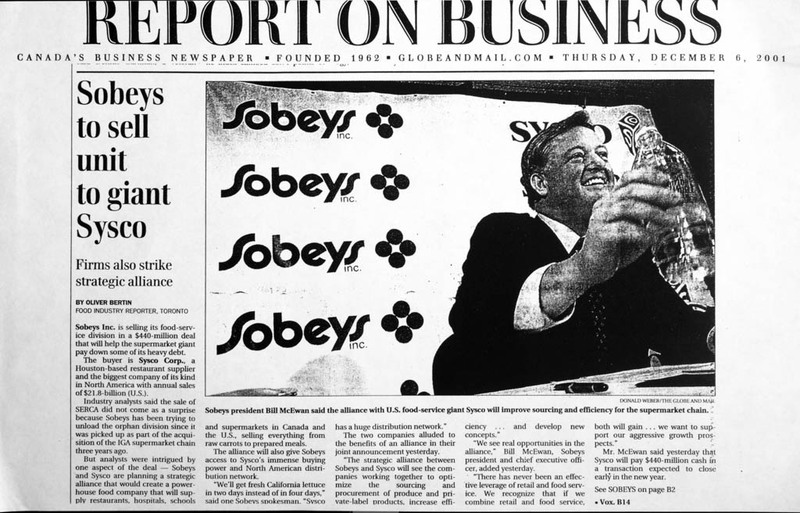 With the acquisition of Thrifty Foods in B.C., the Sobey family of stores numbers more than 1,300, with 95,000 employees. Banners include Sobeys, IGA, Foodland, FreshCo. 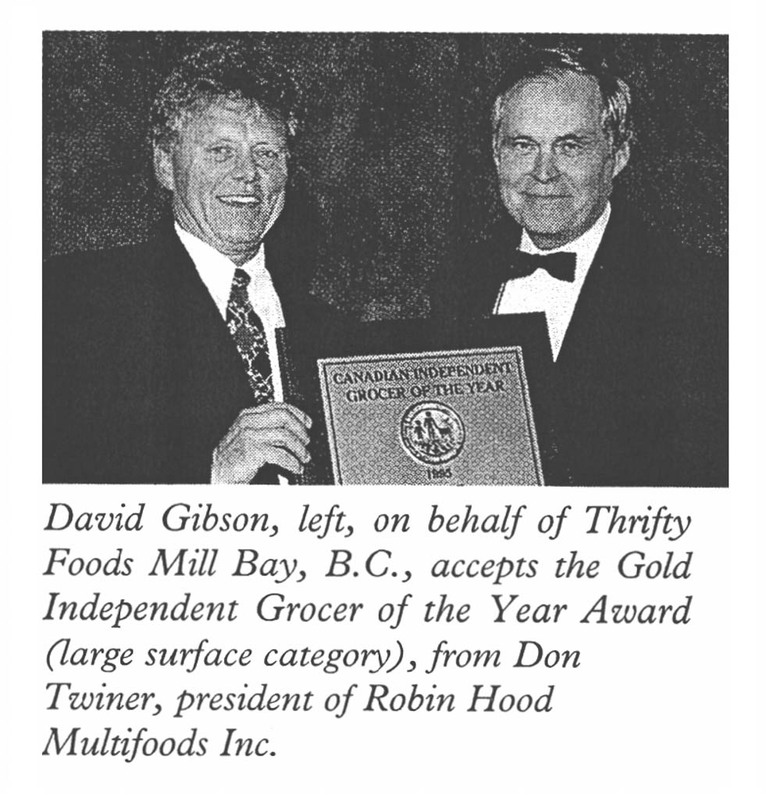 and Thrifty Foods. 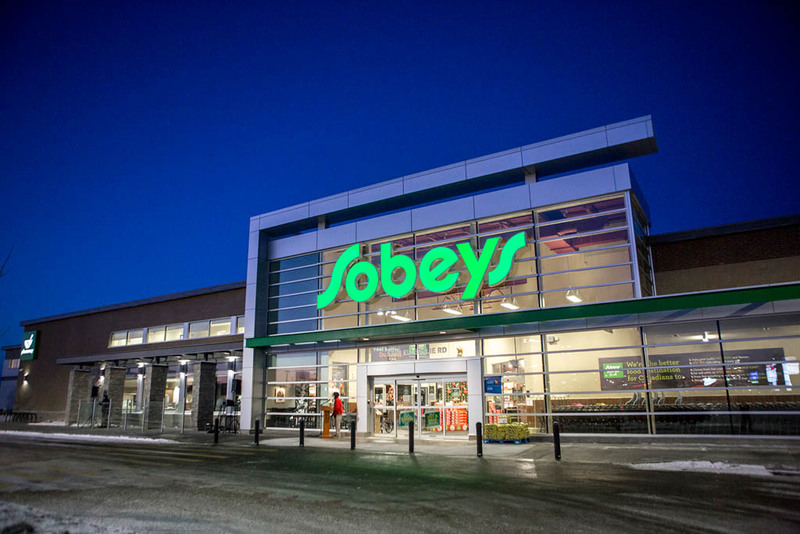 Sobeys adds 25 retail stores, wholesale and distribution assets with the acquisition of ADL, with operations in Quebec and Northern Ontario. 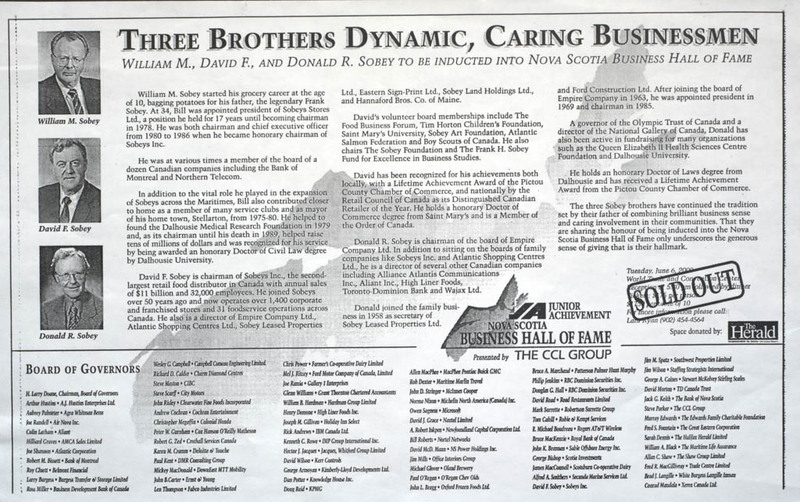 David and Donald Sobey follow in their late father Frank’s footsteps and are inducted in the Canadian Business Hall of Fame. Stephen Harper’s Conservatives win another minority government. Stephane Dion resigns as Liberal leader and is succeeded by Michael Ignatieff. Canada is not immune from the global economic crisis, as unemployment rises and the Loonie drops below $.80 U.S. for the first time since 2005. Sobeys Thrifty Foods banner expands its energy conservation features, and uses 15 to 30 per cent less energy than conventional grocery stores. U.S. President Barack Obama makes his first foreign trip by visiting Ottawa. Martin Brodeur surpasses his idol Patrick Roy's record of 551 wins when he reaches 552 in a game against the Chicago Blackhawks. Ocean Wise seafood provides Thrifty customers with sustainable fish products and helps educate customers about sustainable seafood issues. The opening ceremony of the Vancouver Winter Olympic Games at B.C. Place is attended by a crowd of 60,000. Canada amasses a record 14 gold medals in Vancouver, including both hockey golds. Queen Elizabeth II makes her 22nd visit to Canada. Environment Canada reports the mildest-ever winter. 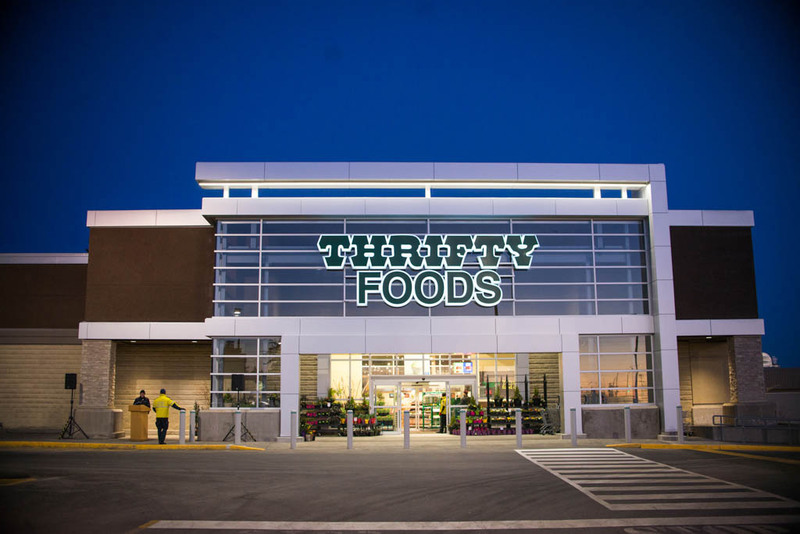 Sobeys announces a $31-million, 150,000-square-foot distribution centre in Victoria, and Thrifty’s opens its sixth store in the lower mainland of B.C. Jack Layton, NDP leader and Leader of the Official Opposition, dies in Toronto. He led the NDP to historic heights, supplanting the Liberals as the official opposition and gaining an unprecedented 59 seats in Québec. 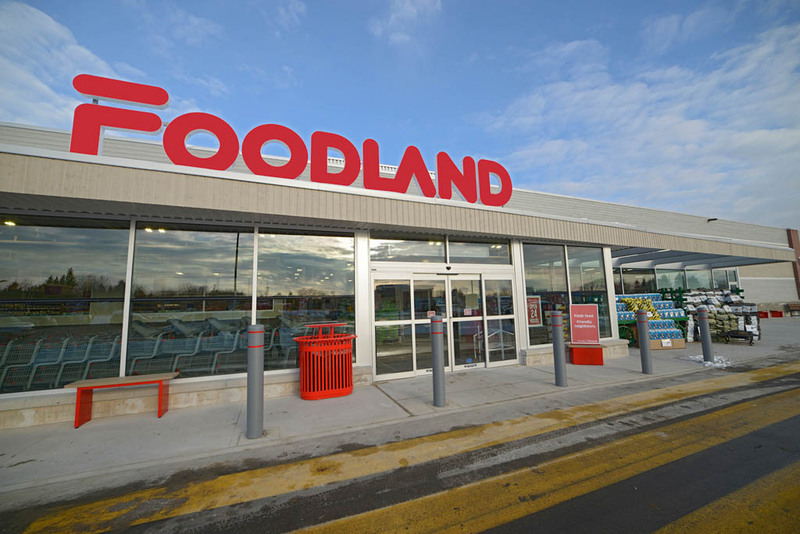 21 Atlantic Sobeys Price Chopper stores are converted to the Foodland Brand. Queen Elizabeth II and Commonwealth countries around the globe celebrate Her Majesty’s 60 years on the Throne. 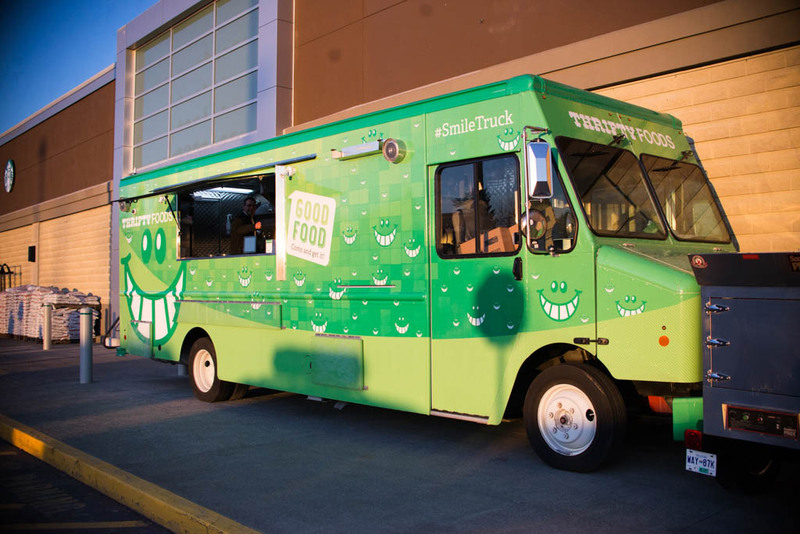 As Thrifty Foods celebrates its 35th anniversary, the new Sobeys LEED standard distribution centre opens in Victoria. Its green features are estimated to save enough power to heat 150 homes a year. Justin Trudeau becomes the leader of the Liberal party, the job his father Pierre held for 16 years. 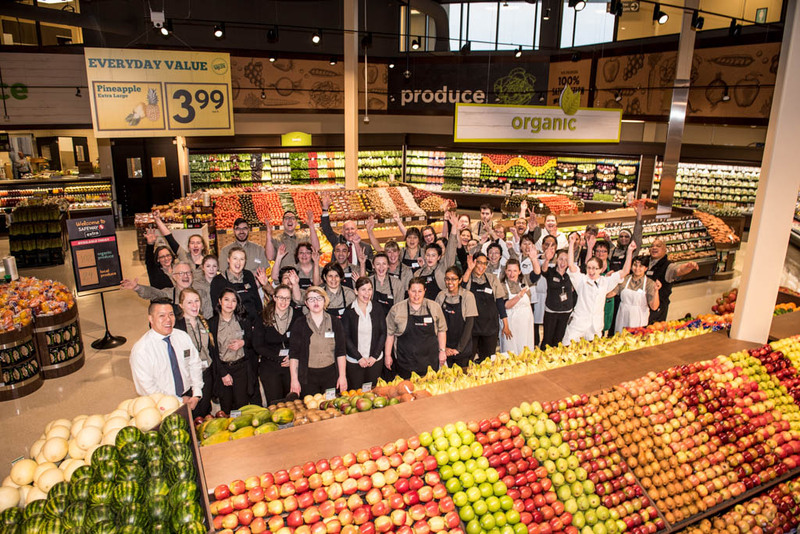 Sobeys purchases Safeway Canada, and adds 213 stores in Western Canada to the national chain. 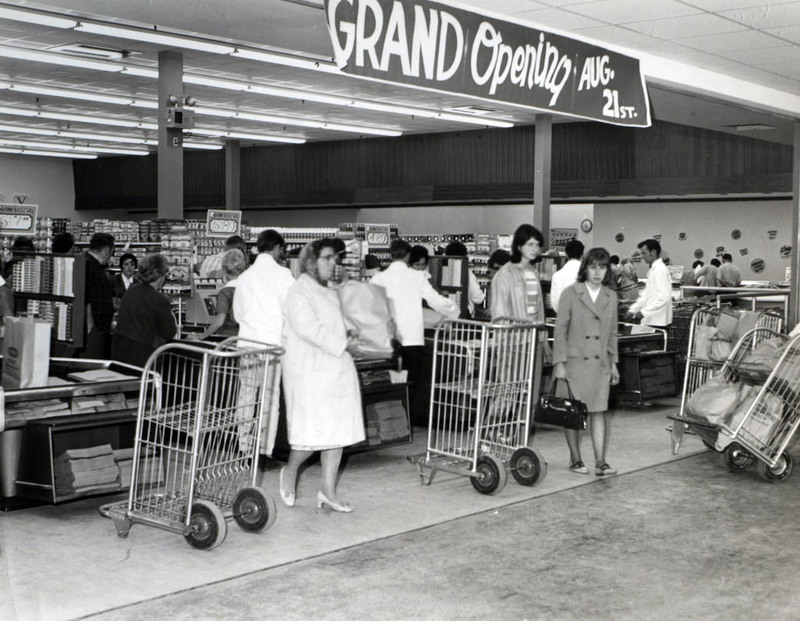 The first Sobeys Extra store opens in Burlington, Ont., designed around a “better food for all” mission. 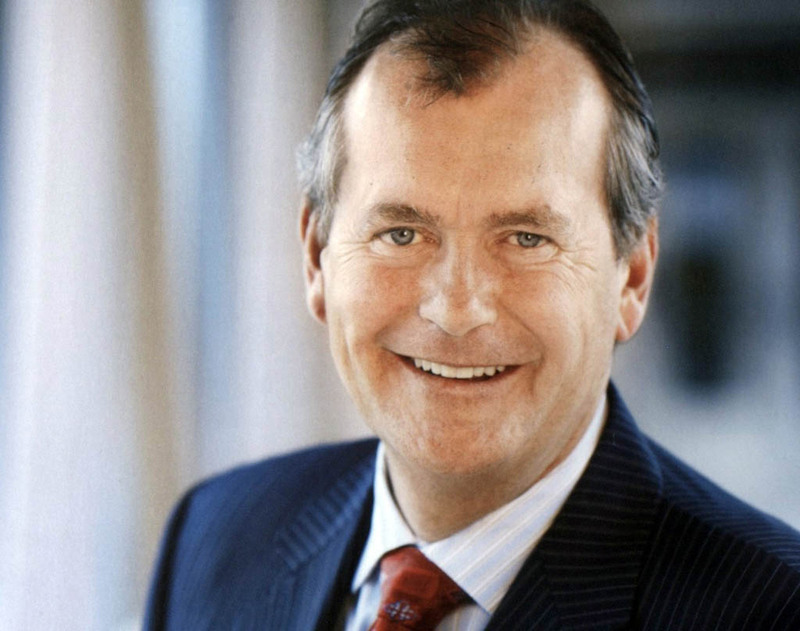 Paul Sobey, David’s son, retires as chairman and CEO of Empire Company. The Canadian Museum for Human Rights is opened by General Governor David Johnston. The first national museum outside of Ottawa — it’s in Winnipeg — the CMHR is designed to examine the universal issue of human rights, with a special focus on human rights in a Canadian context. Rob Sobey, son of Donald and Beth Sobey, retires from executive management after eight years as President and CEO of Lawtons. The move enables him to focus his efforts on philanthropy and governance. Donald Sobey is appointed to the Order of Canada. Voters elect a majority Liberal government and Prime Minister Justin Trudeau, denying the Conservatives a fourth mandate and ending Stephen Harper's nine-year term. 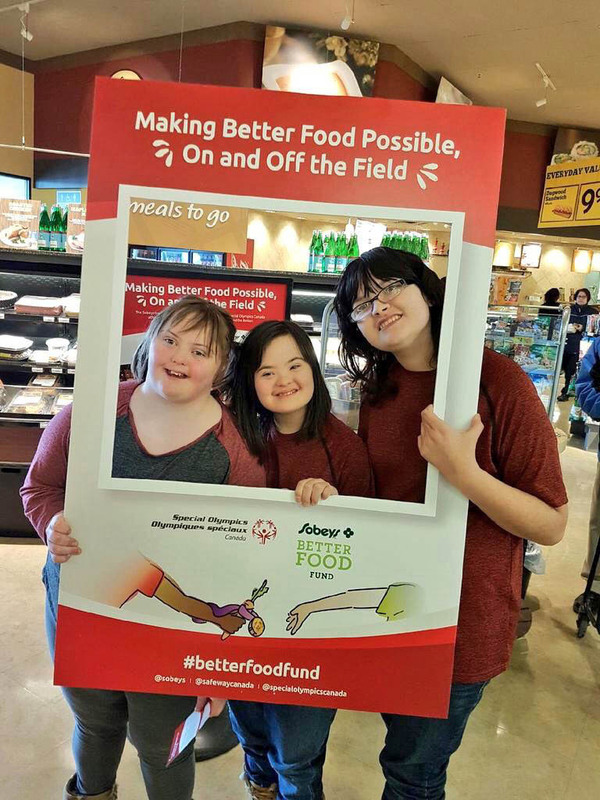 Sobeys Better Food Fund teams up with Special Olympics Canada to make better food available for Special Olympians on and off the field. 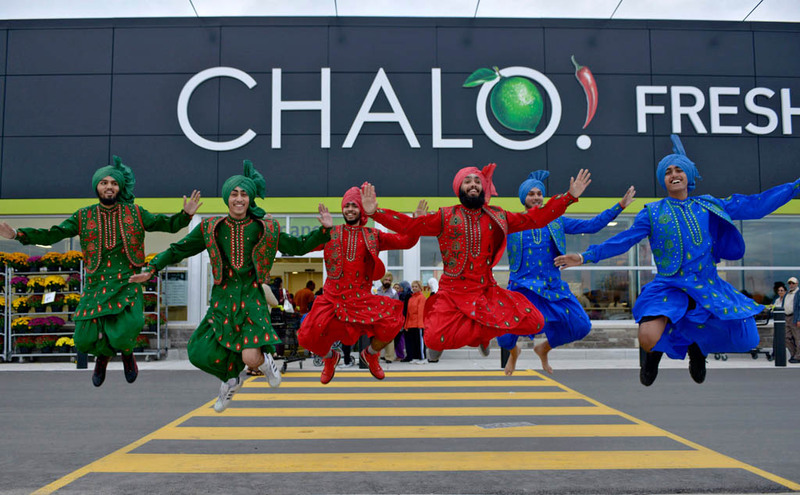 Chalo FreshCo., opens in Brampton, Ont. 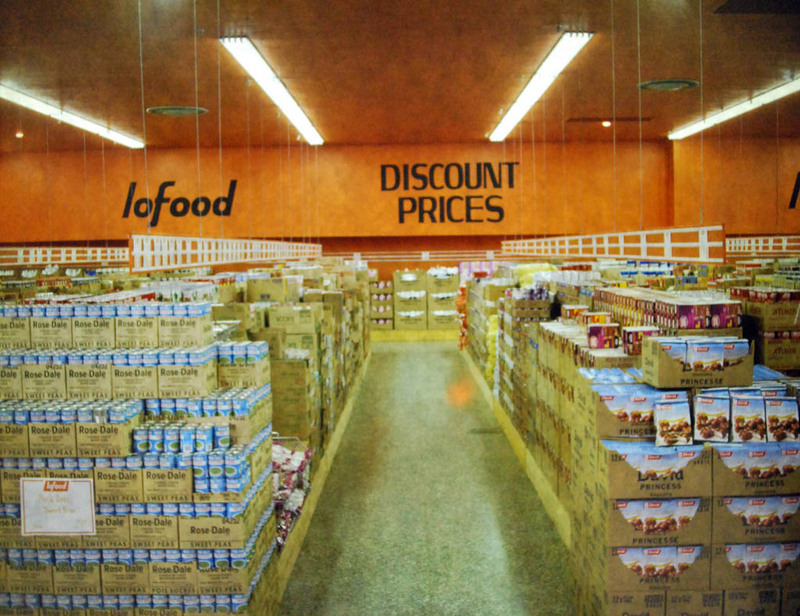 The discount store caters to South Asian cooking. 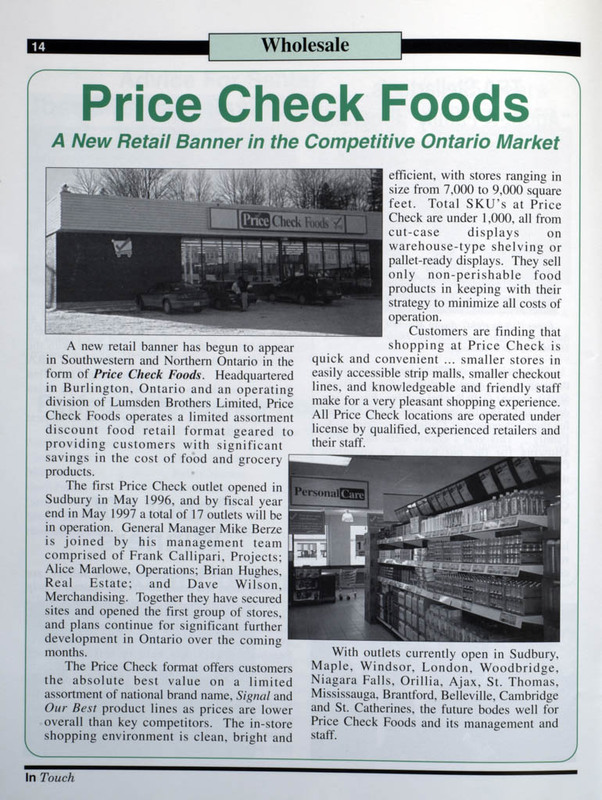 In November, Sobeys buys Pete’s Fine Foods. Canadian poet, novelist, singer and songwriter Leonard Cohen dies in Los Angeles, California, at age 82. Lawrence Hill author of The Book of Negros is inducted into the Order of Canada. Swimmer Penny Oleksiak, 16, becomes the first Canadian to win four medals at a Summer Olympic Games. Christmas 2016, and Sobeys is still supporting local suppliers. 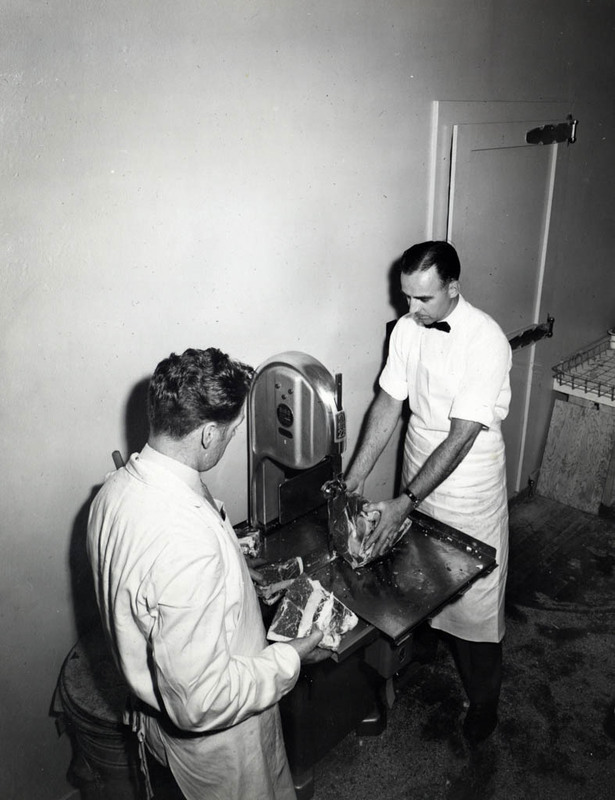 In P.E.I, it buys fresh, grain-fed turkeys from Larkin Brothers. The company commits to buy 80 per cent of beef for P.E.I. 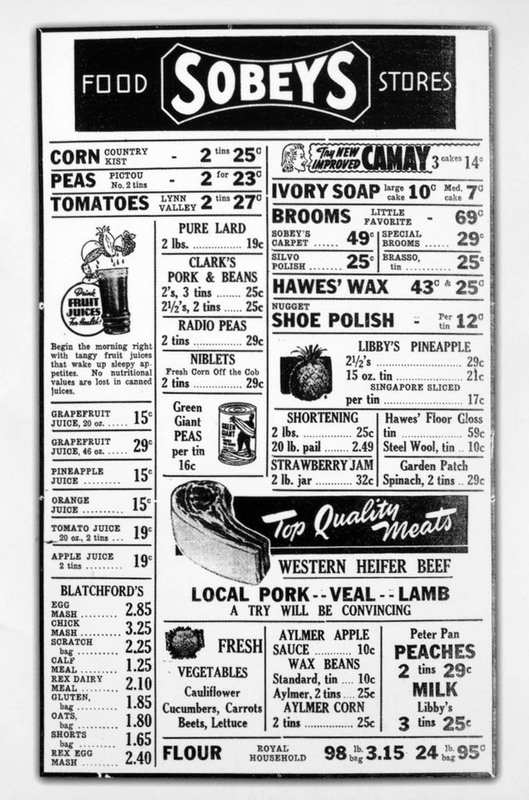 stores from Atlantic Beef Products. Canada celebrates its 150th birthday. It has come a long way since Confederation Day on July 1, 1867, when less than a handful of former British colonies chose to share the same destiny. 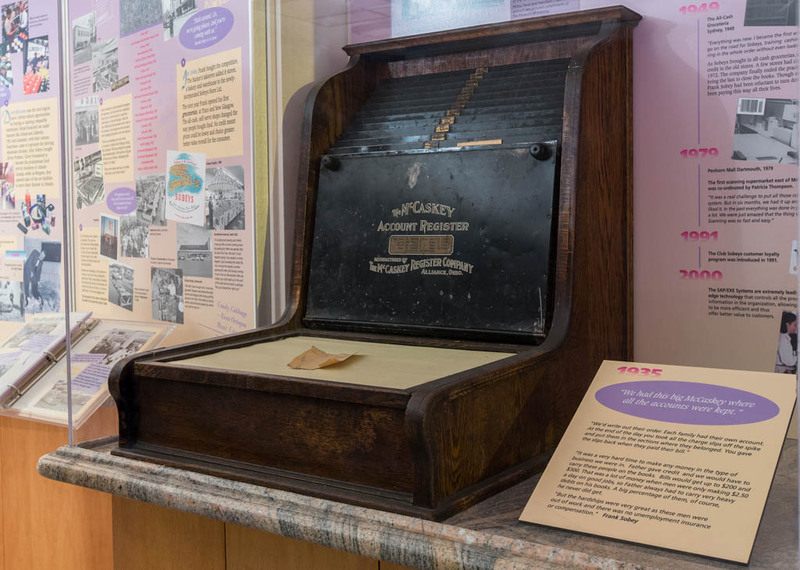 Canada is now a country of 35 million people and the federal government is spending half a billion dollars on events and projects related to the 150th anniversary. Commemorative stamps, coins and banknotes are being issued and Parks Canada is giving away free passes to national parks and historic sites. 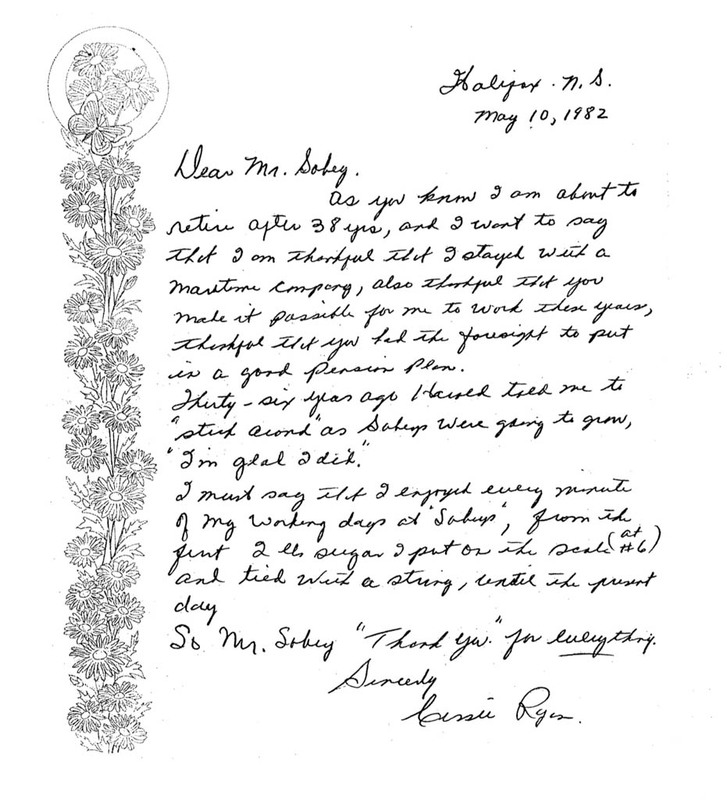 Much has changed in the 110 years since J.W. 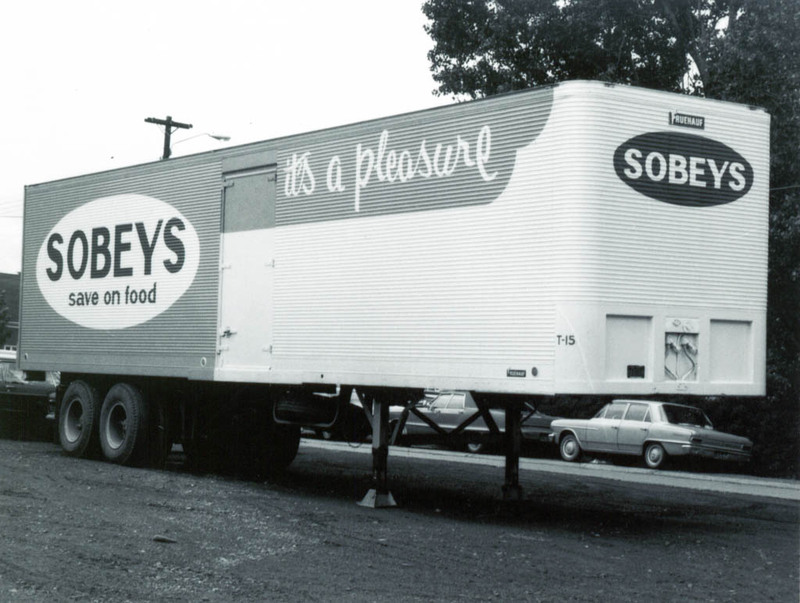 Sobey set out with his wagon, guided by the simple desire to bring quality food to his neighbours. 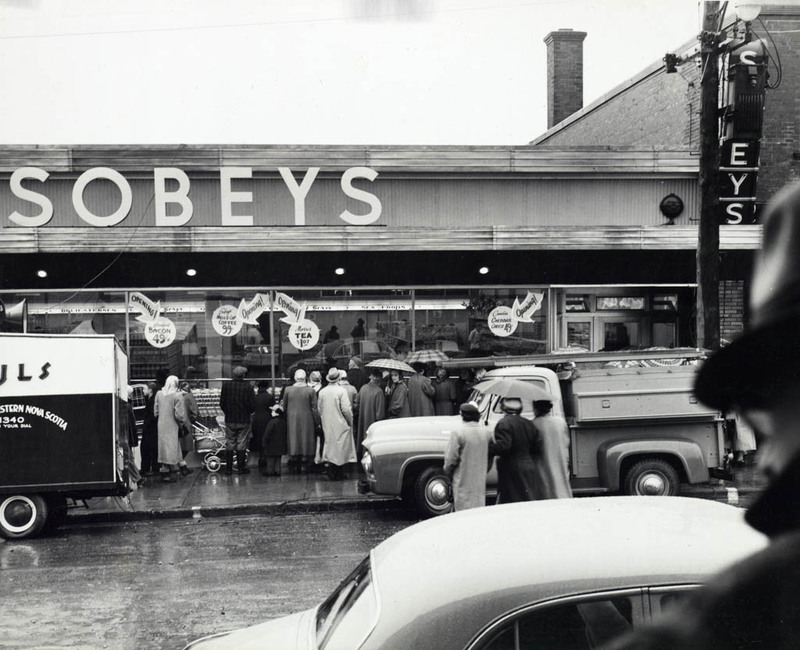 Sobeys has grown and now stretches from coast to coast, bringing variety, quality and innovation to millions of Canadians. But for all that has changed, the guiding principles and values remain the same: commitment to people, local and community. 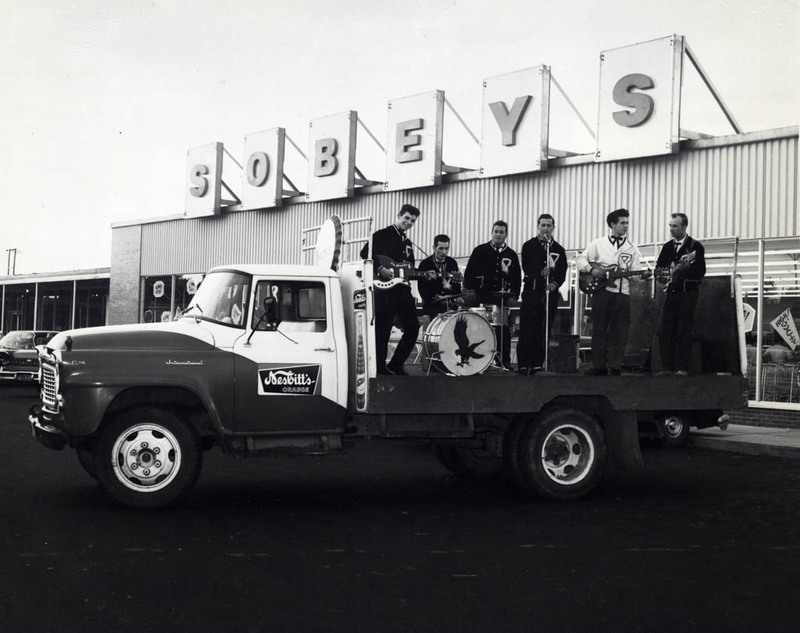 Sobeys is the rare Canadian family business that has not merely survived, but thrived for five generations. It has stayed true to itself and that’s what sets it apart.